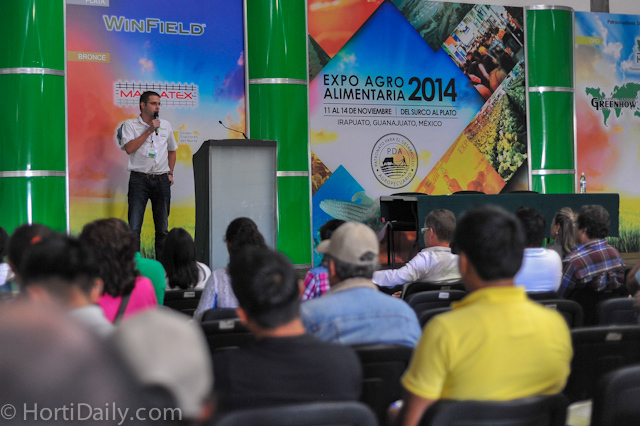 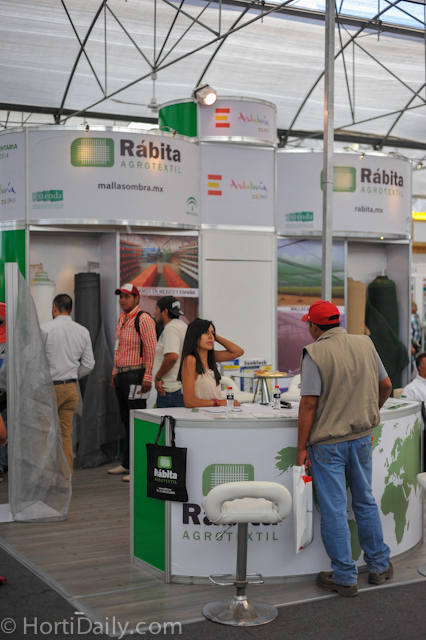 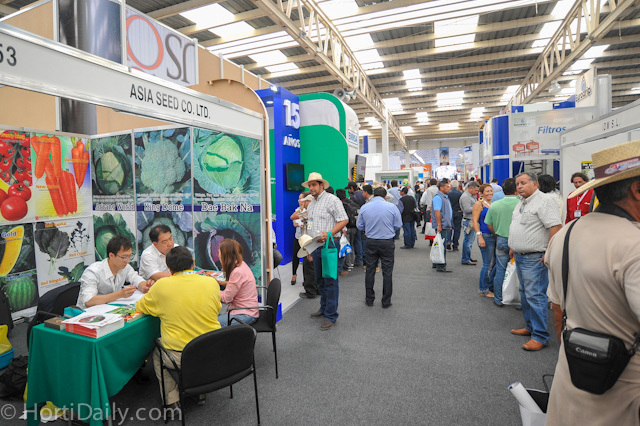 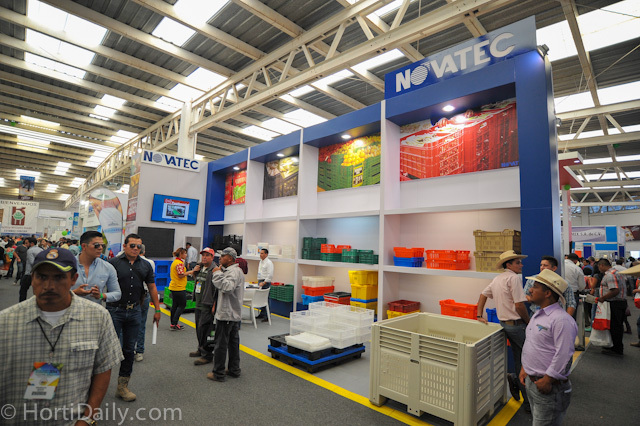 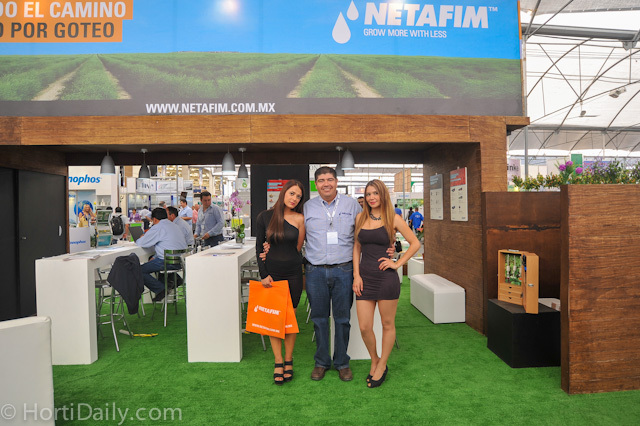 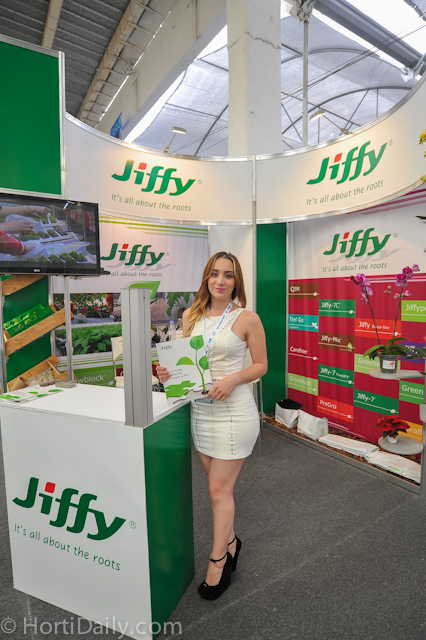 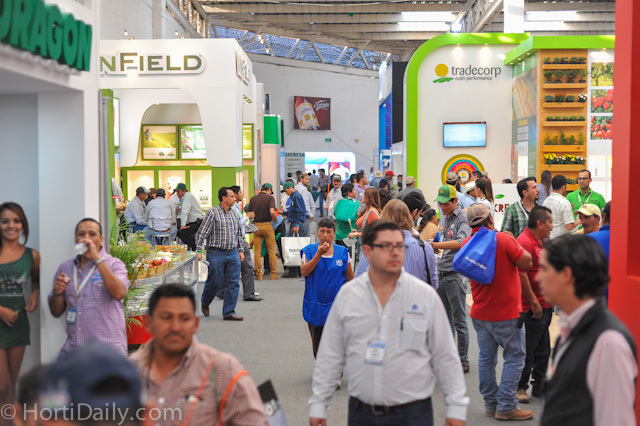 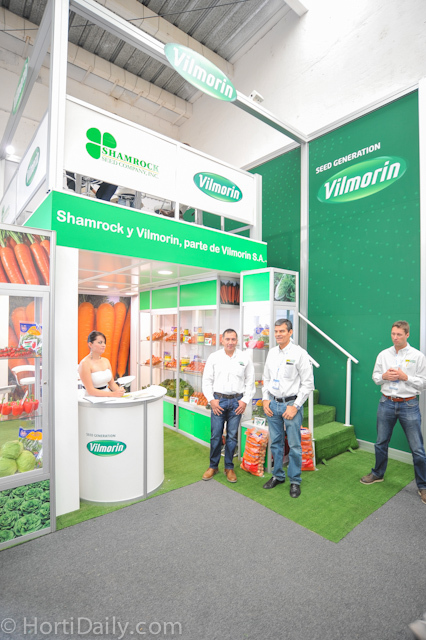 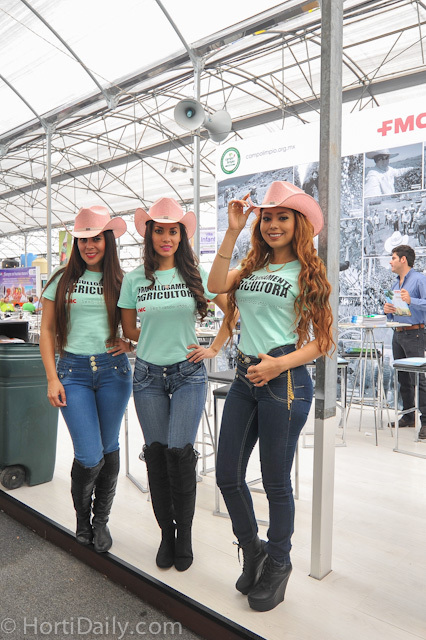 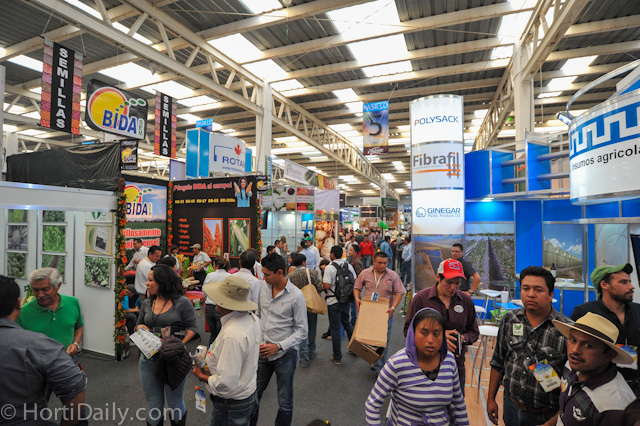 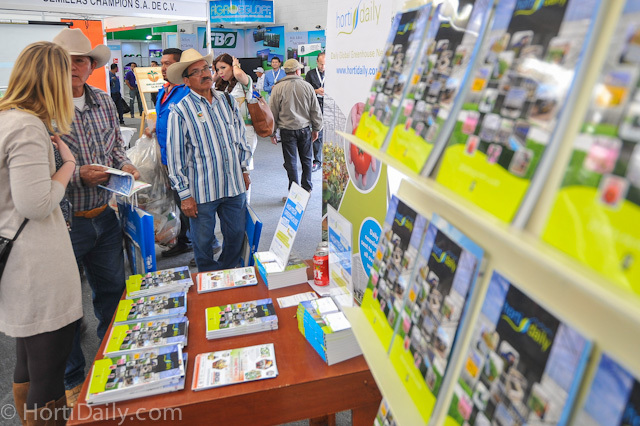 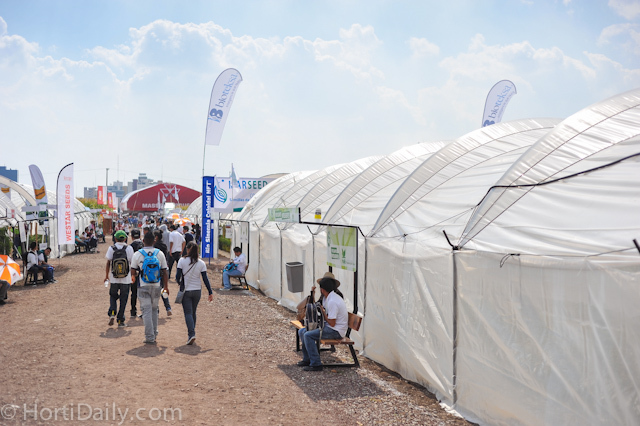 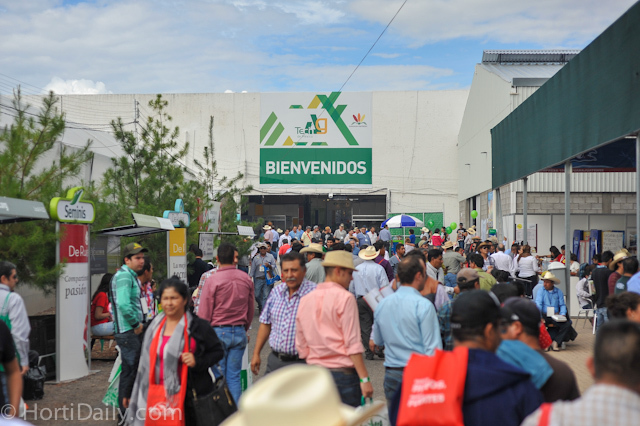 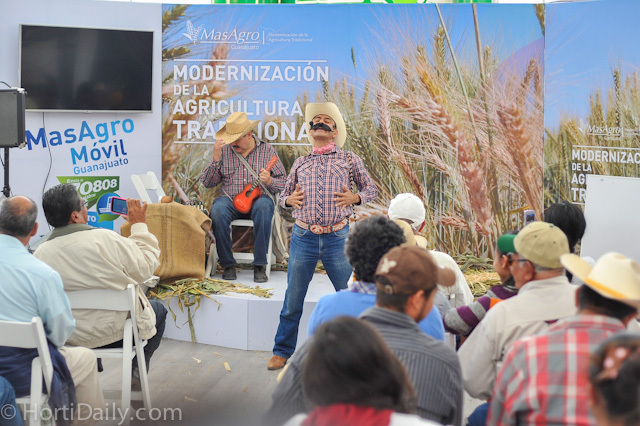 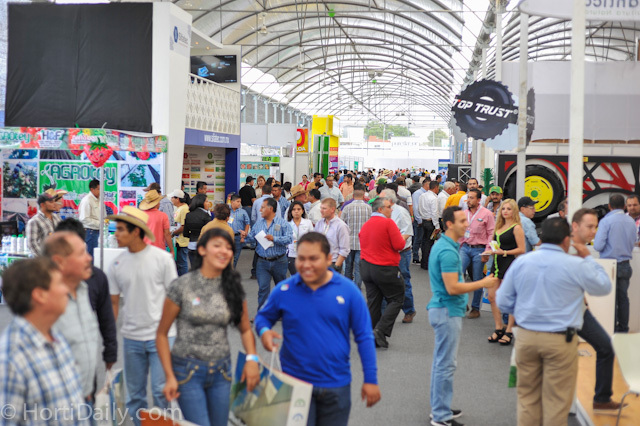 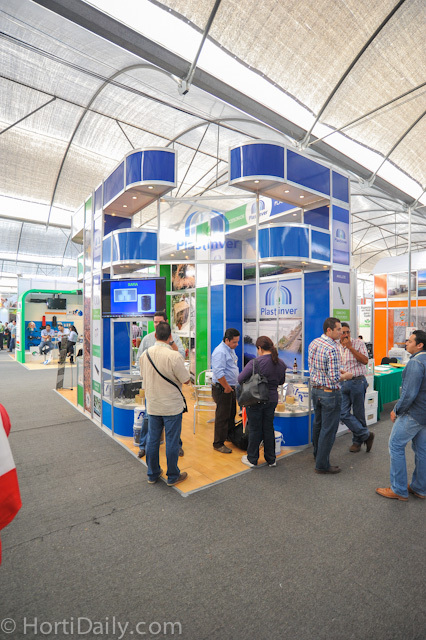 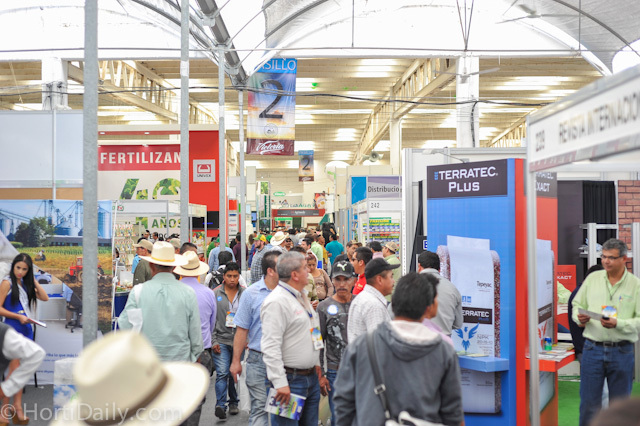 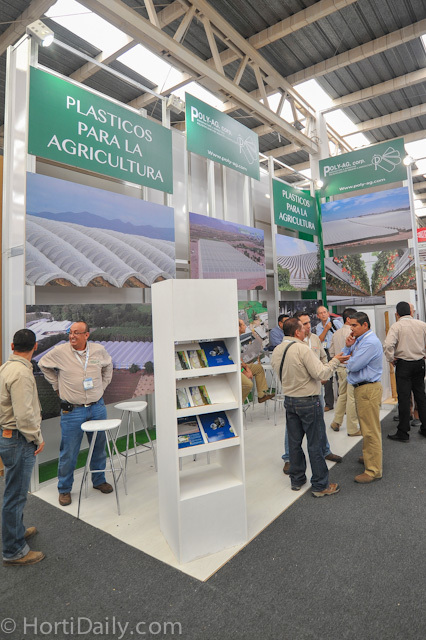 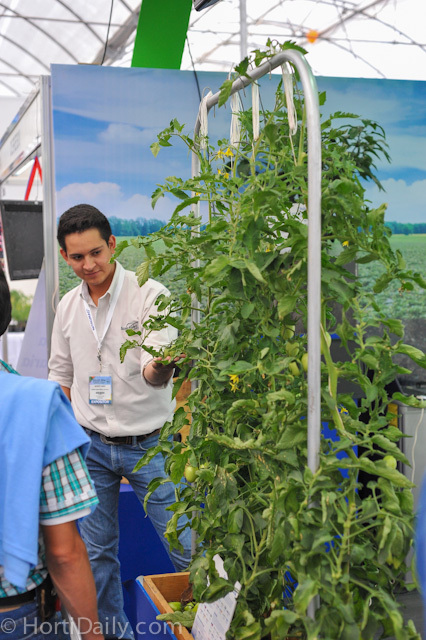 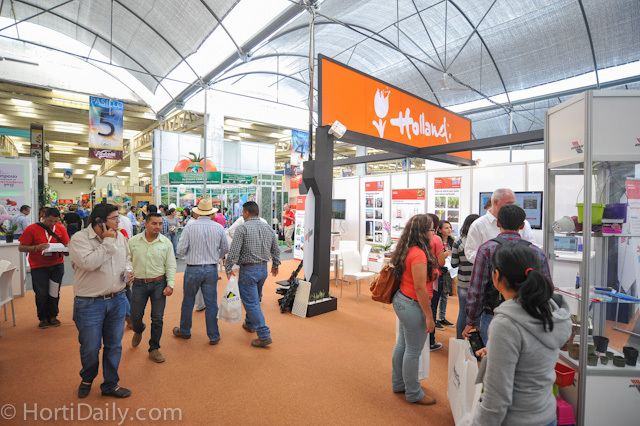 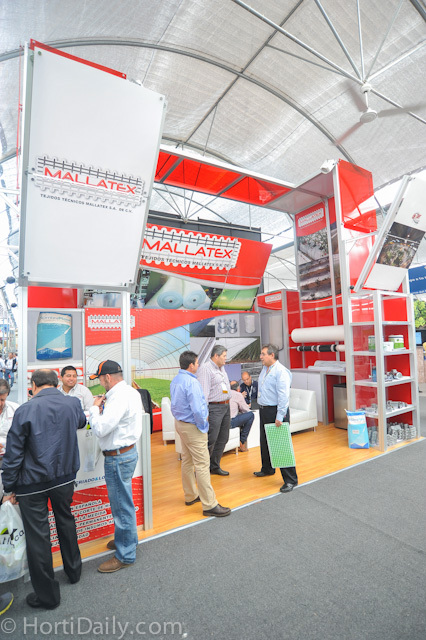 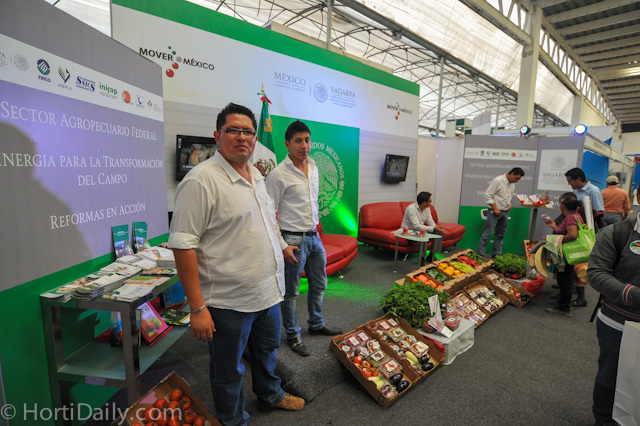 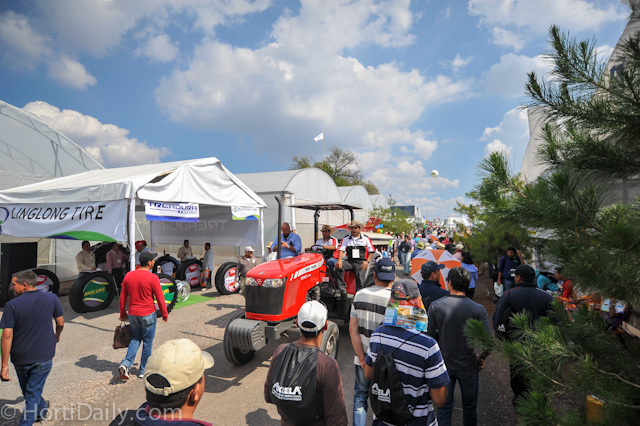 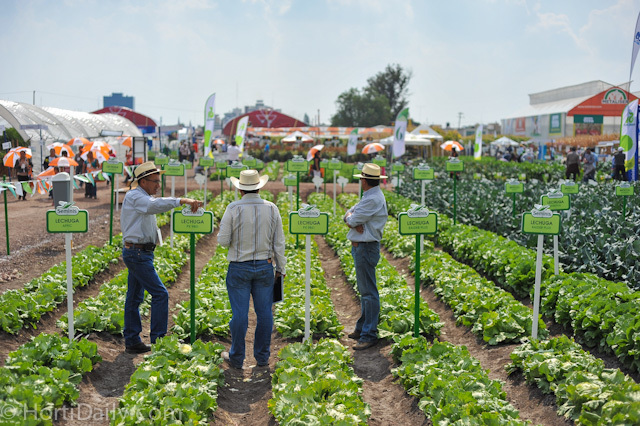 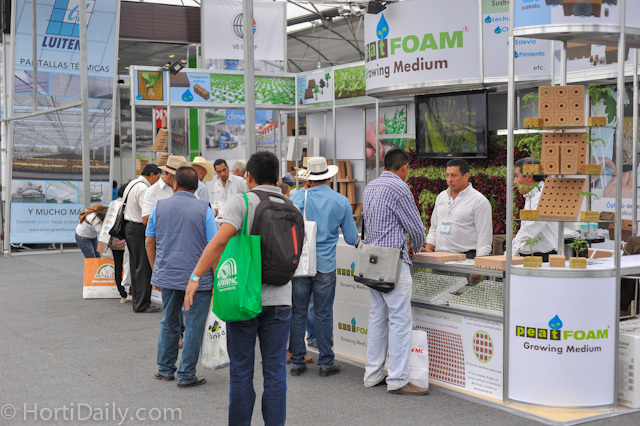 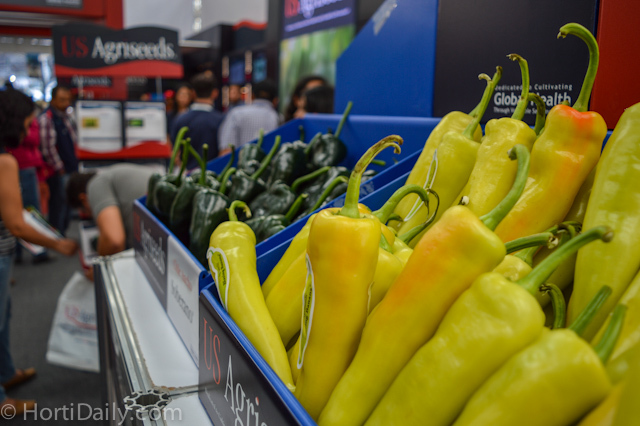 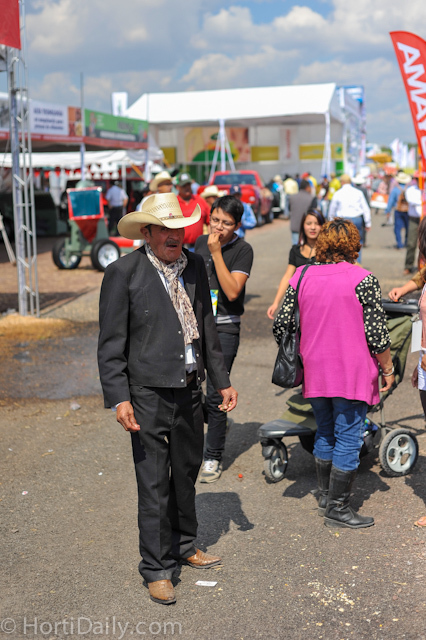 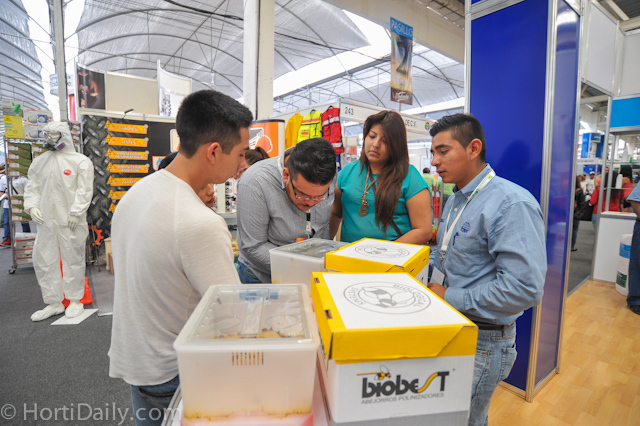 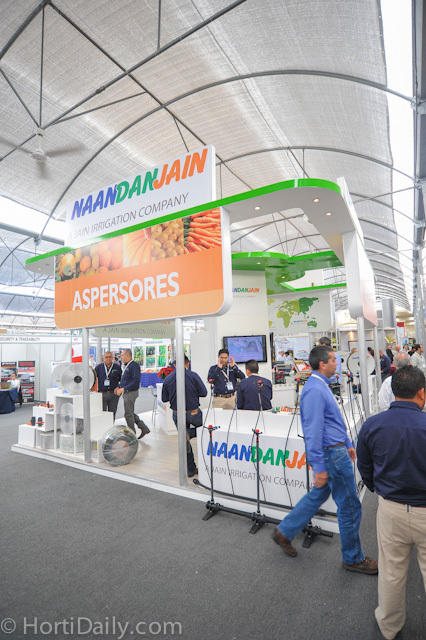 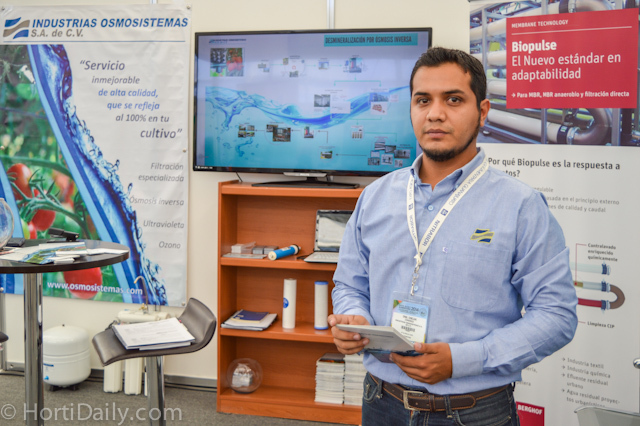 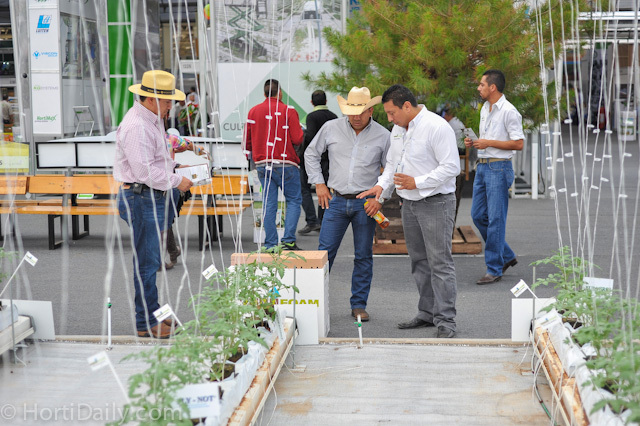 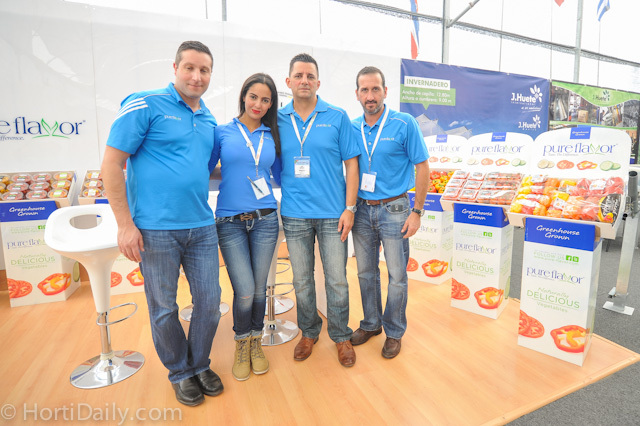 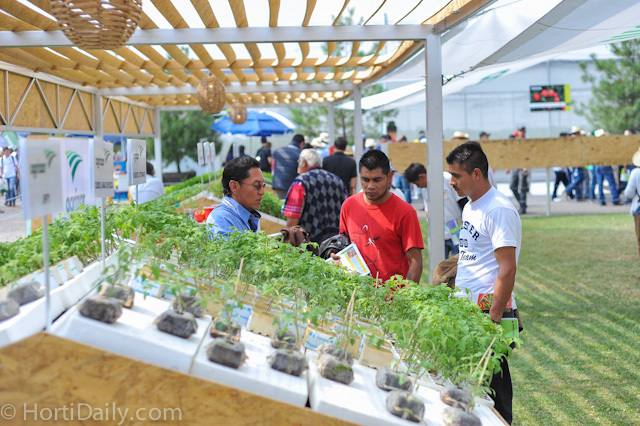 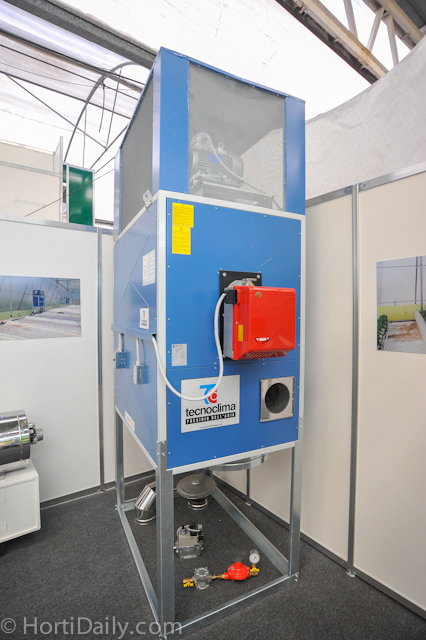 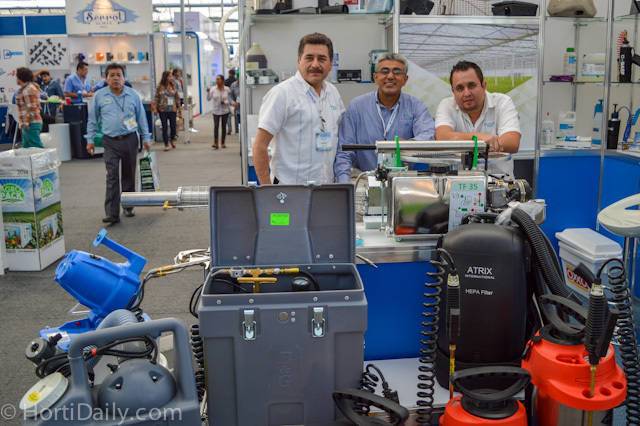 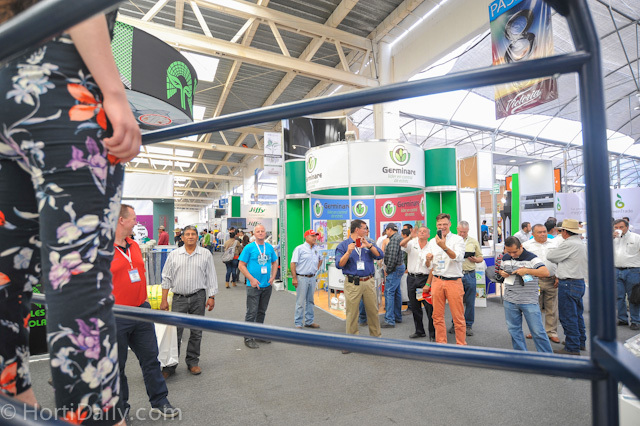 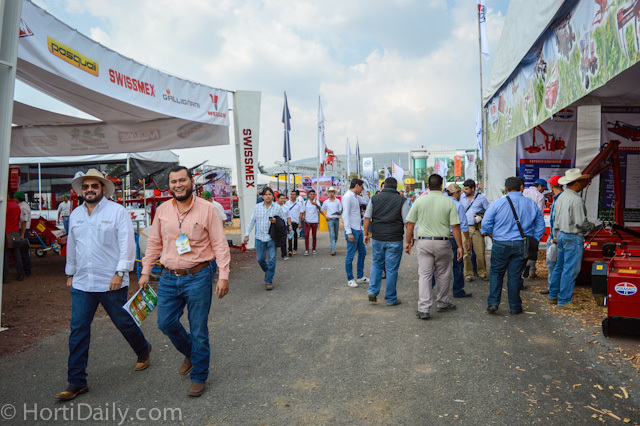 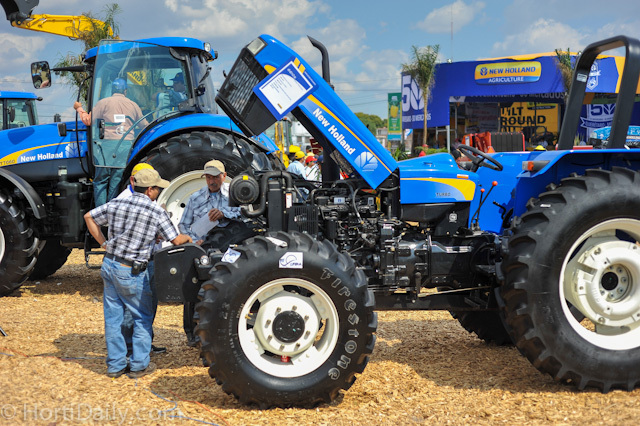 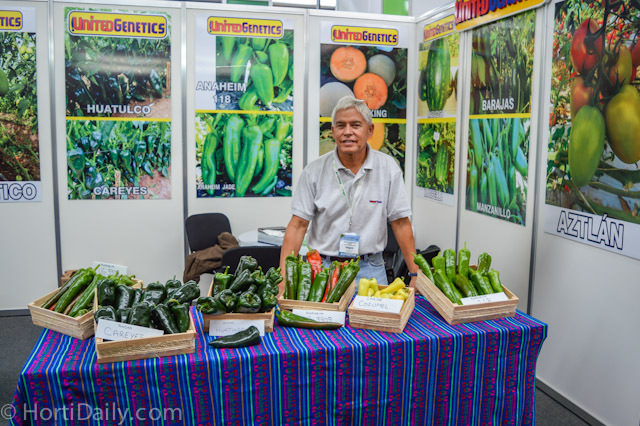 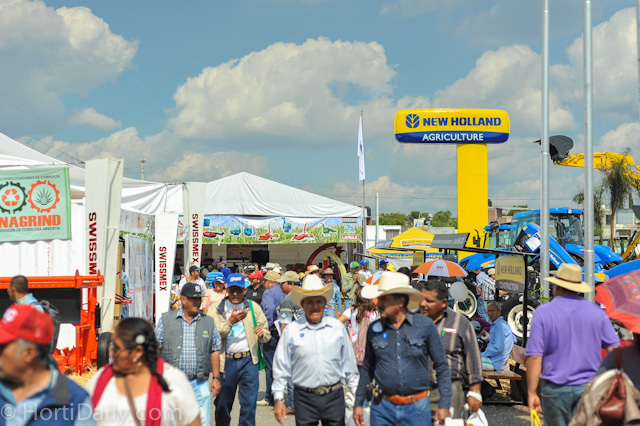 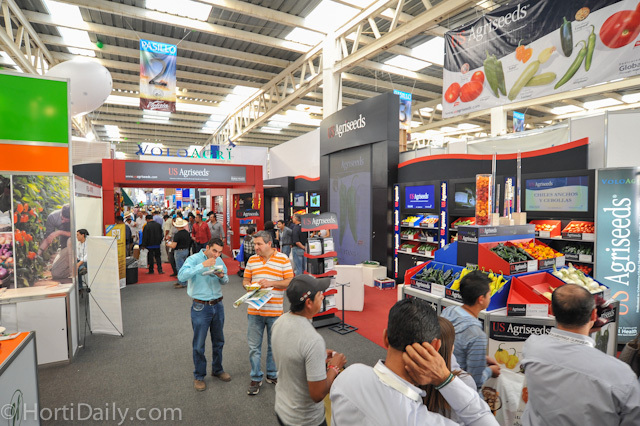 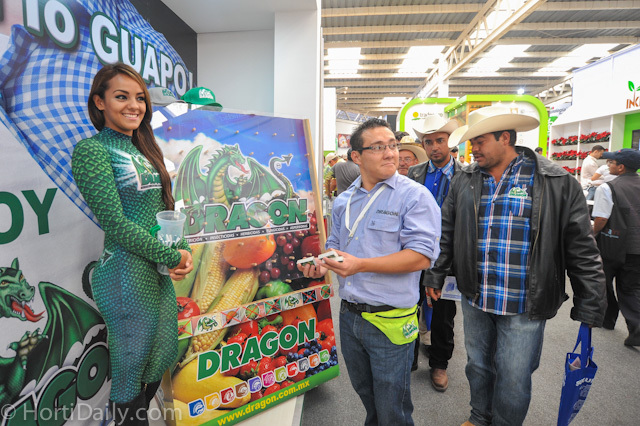 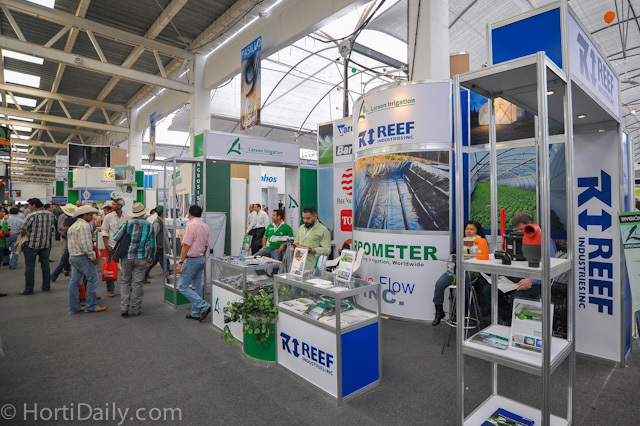 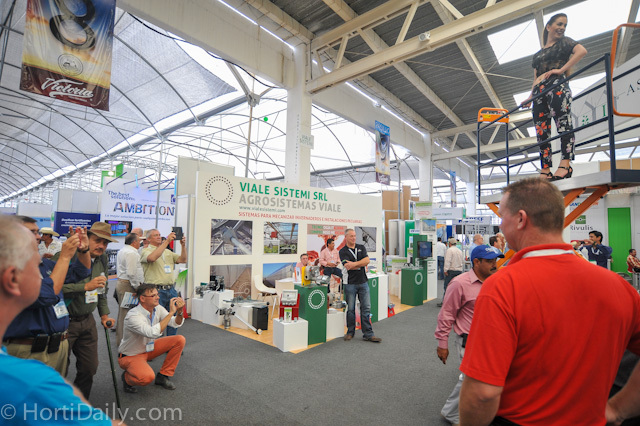 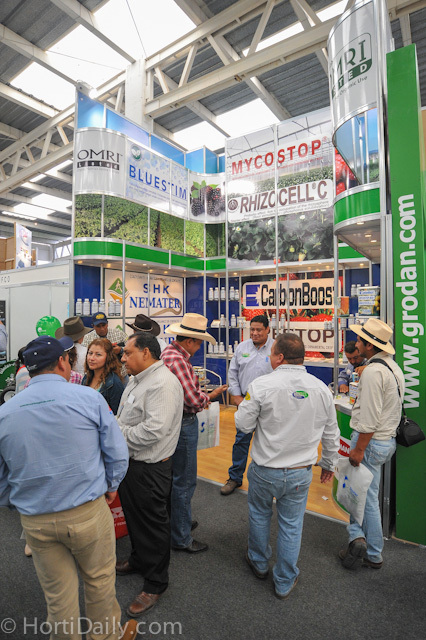 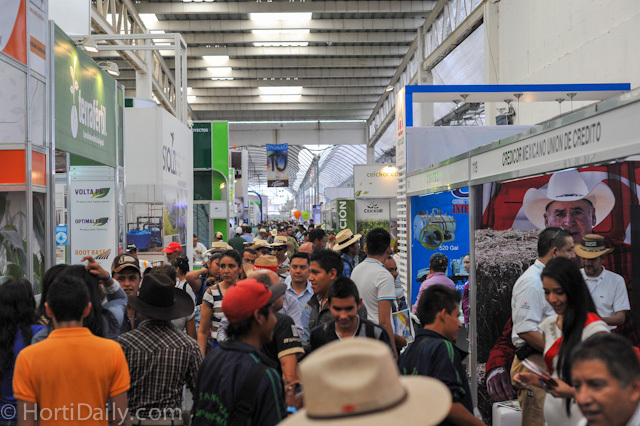 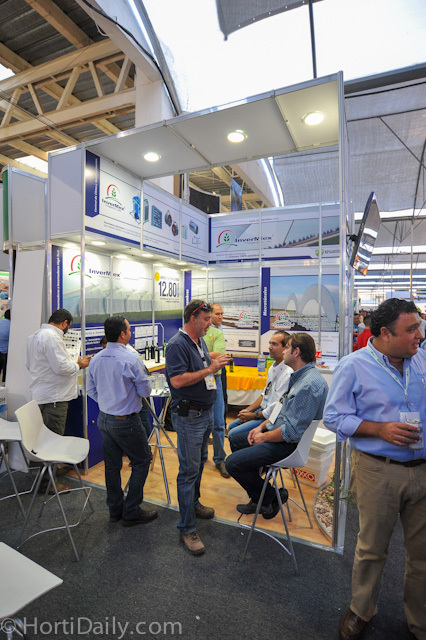 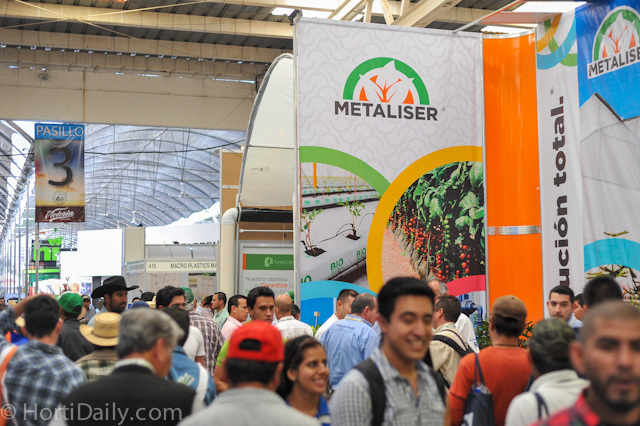 Expo AgroAlimentaria Guanajuato 2014, Irapuato, Mexico. 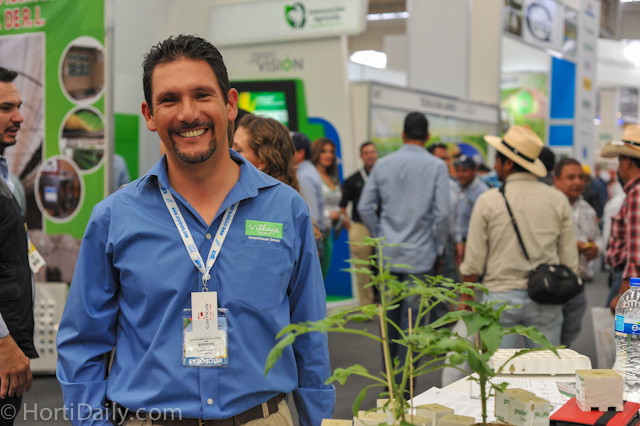 Last year when we met Sedrach Camacho, he was still a grower. 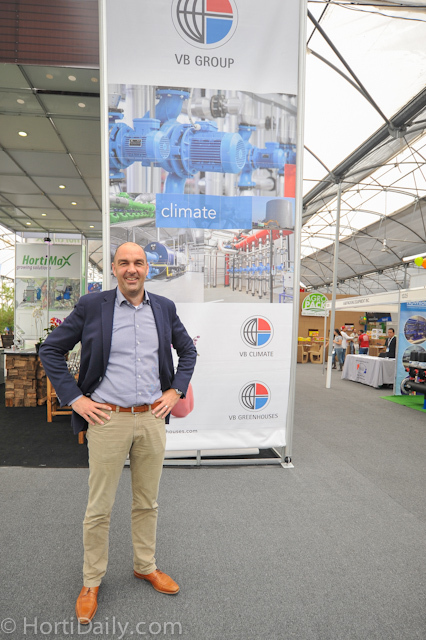 Since a few months he is working as an advisor an representative for Seminis & De Ruiter. 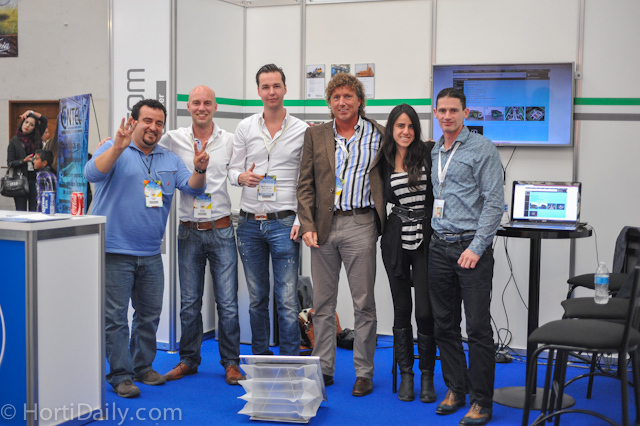 Damian Solomon, Harry Kroeker, Hilada Diaz and Thijs Peekstok of De Ruiter. 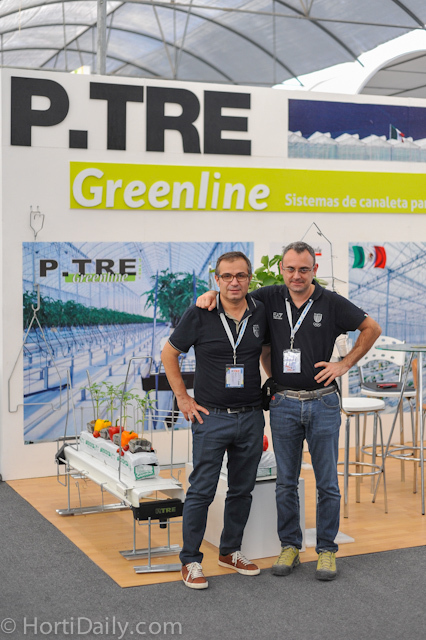 Michele Pavano of P-TRE Greenline at the demosite where he instaled several gutter systems. 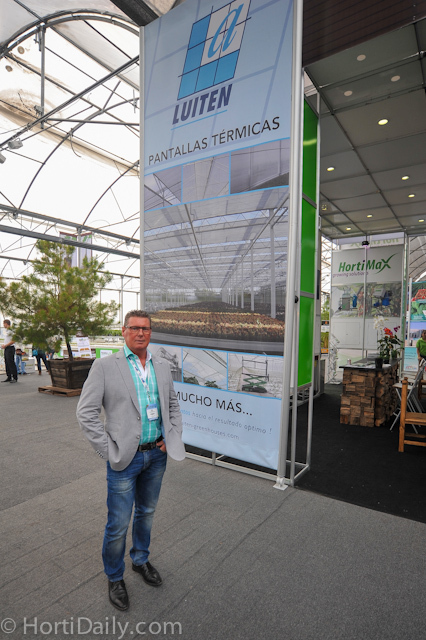 Niek Luiten of Luiten Greenhouses. 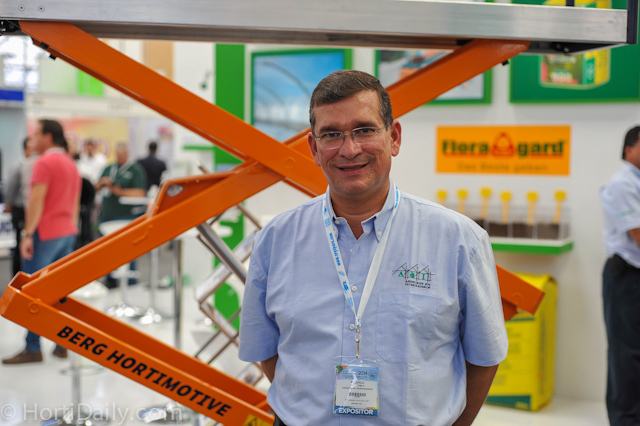 With the bench systems, Floris Berkhout of KG Systems attracted the attention as he was one of the few suppliers for ornamental production. 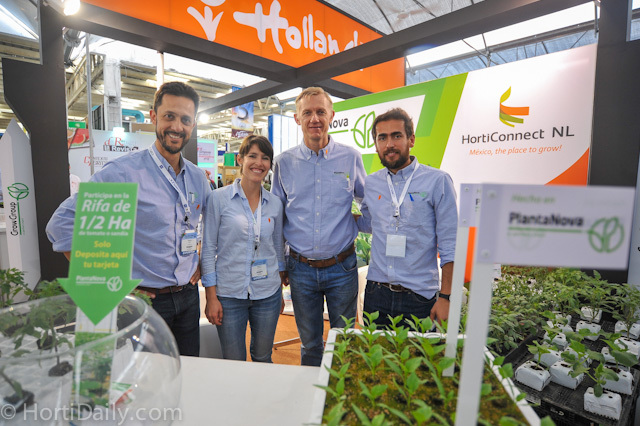 An interview with Floris Berkhout will follow on HortiDaily.com. 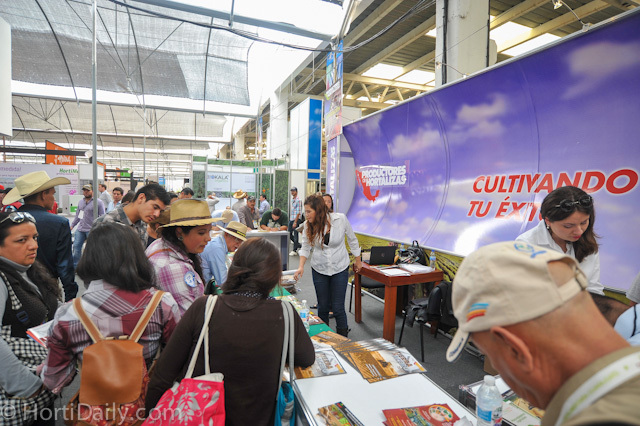 The nice thing about the Expo are all of the varieties and cultivation systems that are on display. 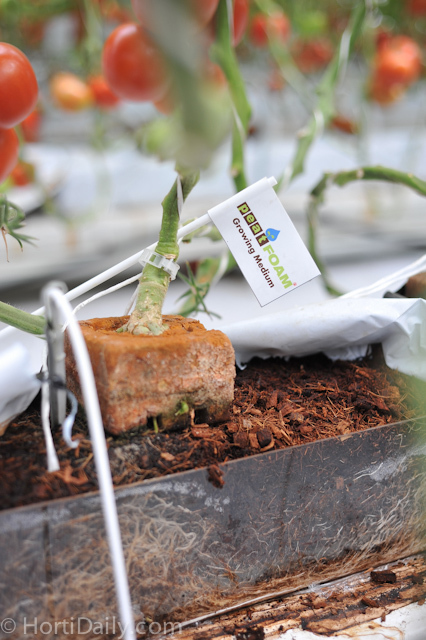 Peatfoam propagation block on coir slabs. 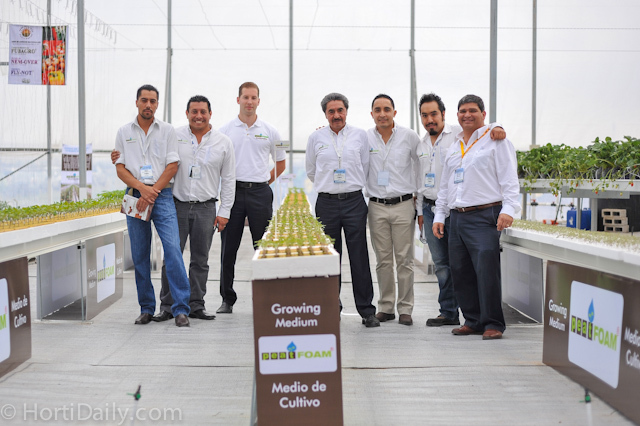 The entire team of Peatfoam at the propagation media trials. 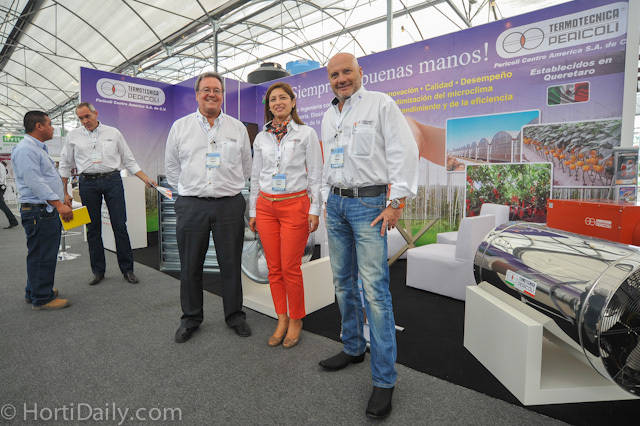 Veronica Cortes of Svensson visiting the Spanish greenhouse manufacturer Tecnoponiente. 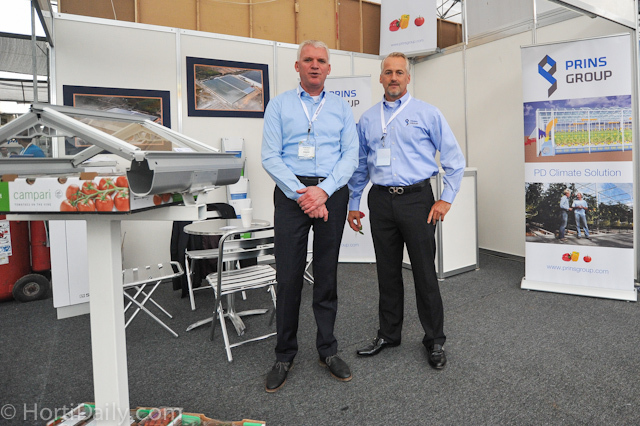 Rob van Leeuwen of F&H Crone boilers was visiting the show. 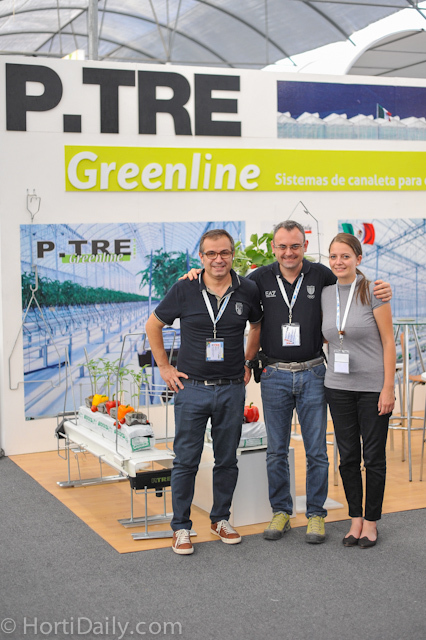 Peter Acutt, Mariangeles Alfierie and Mauro Pericoli of Termotecnica Pericoli. 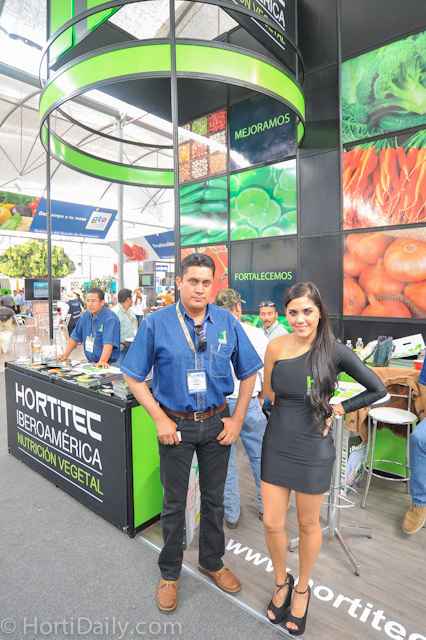 Mariangeles is the gerente for the recently found Central American subsidiary of Termotecnica Pericoli. 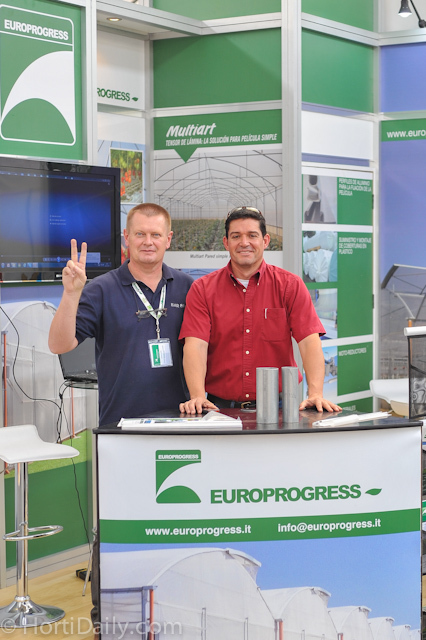 Jean Piere Lejeune and Marco Salmon of Italian greenhouse manufacturer Europrogress. 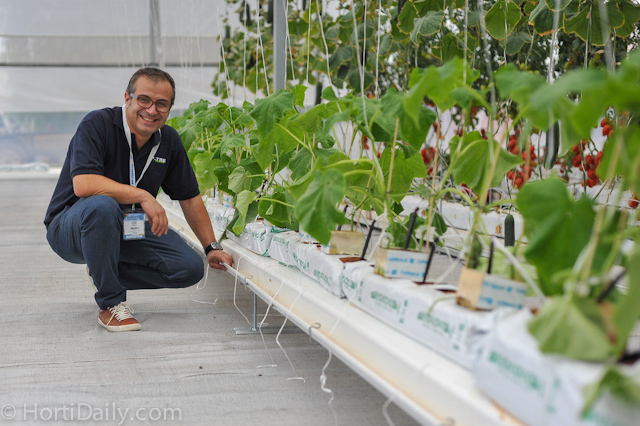 Bert Neeft and Dennis van Alphen from Total Energy Group are very busy with welding and construction work at various greenhouse projects in North America. 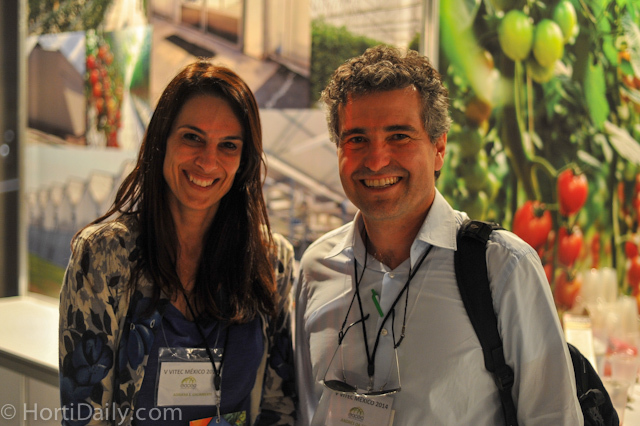 Michele Pavano and Gabrielle Roncaletti of P-TRE Greenline. 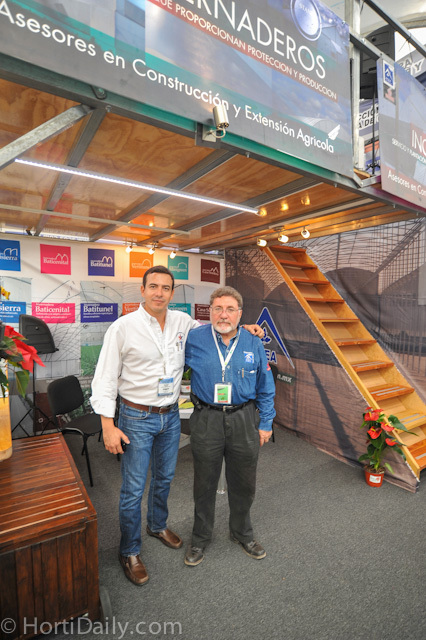 Francisco Acosta of Village Farms was visiting the show as well. 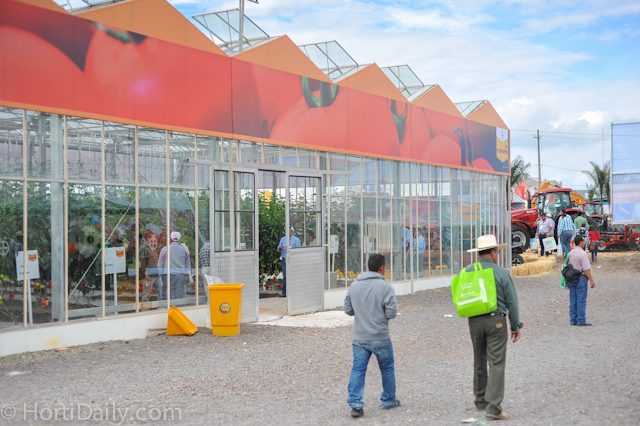 Nunhems has a Venlo glasshouse that they use as demohouse. 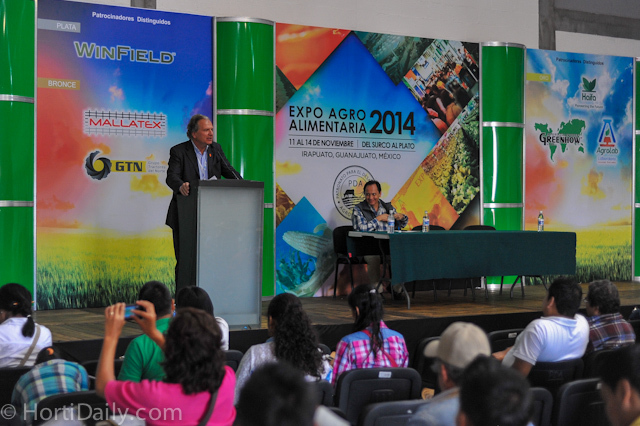 Dutch ambassador Dolf Hogewoning introduced the Dutch seminars on advanced horticulture. 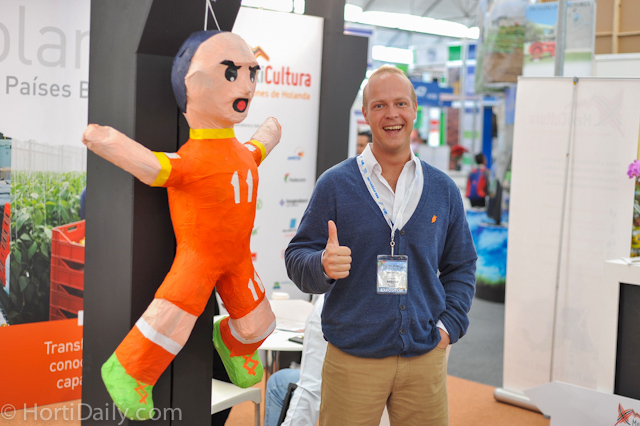 Niels Prinssen from DLV Plant - Mexicultura with the Arjen Robben Piñata! 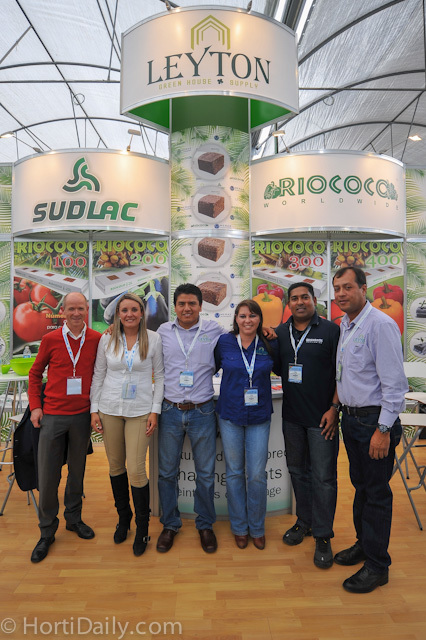 The team from Sudlac, Leyton and Riococo. 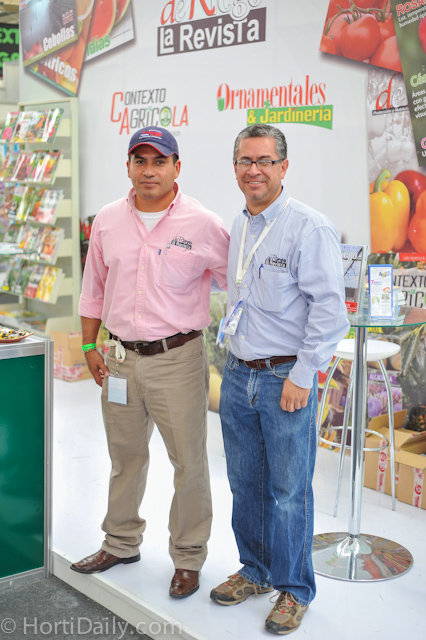 Israel and Arturo of Editorial De Riego. 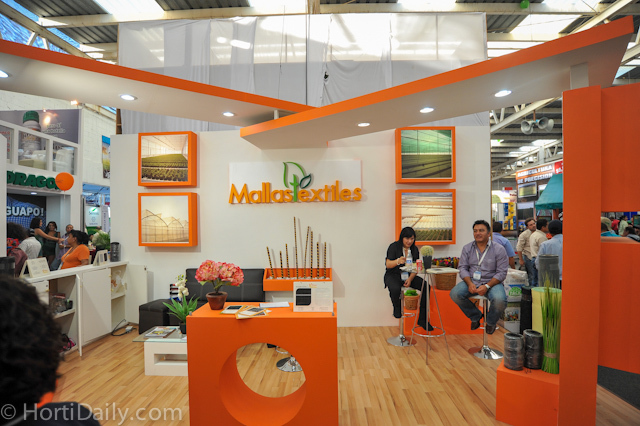 Alexander de Leon of Formflex. 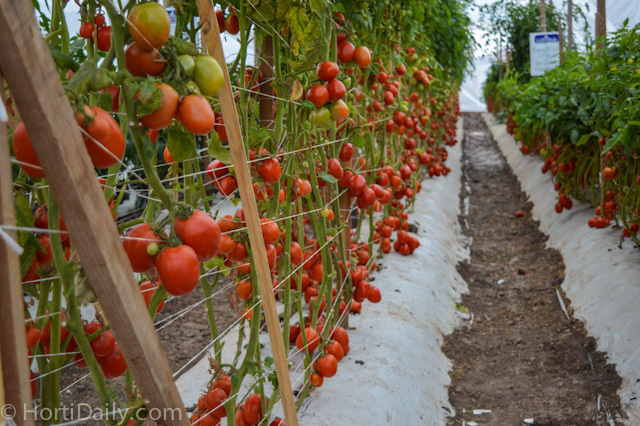 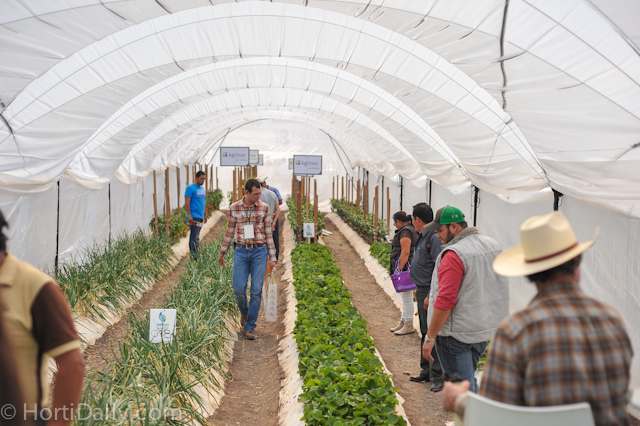 Formflex installed the gutter systems at the strawberry trials. 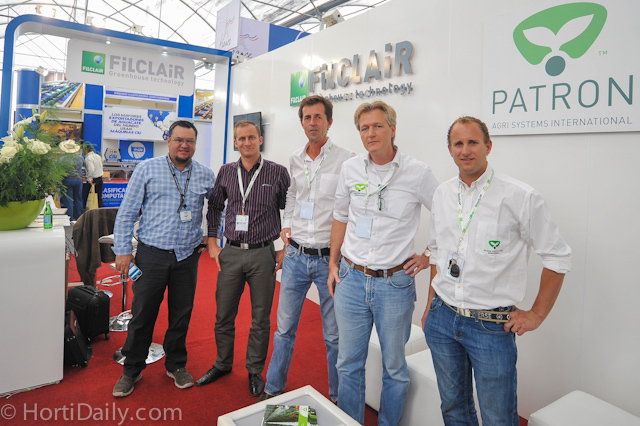 The team of Formflex and Metazet; Arie, Aaron, Philippe and Alexander. 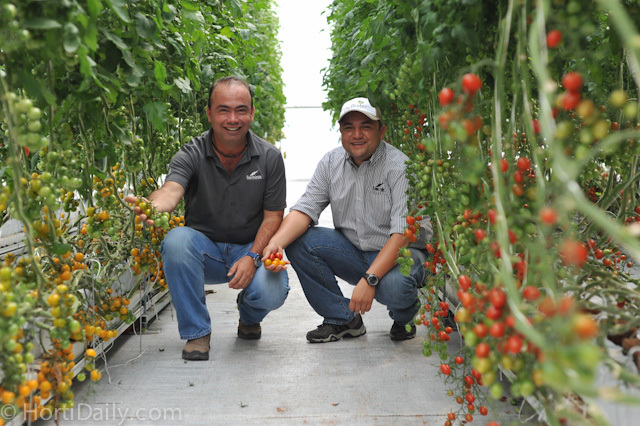 Tomato grower Jacques Jajati of Sunnyfields visiting PlantaNova. 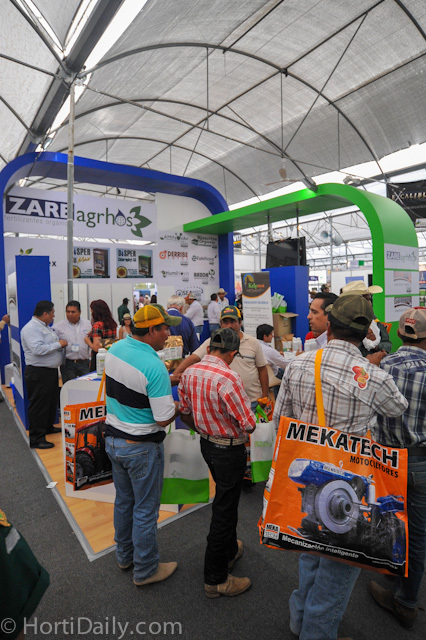 Very crowded trade show floor. 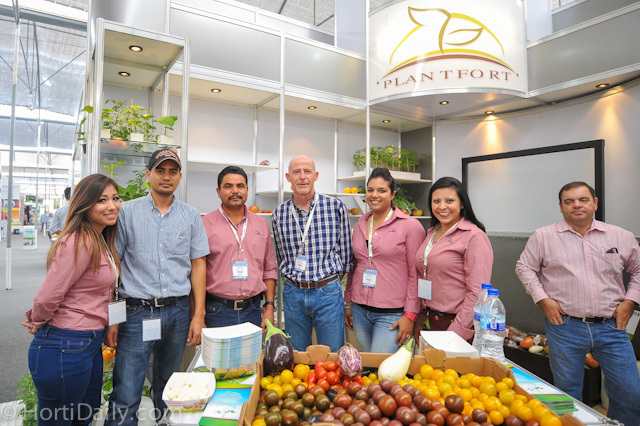 Plantfort is the propagation company that is owned by El Rosal. 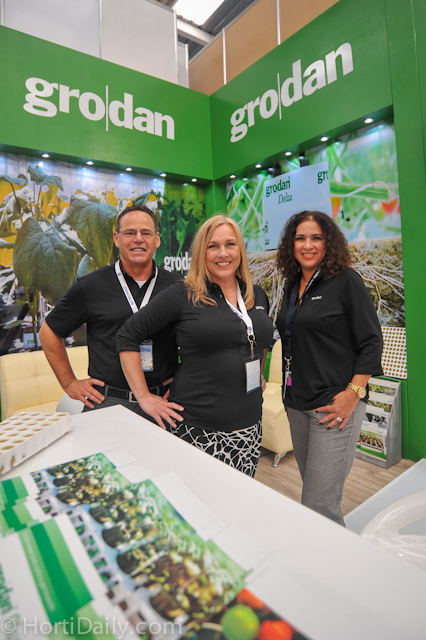 Ron Wyatt, Cinnamon Cantwell and Elisa Gutierrez of Grodan. 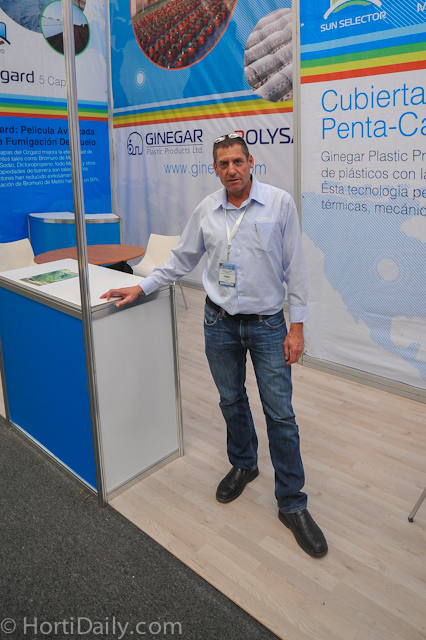 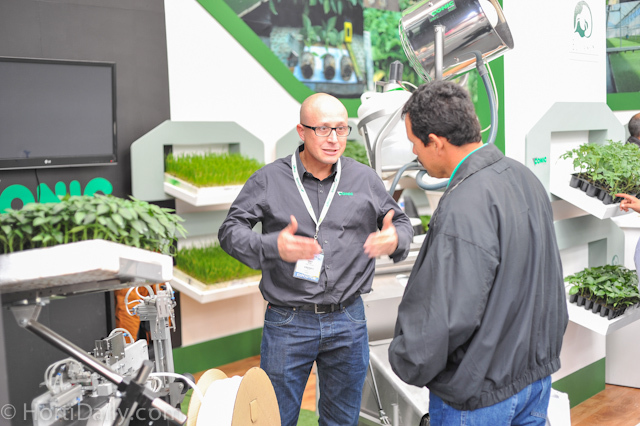 Jordi Gusi of Conic System had a grafter on display at the booth of propagator El Oasis. 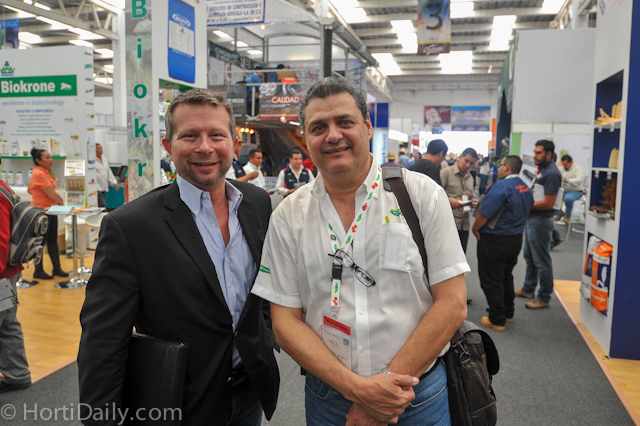 Ricardo Garcia of North American Allied and Alex Pacheco of ACEA. 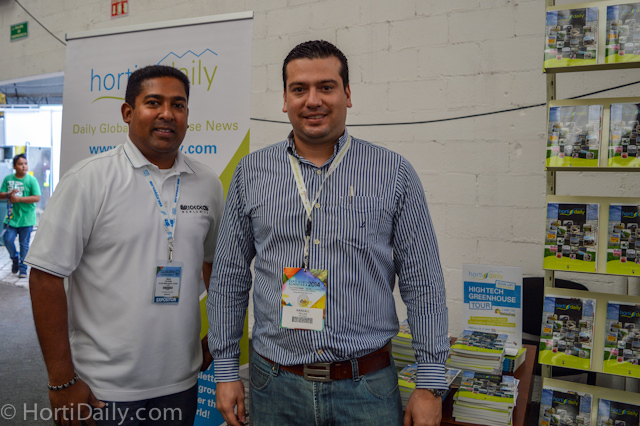 William Ison and Angel Urrutia of the Greenery. 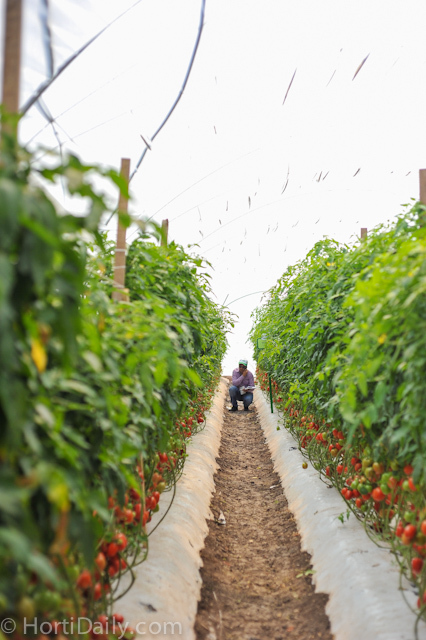 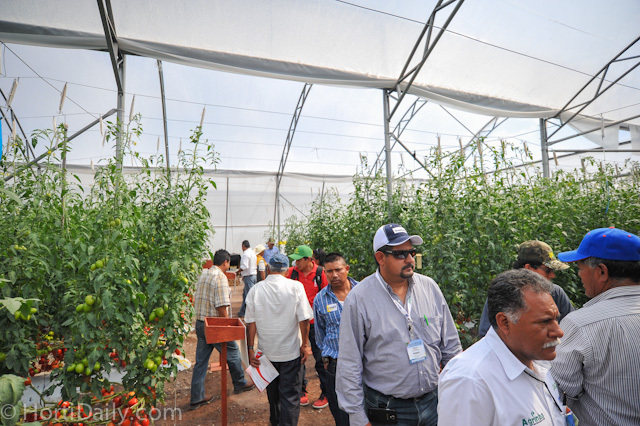 The Greenery has growers in Mexico on a total of 140 hectares. 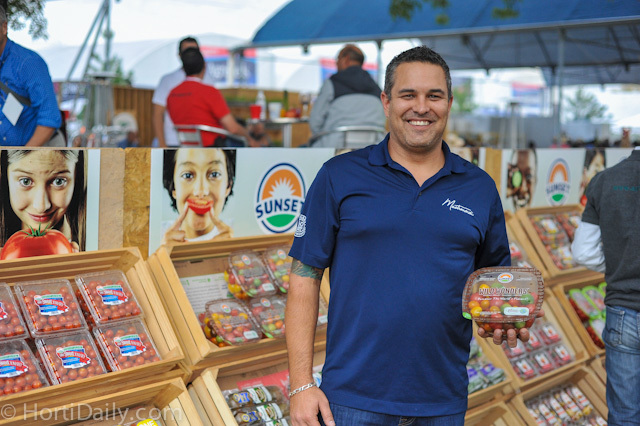 Jason Whitcher of Sunset Mastronardi / Sunset Produce. 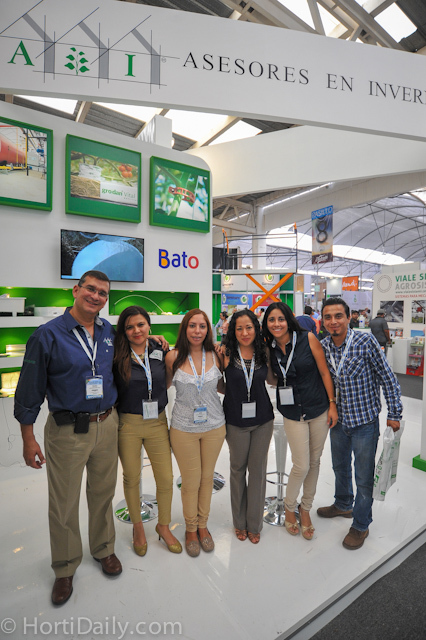 The team from Haifa Mexico. 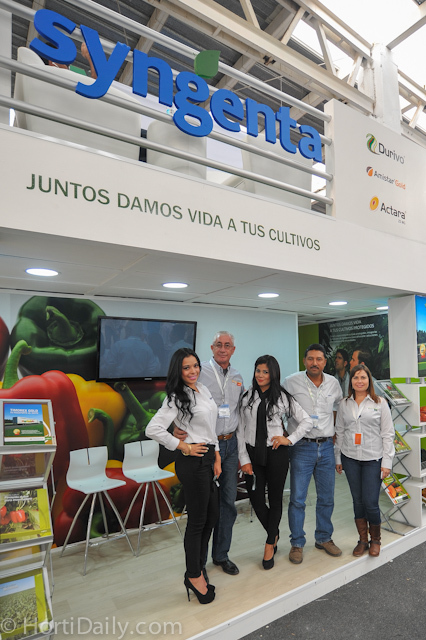 Our colleagues of Productores Hortalizas. 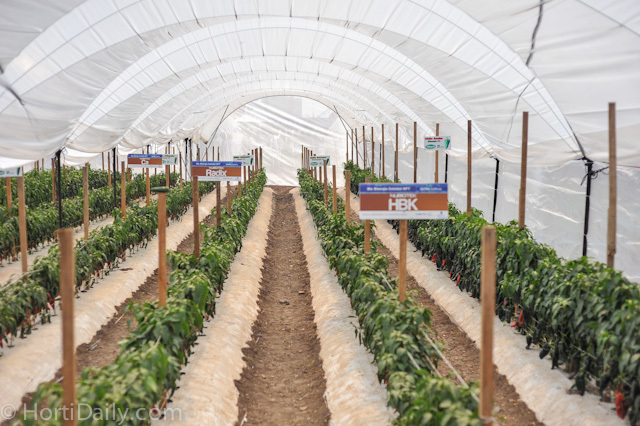 Hazera trials on Pelemix substrate. 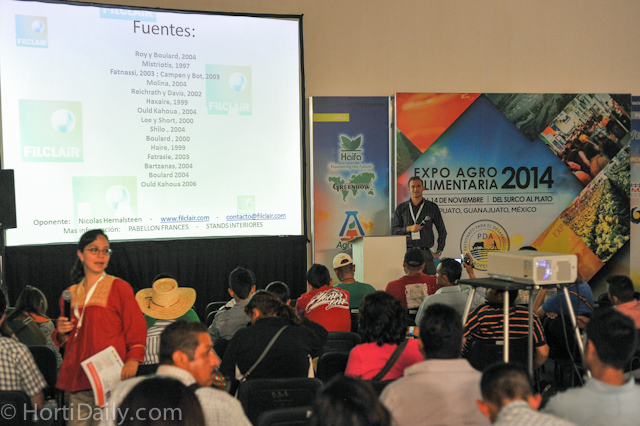 Special entertaining seminars on innovative agriculture. 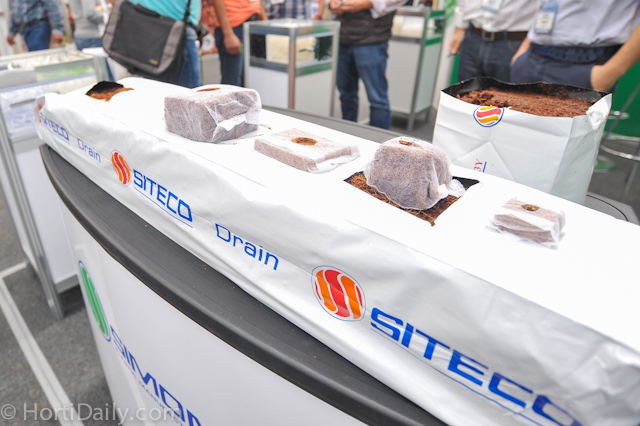 Siteco has also developed propagation cubes. 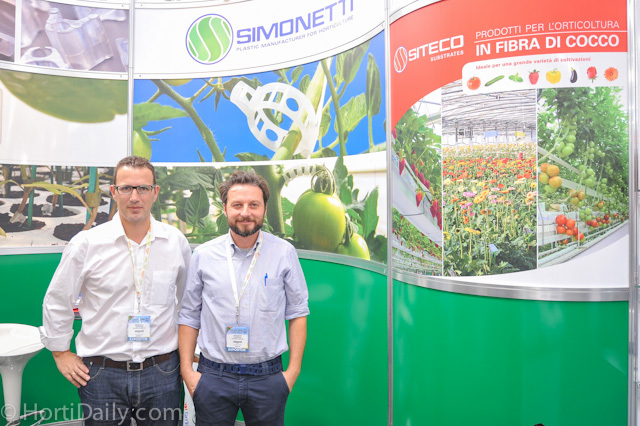 Roland Pereira and Alessandro Pasqualato from Simonetti and Siteco. 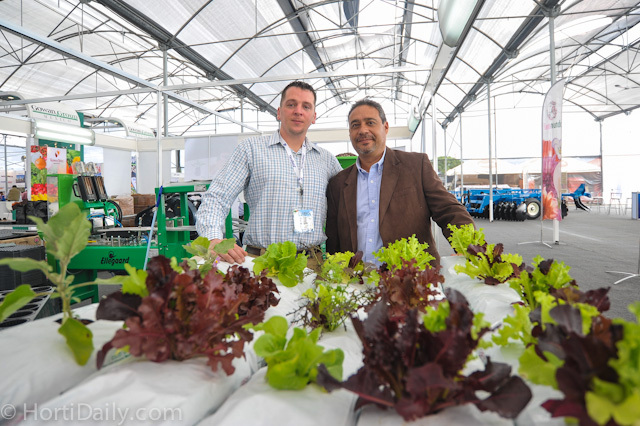 Maurico Revah of United Farms and Wil Lammers of HortiMax. 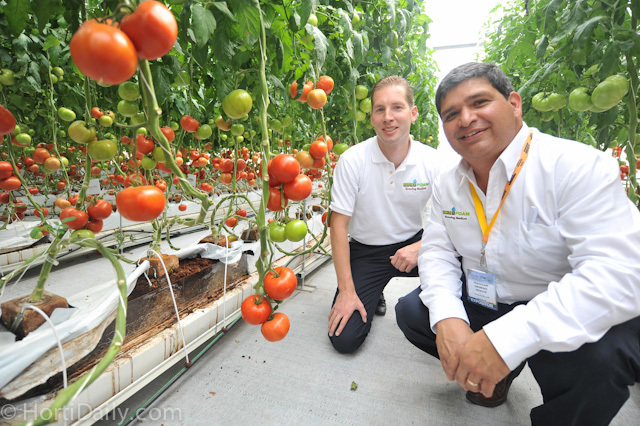 Hortimax is going to install the latest expansion project at United Farms. 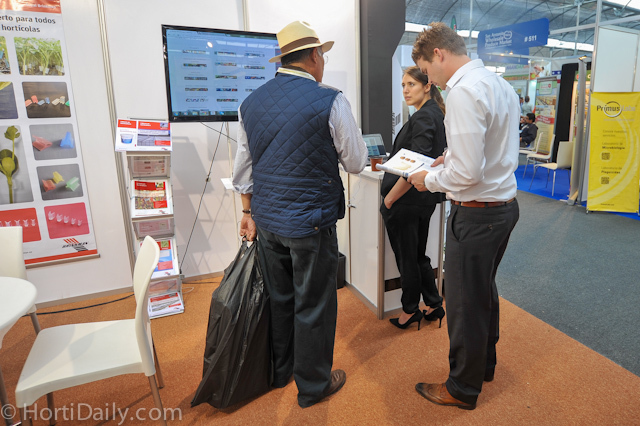 A lot of interest in the Benomic Star. 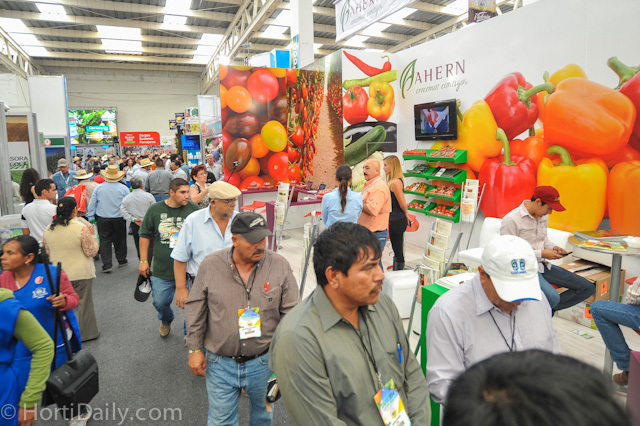 Ahern Seeds is a distributor of many breeders. 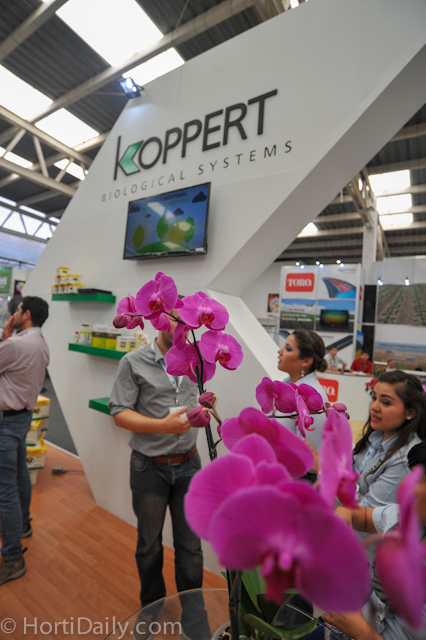 Beautiful orchids at Koppert booth. 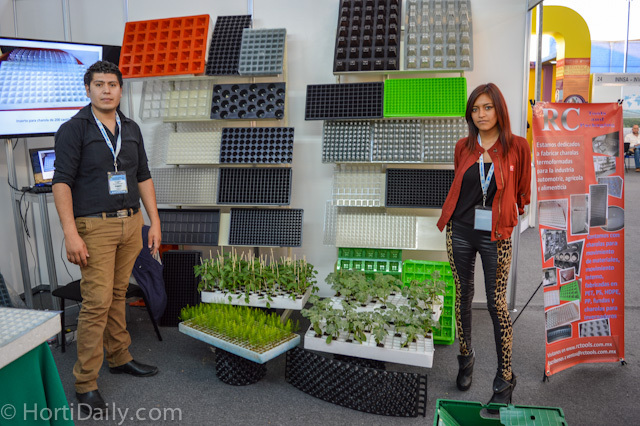 High tech gutter cultivation on display. 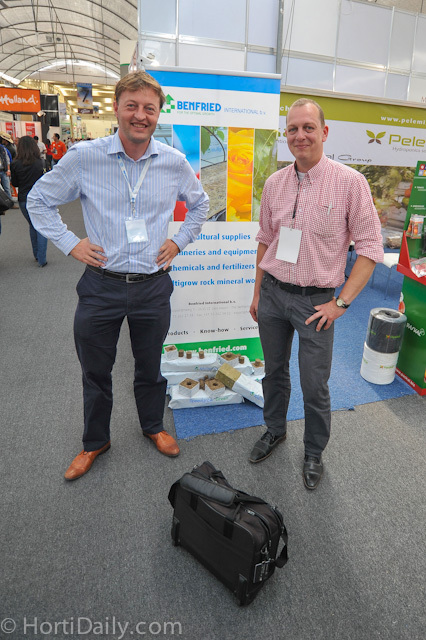 Elmer Vlielander from Benfried International and Arie van de Wijgert from Ferm O Feed who was visiting the show. 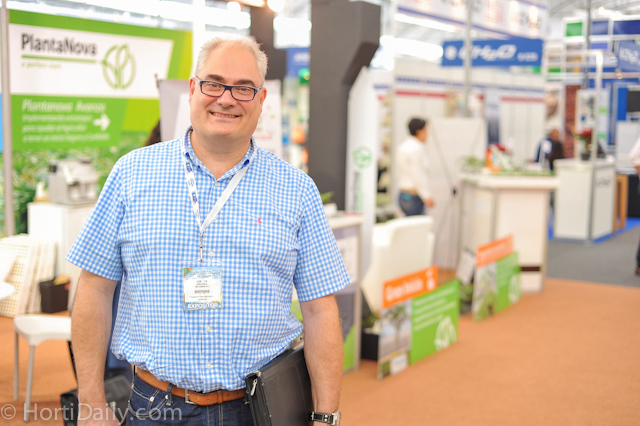 Wouter Voortman of VitoTherm at the Hortidaily booth. 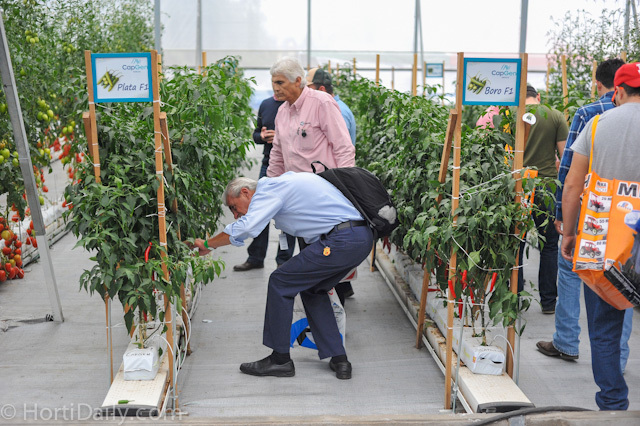 Mario Perches of DP Seeds is a loyal reader of our newsletter. 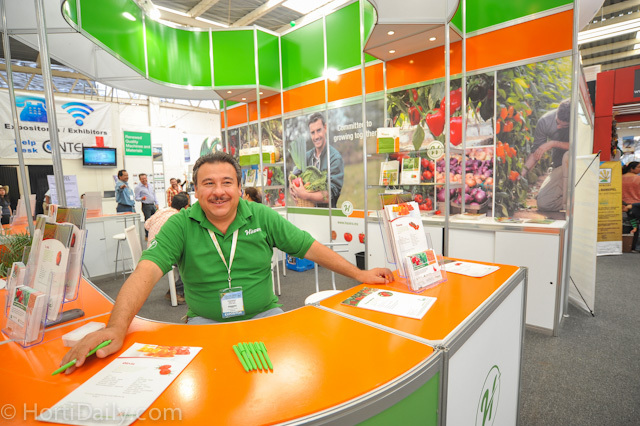 More info about his company via www.dpseeds.com. 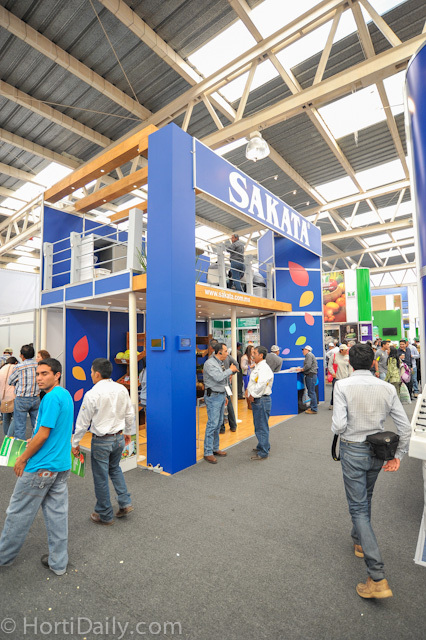 SAGARPA is the Mexican Secretariat of Agriculture, Livestock, Rural Development, Fisheries and Food. 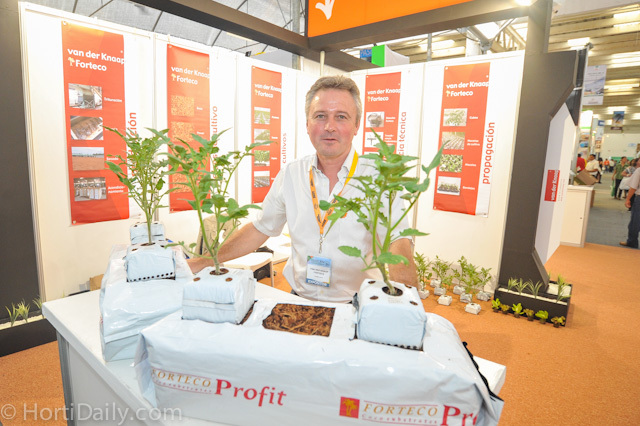 Juan Carlos Garci of CocoGreen coir substrate. 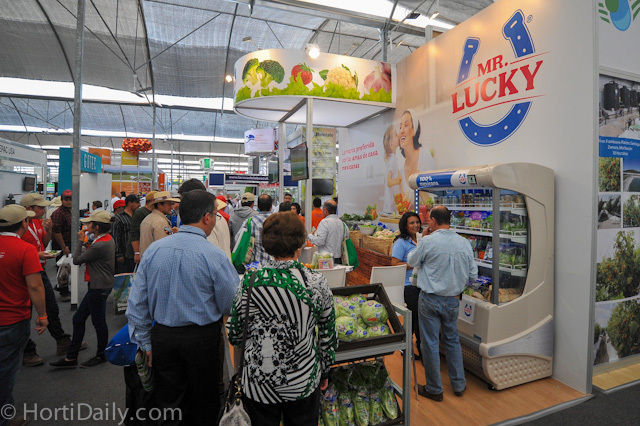 Mr. Lucky was gaining many interest in their convenience packaging. 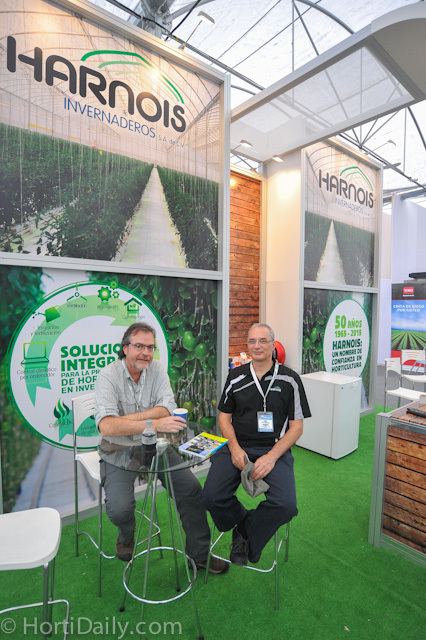 Harnois had a booth inside the expo, as well as a large demo Luminosa greenhouse outside. 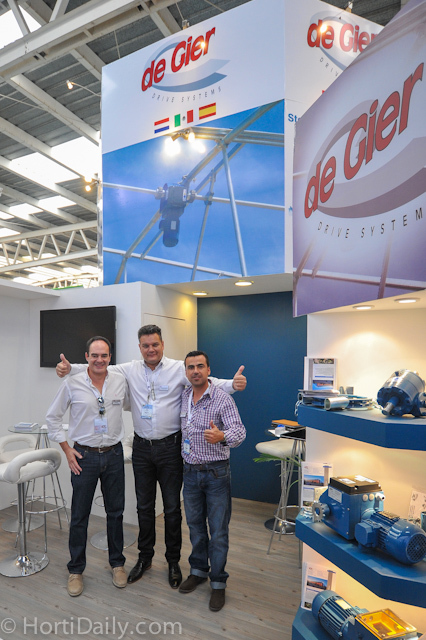 Dionisio Tendero and Victor Flores have established De Gier Mexico. 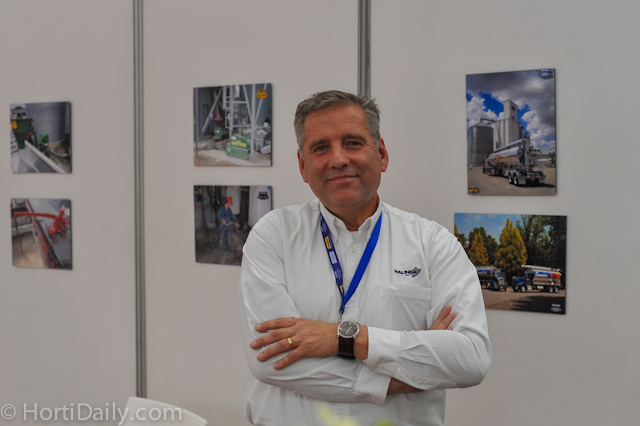 Rob Sandberg is very proud! 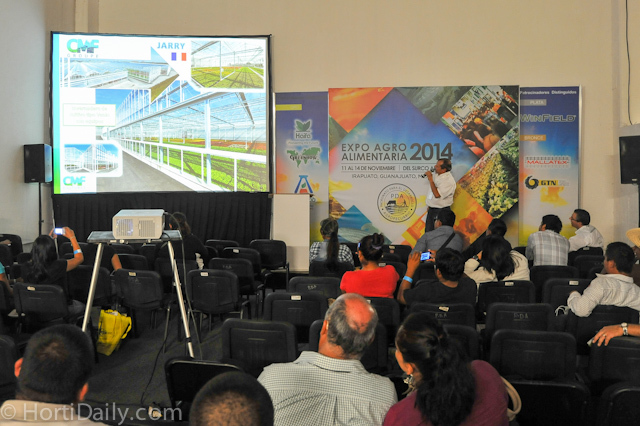 French greenhouse builder CMF giving a presentation on their state of art greenhouse structures. 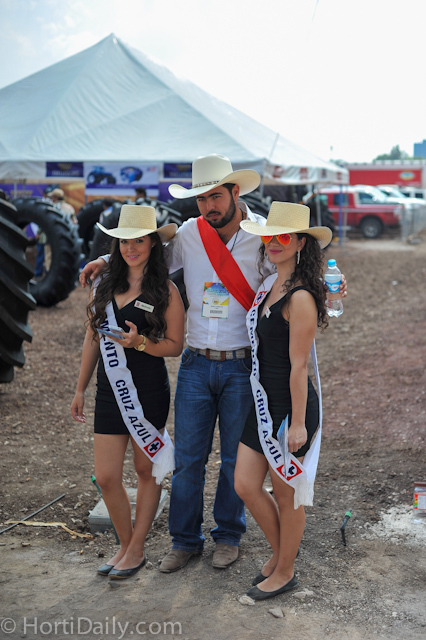 Marco Vega of Stockton promoting Timorex Gold. 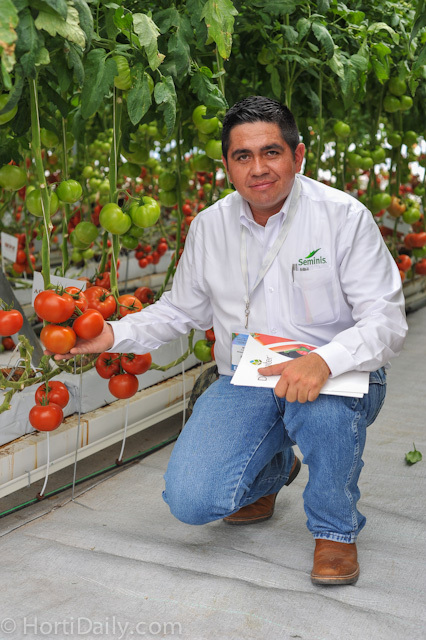 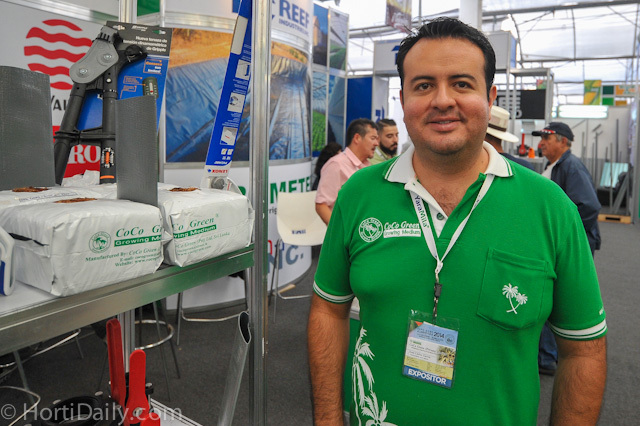 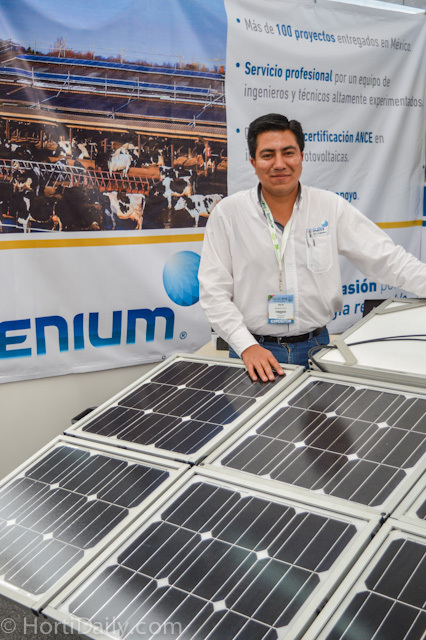 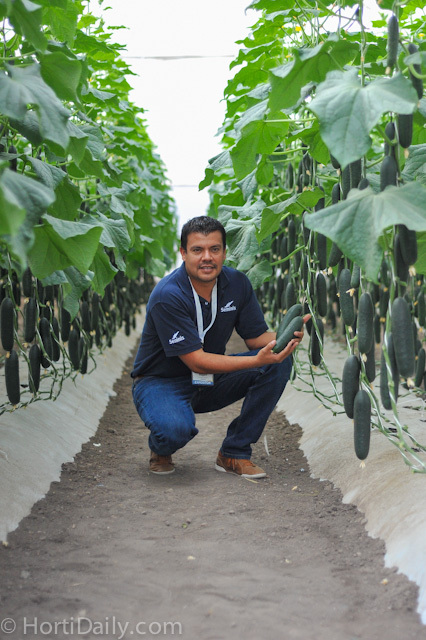 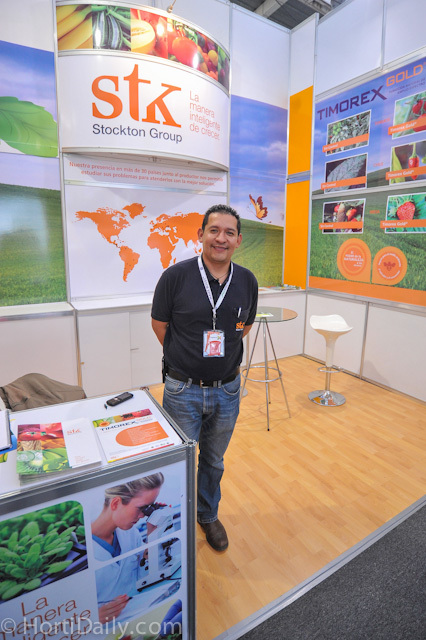 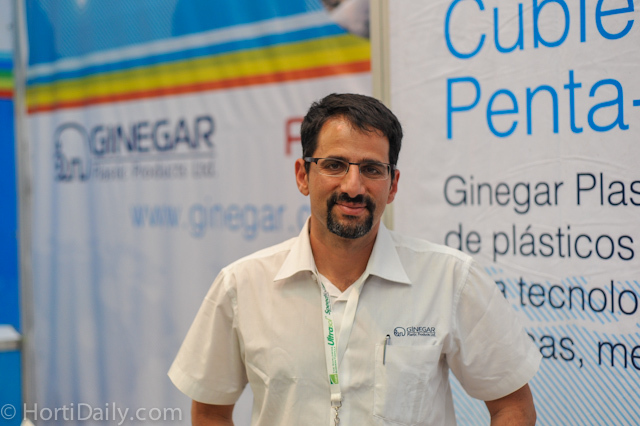 Juan Carlos Leon was previously with Stepac, but is now representing the growers of SunFed. 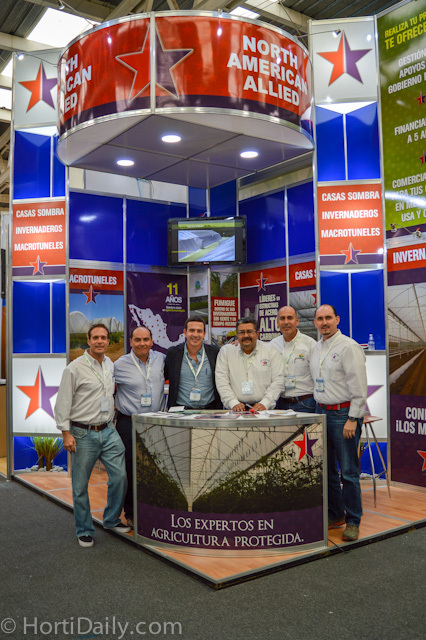 The sales team of Asesores en Invernaderos. 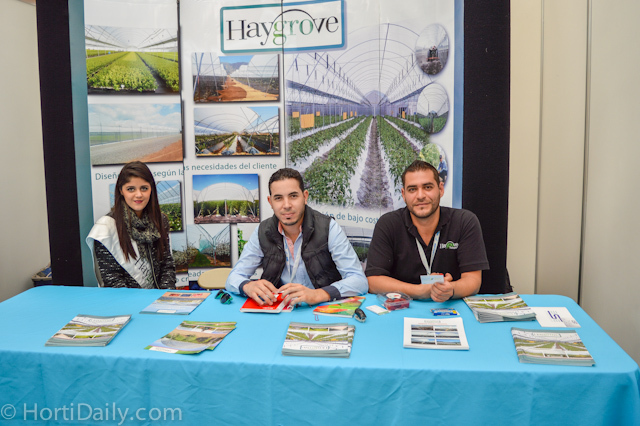 An interview with them will follow on HortiDaily.com. 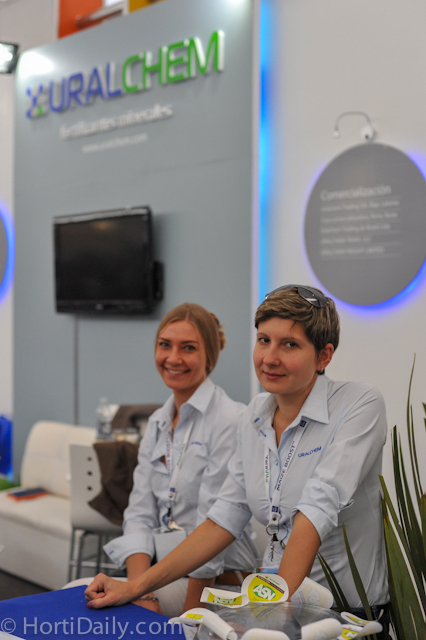 Ekaterina and Tatiana o Uralchem. 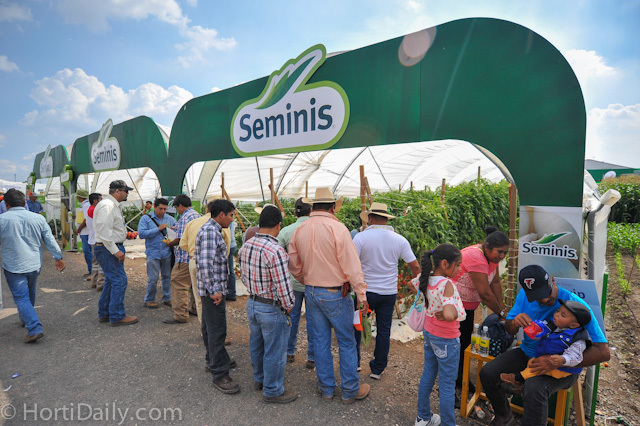 Sedrach Camacho of Seminis and De Ruiter giving some explanation of the trellising system. 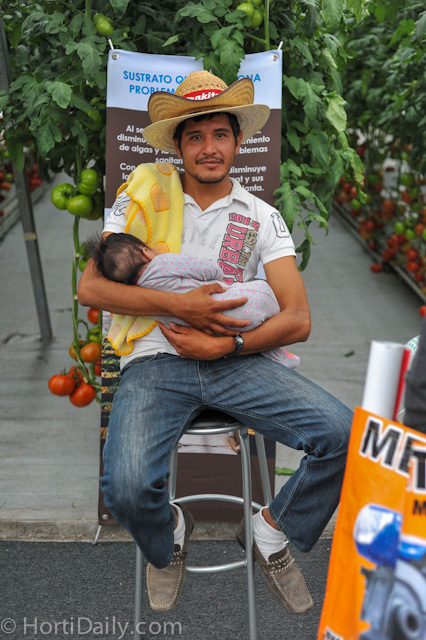 Probably the youngest grower at the show. 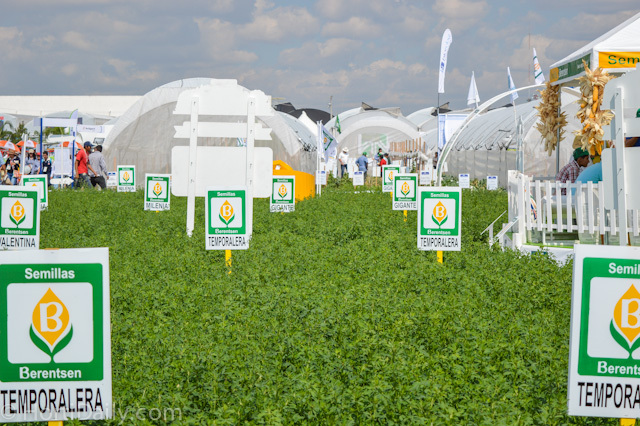 Plenty of cultivations to bee seen. 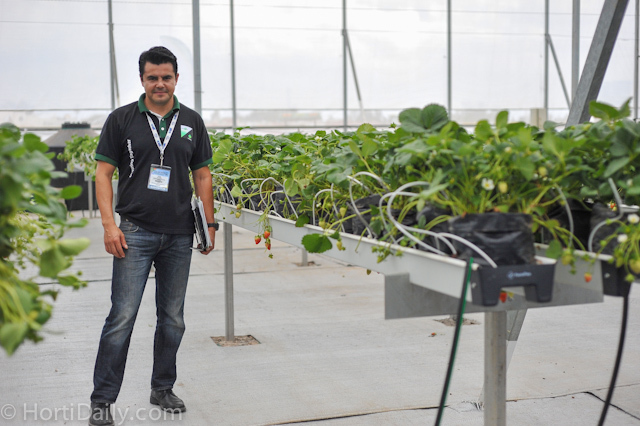 Strawberries on gutters from Formflex. 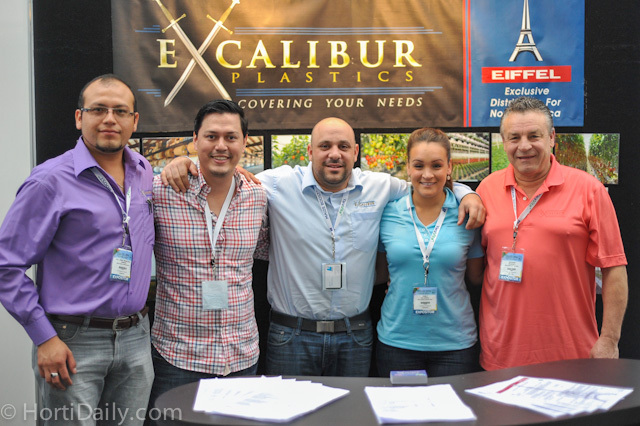 Richard and Yamila Colasanti of Excalibur together with Pedro Torres of Excalibur Mexico. 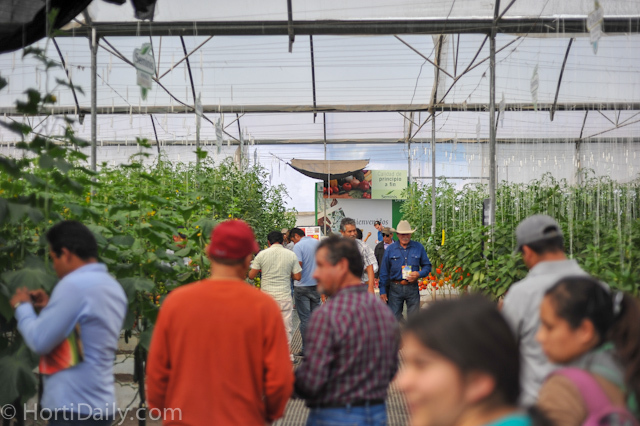 All of the demonstration greenhouses were very crowded. 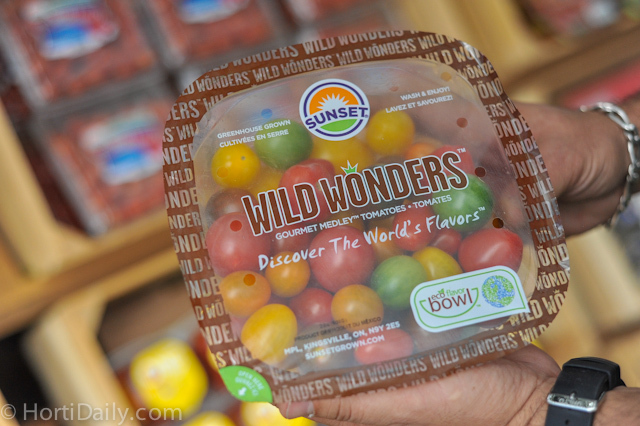 The new Wild Wonders of Sunset. 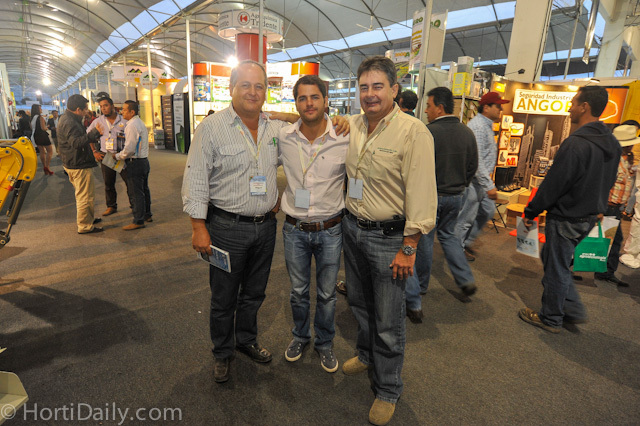 Three representatives of NatureSweet visiting the show and trials. 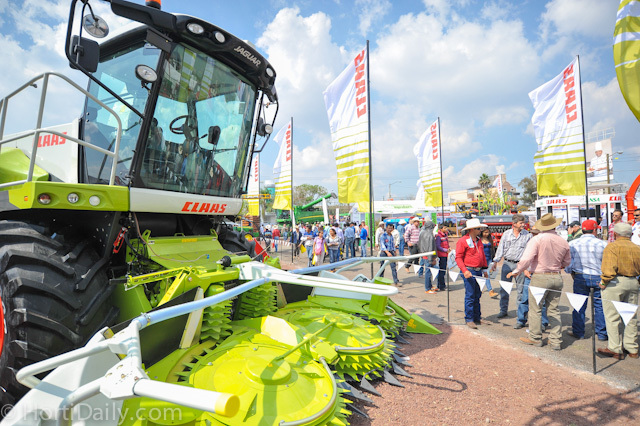 The De Ruiter mid tech demo. 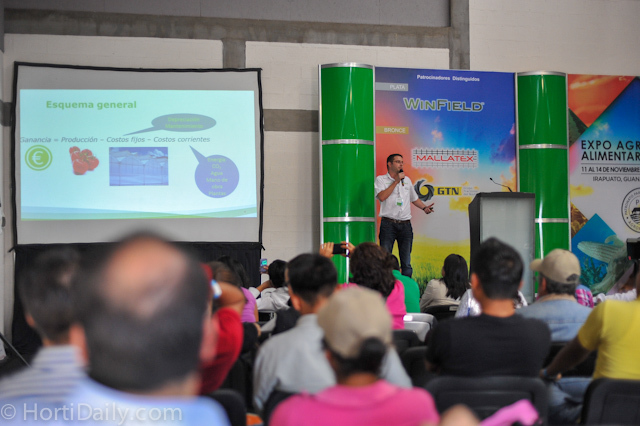 FilClair's Nicolas Hernalsteen during a seminar on their patented greenhouse structure. 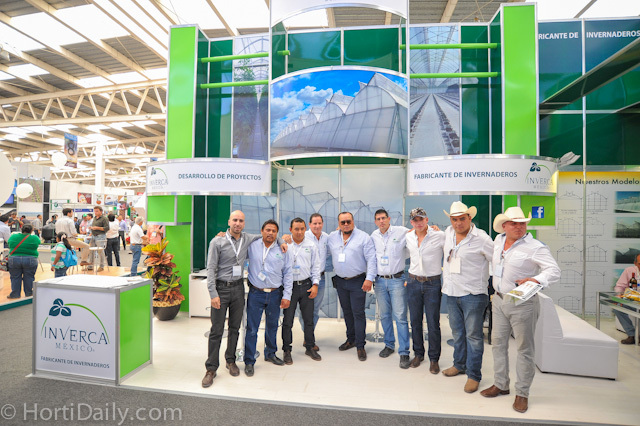 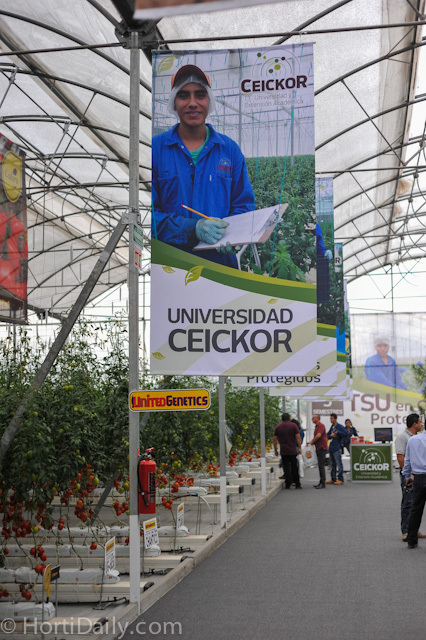 The French greenhouse constructor FilClair is involved in many nice projects in Mexico. 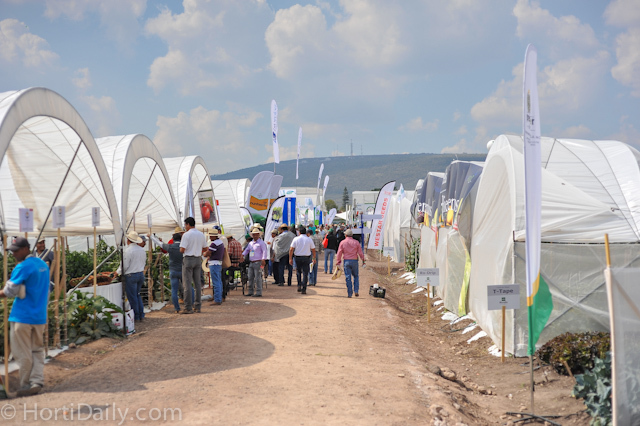 Last year they built SunnyFields' 6 hectare expansion at the AgroPark in Querétaro. 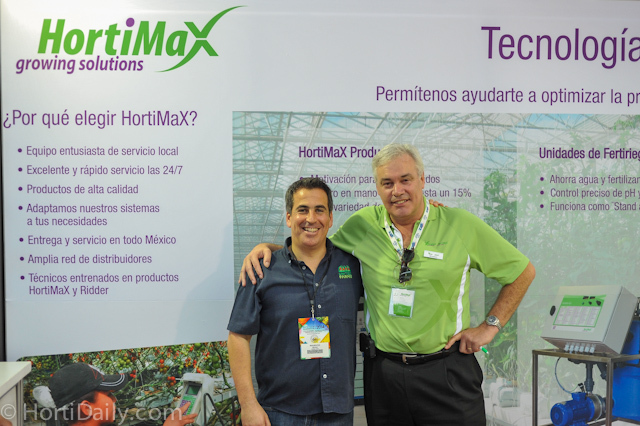 Bram Vanthoor of HortiMax Mexico gave a presentation on decreasing costs in greenhouse horticulture. 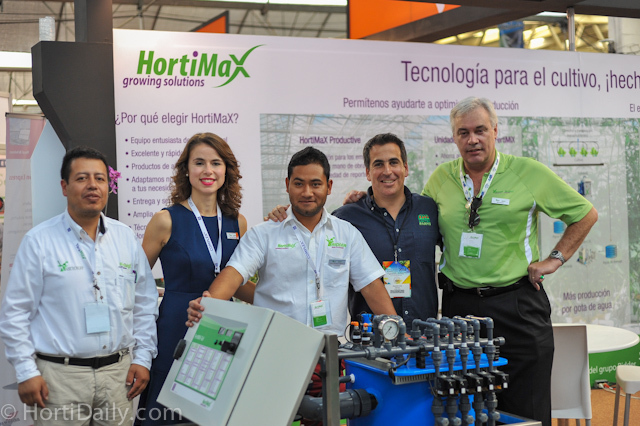 Dennis de Zeeuw (second from left) has started a new Mexican based enterprise called DQ Horti-Soluciones. 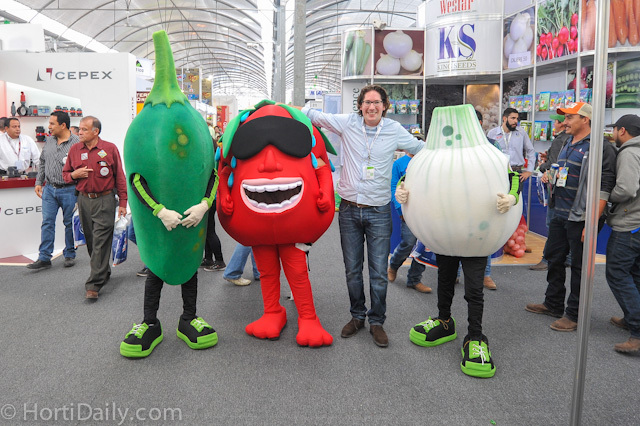 He is now representing companies as Holland Gaas, Holland Scherming, Hortimat, C&E Tomato Hooks and Relab den Haan. 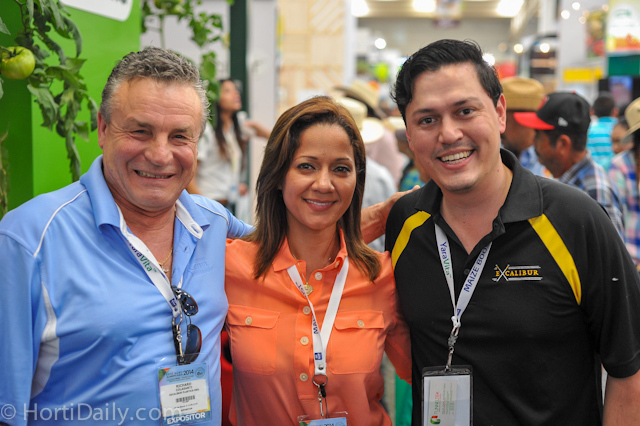 Richard Billekens and his wife Emma Zarate enjoying a beer with Costa Rican grower Randall Fallas of Del Monte. 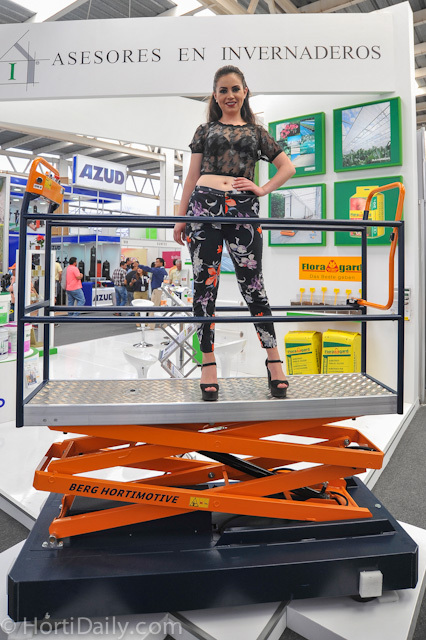 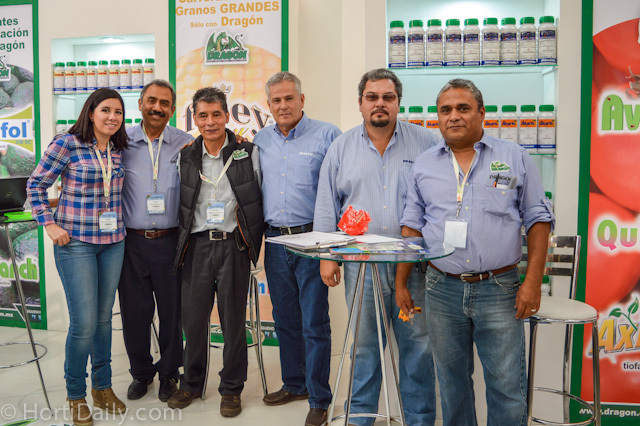 A large Brazilian delegation visited the show on Wednesday. 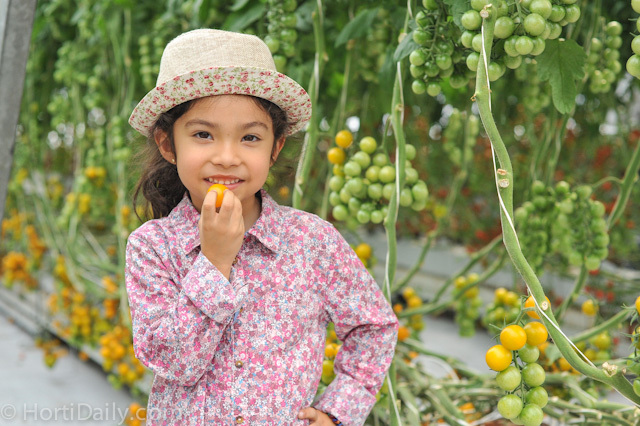 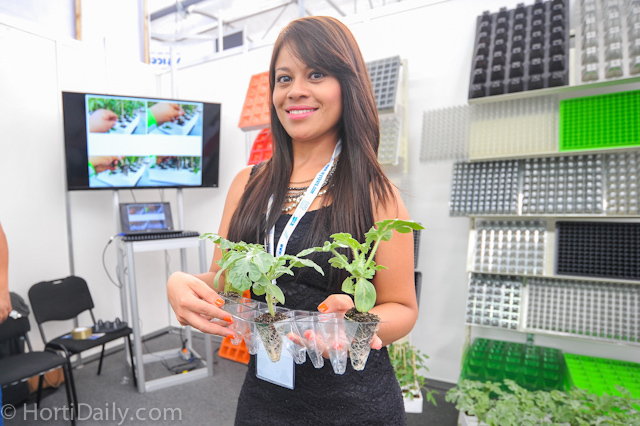 Adriana Sutherland Galimberti is building the first high tech greenhouse in Brazil. 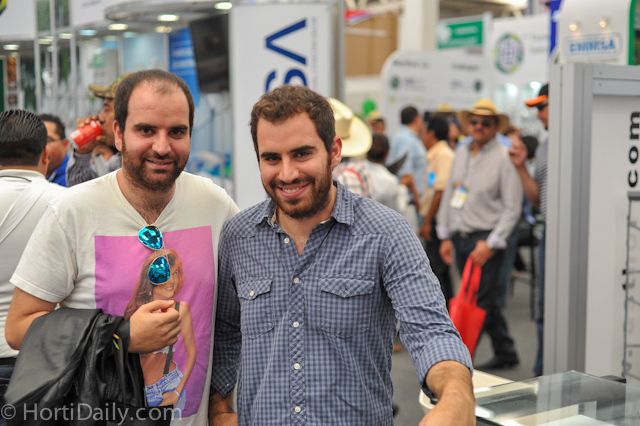 She visited the show together with the delegation of Andres Da Silva. 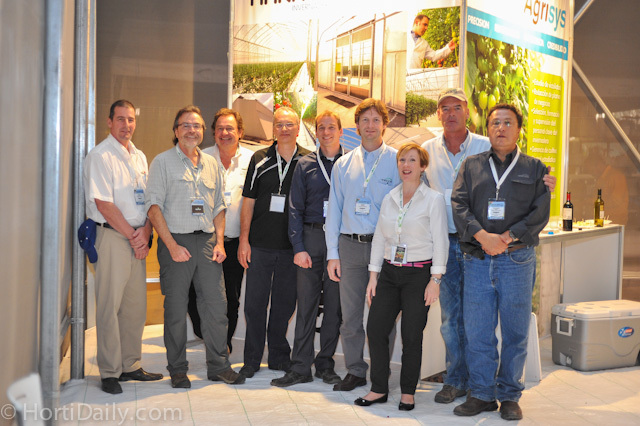 The team from Harnois at the cocktail that was held in their Luminosa greenhouse on Wednesday night. 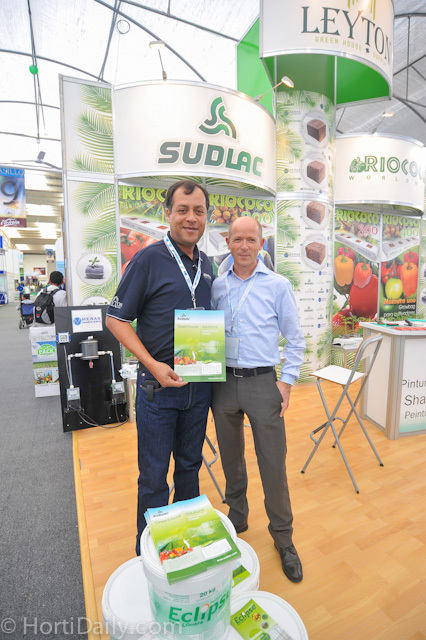 Eduardo Salcedo of De Ruiter. 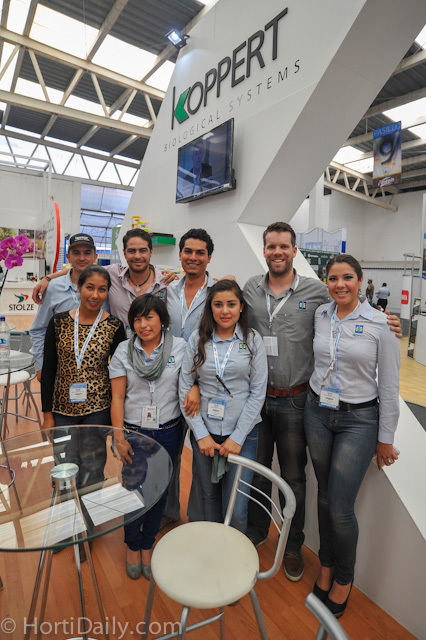 The team from De Ruiter Mexico in the mid tech demo house. 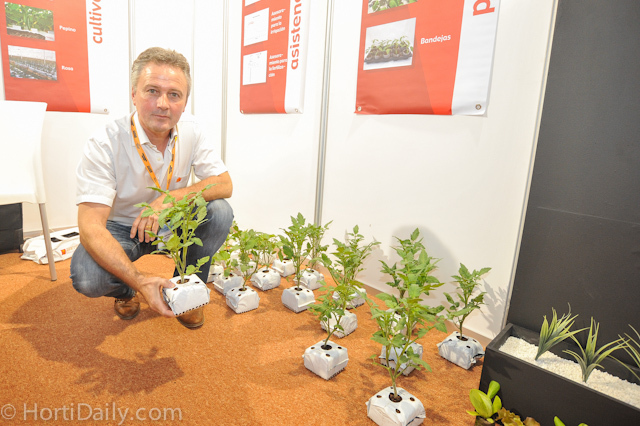 De Ruiter's high tech trials. 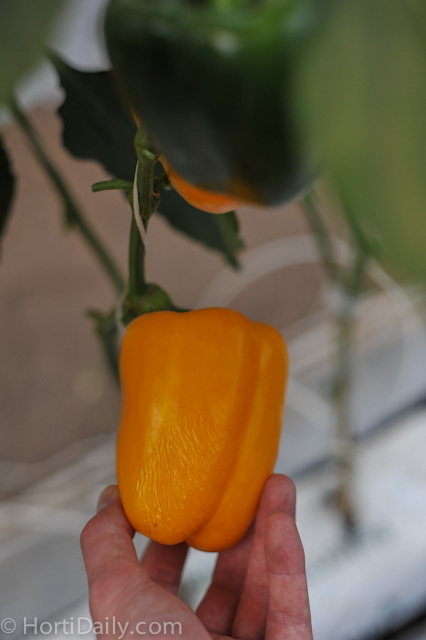 De Ruiter has developed a new yellow cherry that is actually very tasty. 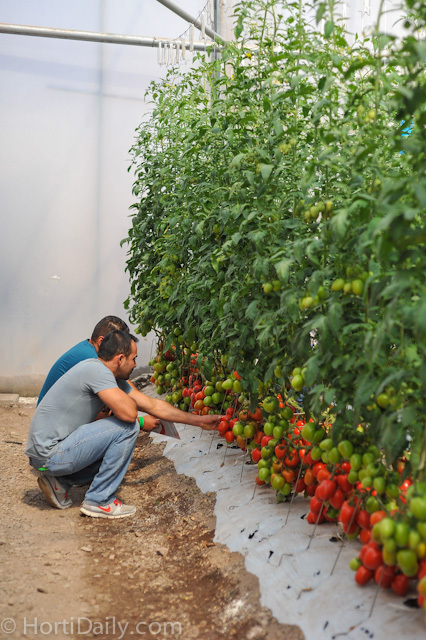 The visitors couldn't resist picking them! 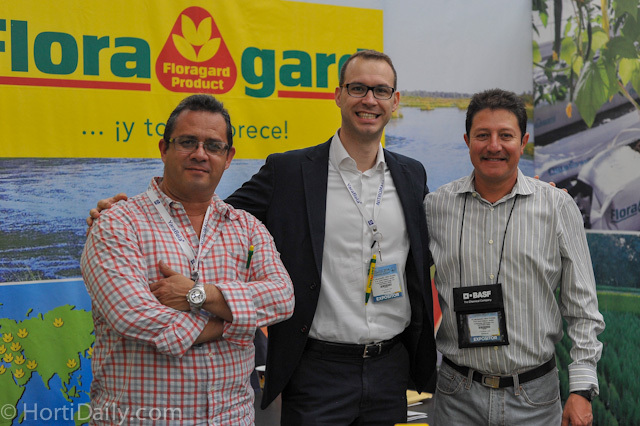 Ernesto, Nuno and Jose of FloraGard substrates. 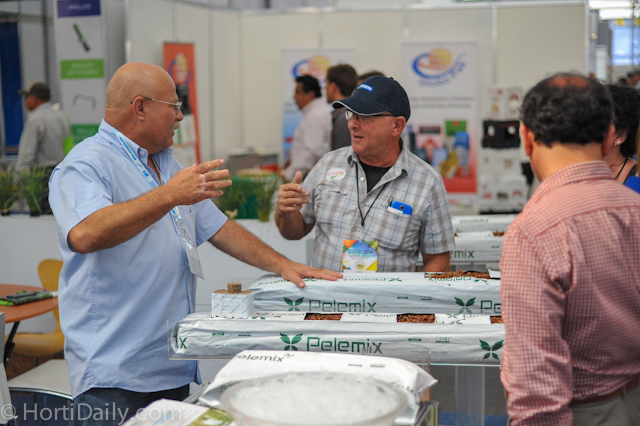 Peter Weiner of Pelemix in conversation with a customer. 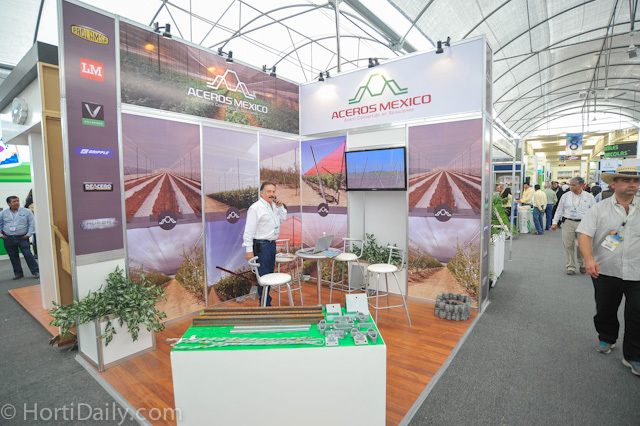 Ricardo Martinez of Asesores en Invernaderos. 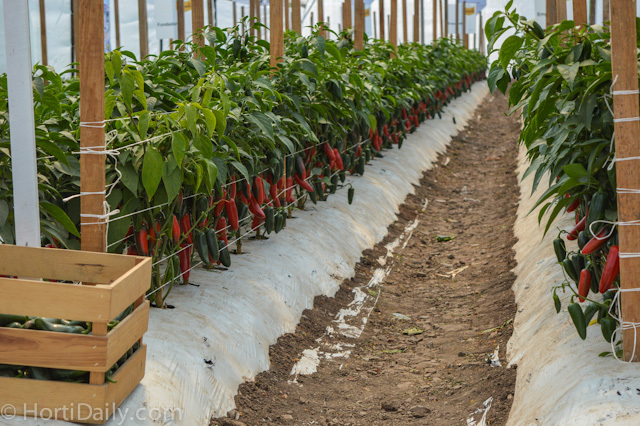 Not so good looking Hazera peppers in the trial greenhouse, the entire row was like this, something went wrong. 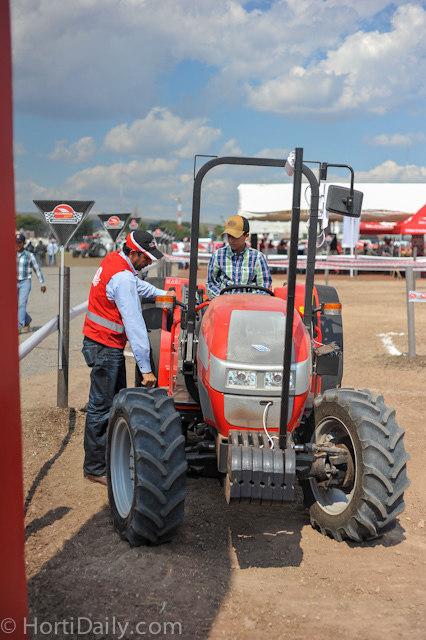 Besides the seed trials, many tractor brand offered demo rides. 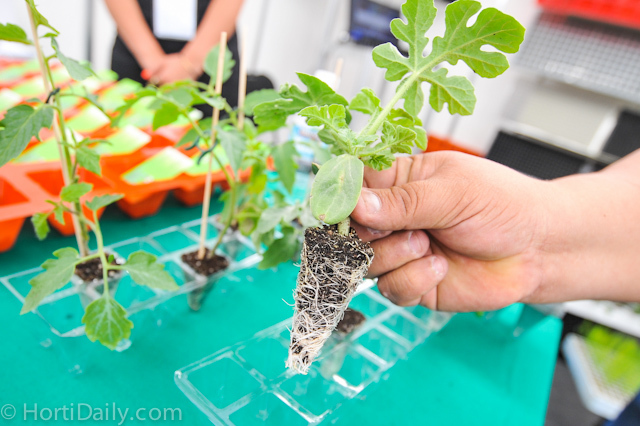 Also propagation blocks could be compared. 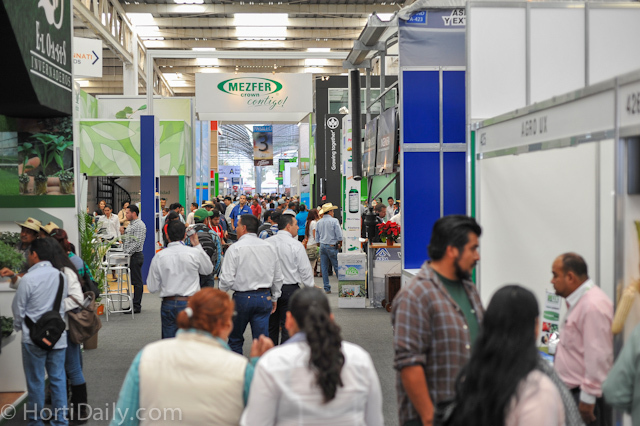 Thursday was a really busy day. 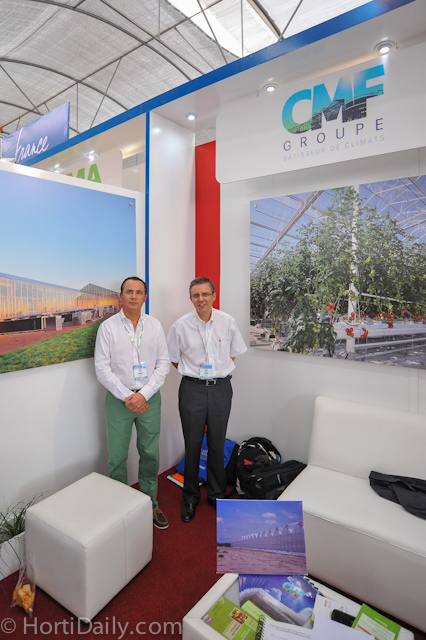 Raul Suarez and Renaud Josse of CMF. 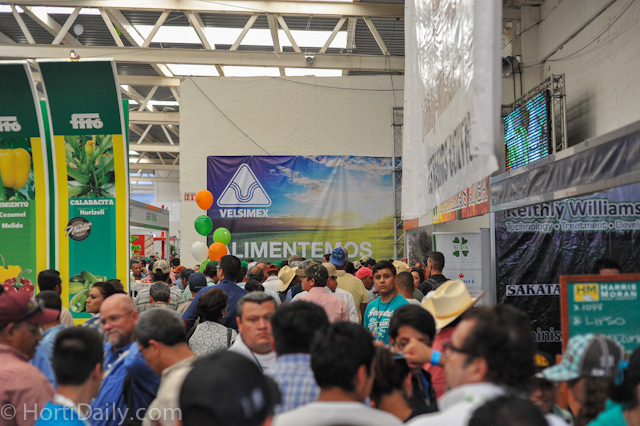 It was busy at the booth of Richel Greenhouses. 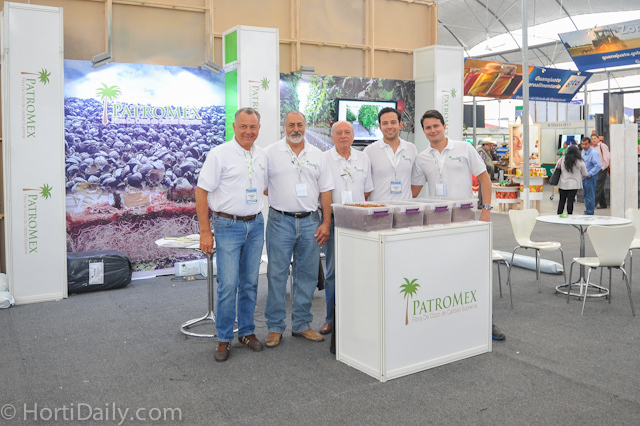 The entire team of Ridder / Hortimax together with Mauricio Revah of United Farms. 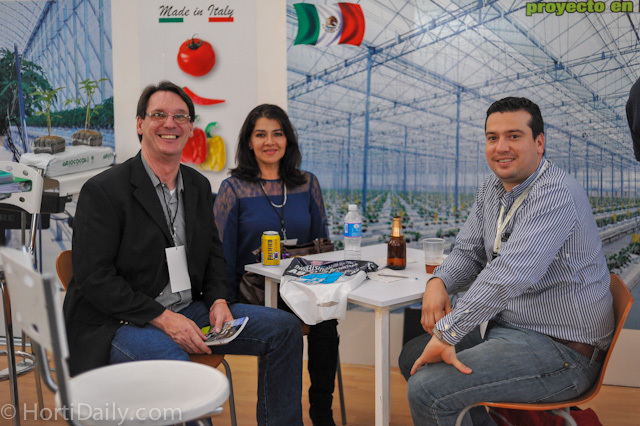 P-TRE's Michele Pavano and Gabiele Roncaletti together with their hostess Pamela. 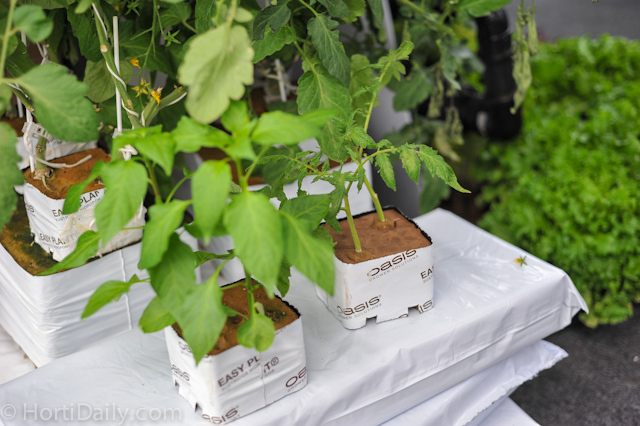 Oasis propagation cubes and growbags. 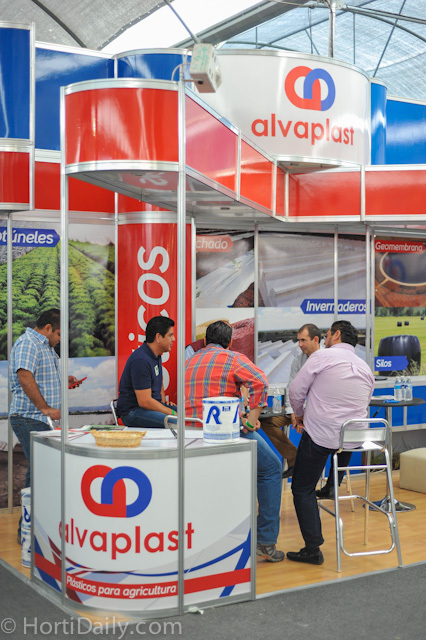 Plastinver is the Mexican distributor for Millenniumsoils coir. 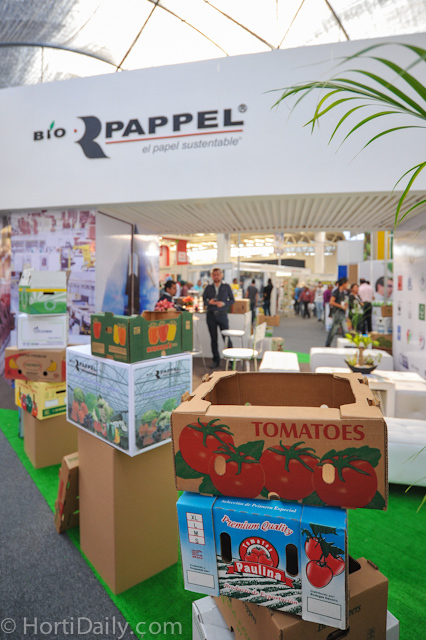 Also a lot of packaging was on display on the show. 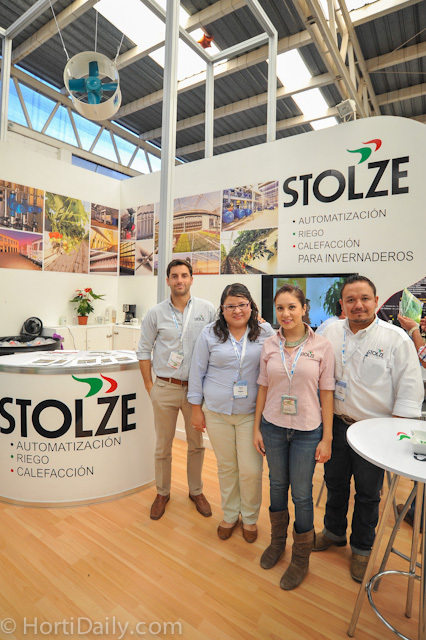 The team from Stolze Mexico. 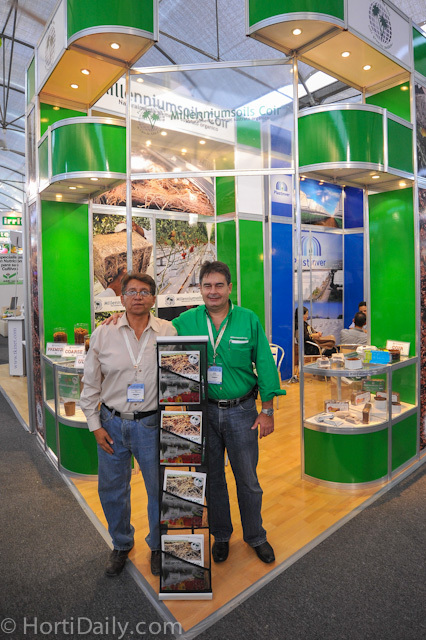 Hector Lafuente and Manuel Guerrero of Asthor. 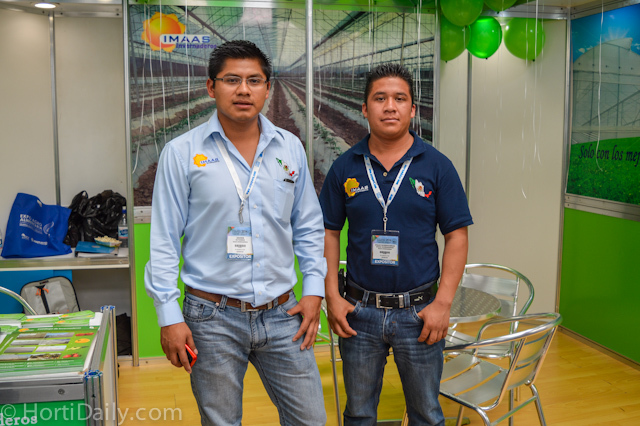 Esteban and Juan of Enza Zaden Mexico. 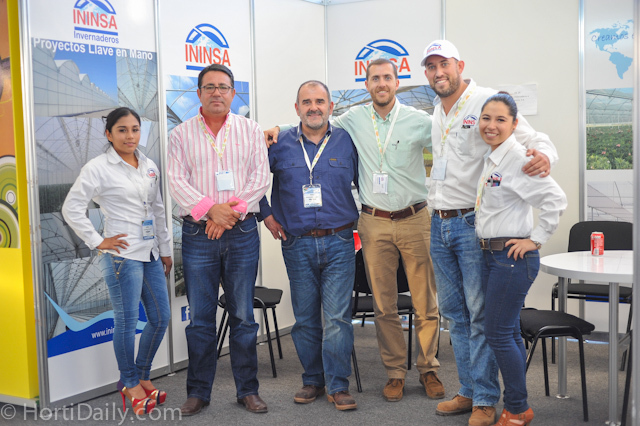 The team from ININSA Greenhouses. 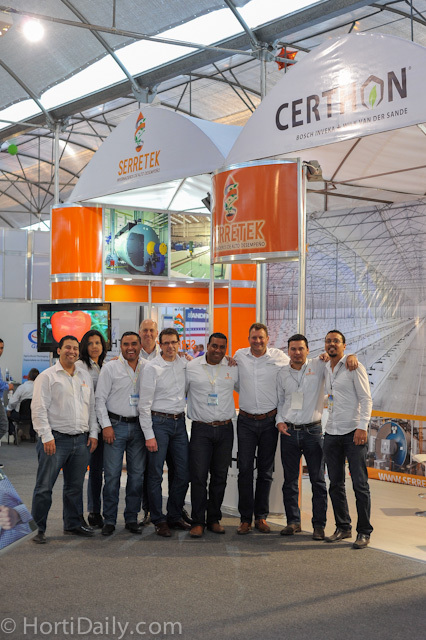 The team of Serretek and Certhon. 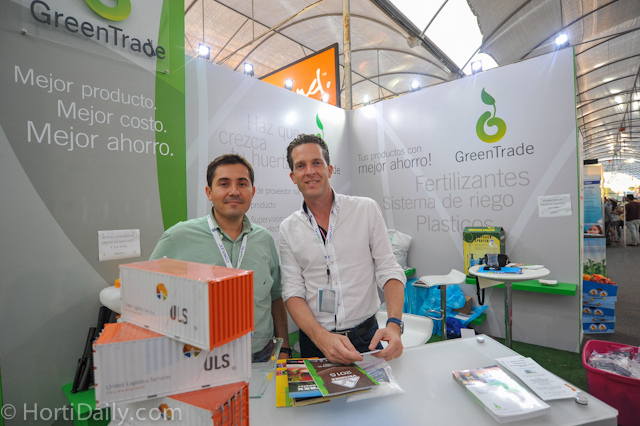 Armando Gonzalez and Sjef Minke of GreenTrade. 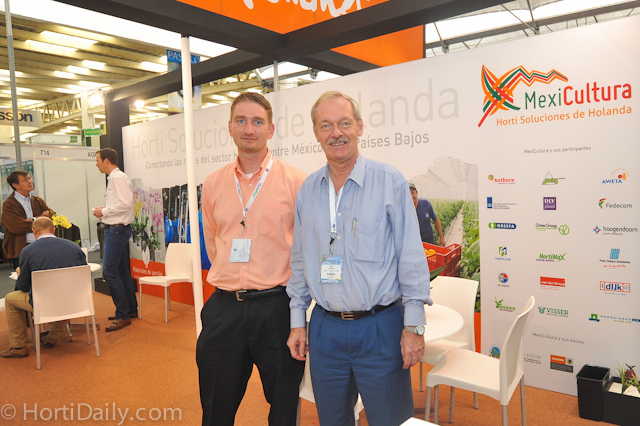 Frank Hoogendoorn of the Dutch Embassy together with Agricultural counselor Jean Rummenie. 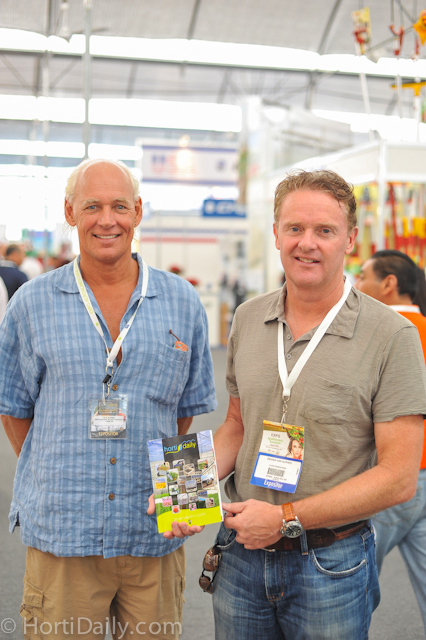 The team of Prins Greenhouses North America : Geert van Veen and Marcel Vyverberg. 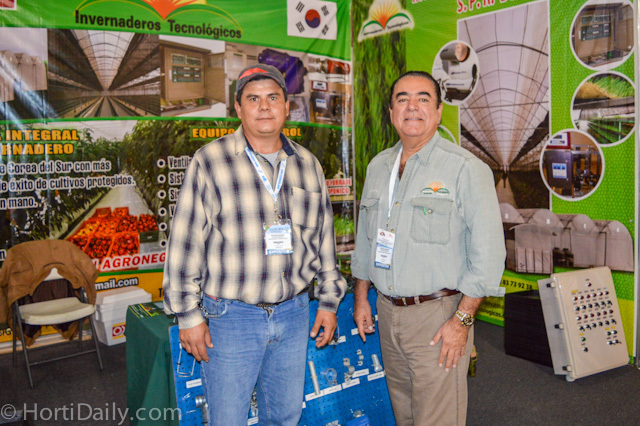 Tim Larson of Fiberdust with distributor and grower Fidel Ochoa of FloraMundo. 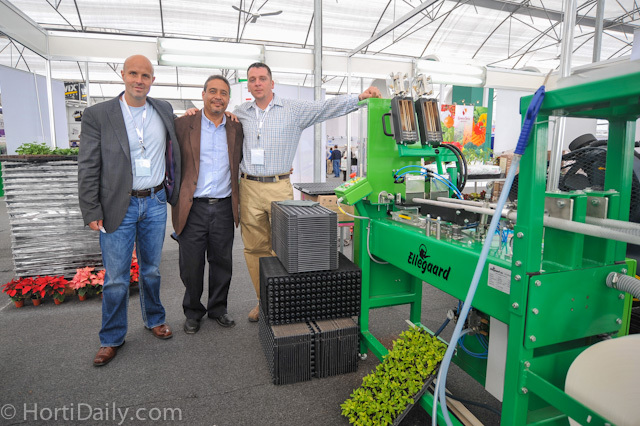 Lars Jensen of Blackmore / Ellepot USA together with Fidel Ochoa of FloraMundo and Tim Larson of Fiberdust. 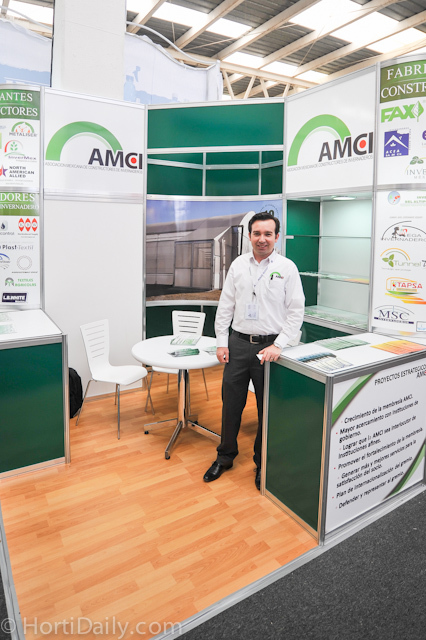 Francisco Ojedo of AMCI: the association for Mexican greenhouse builders and suppliers. 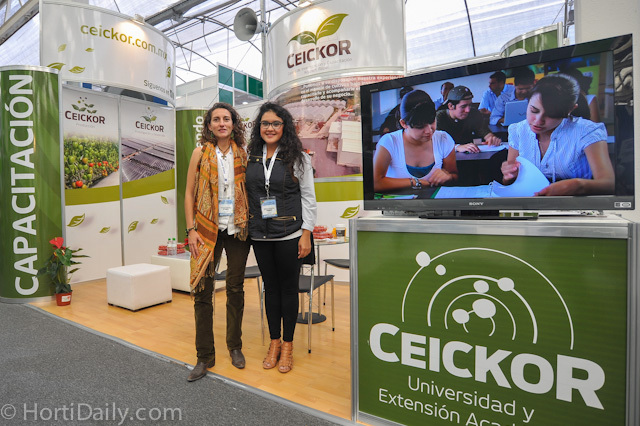 Berta Diaz and Aranza Martinez of Ceickor. 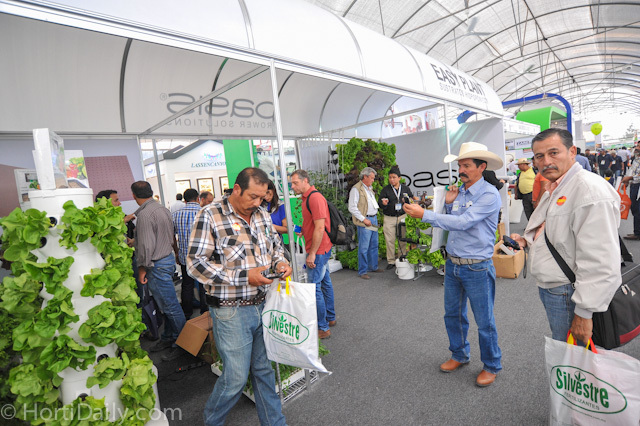 Many interest in OASIS hydroponic systems. 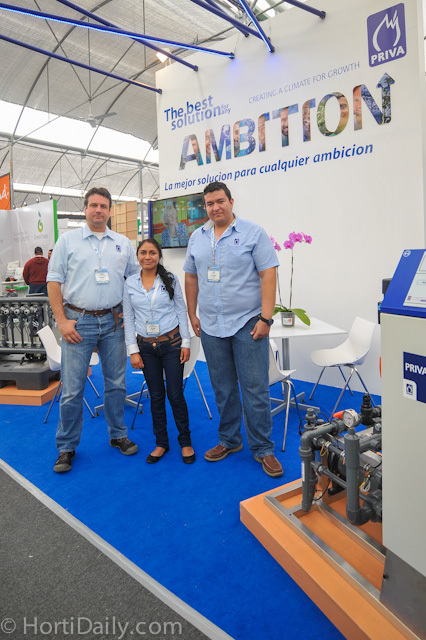 Maarten Hartong, Isela Alvarez and Javier Ojedo of Priva Mexico. 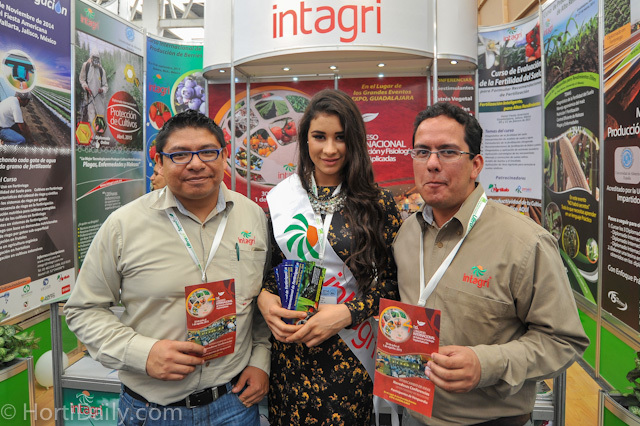 This girl had a lot to say about Innophos fertilizers. 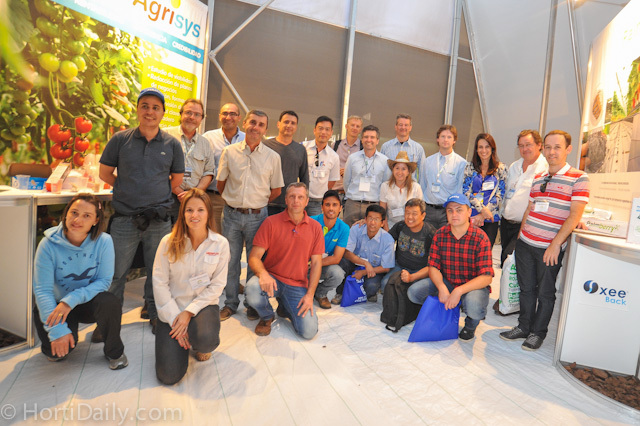 The team from Asesores en Invernaderos together with the group of Ducth suppliers. 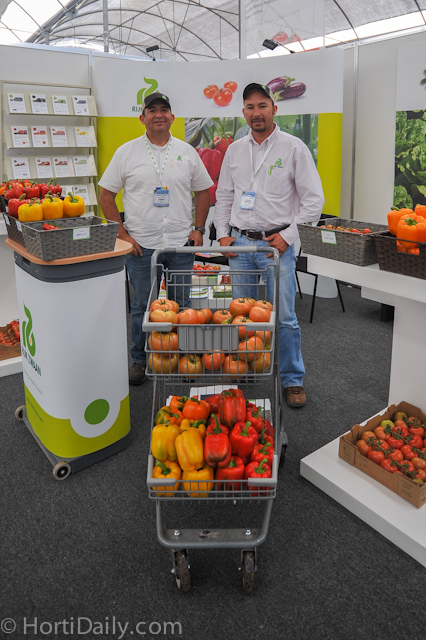 Humberto and Sixto of Rijk Zwaan Mexico. 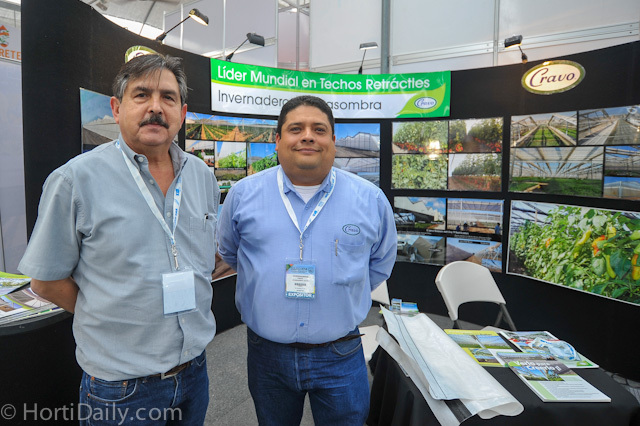 Hector Galza and Carlos Ruiz of Cravo. 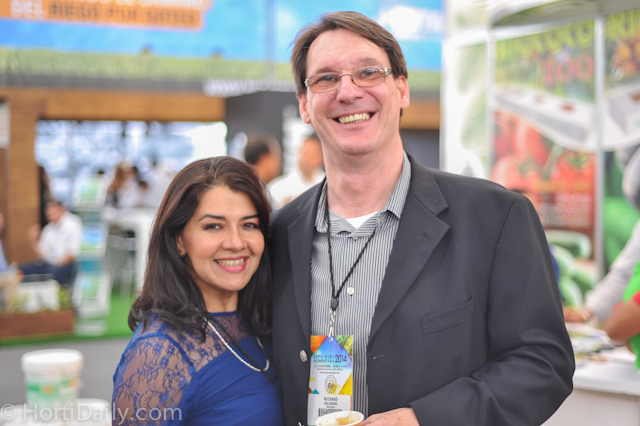 United Farms technical maintenance manager Enrico Verhoef together with his wife Nallely. 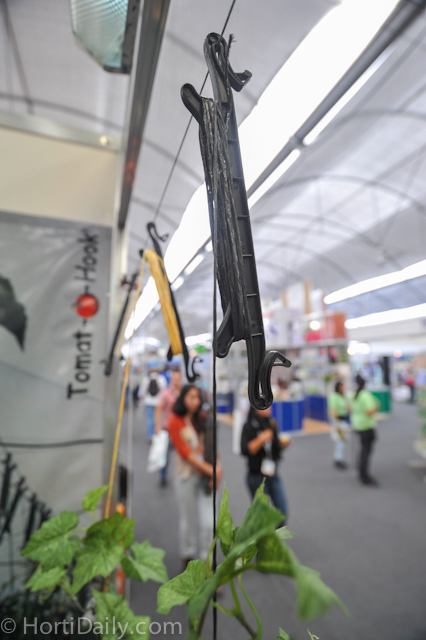 ATB supplies and winds greenhouse hooks and twines. 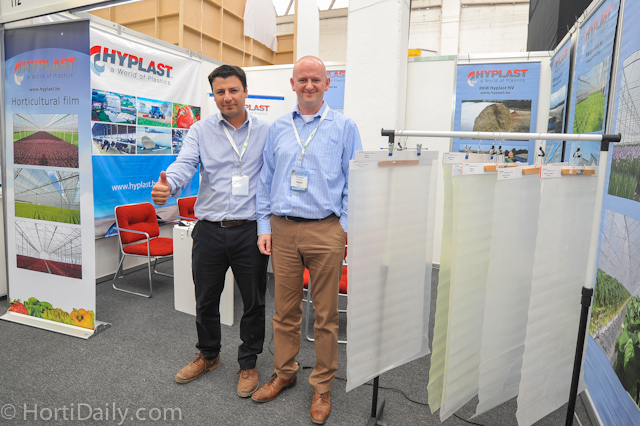 Tom de Smedt from Hyplast together with the Mexican distributor of Hyplast; Carlos Reátegui del Mazo. 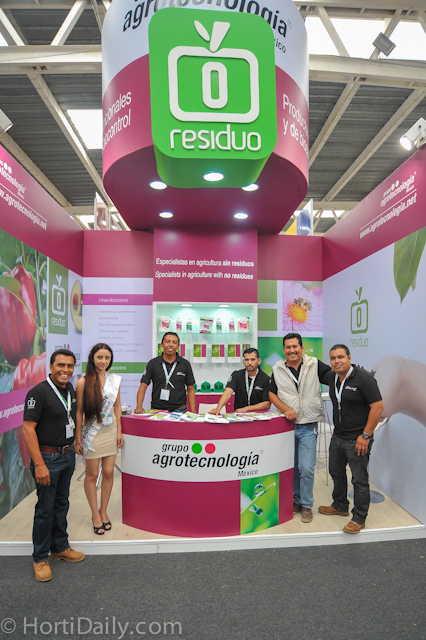 The team of Grupo Agrotechnologia. 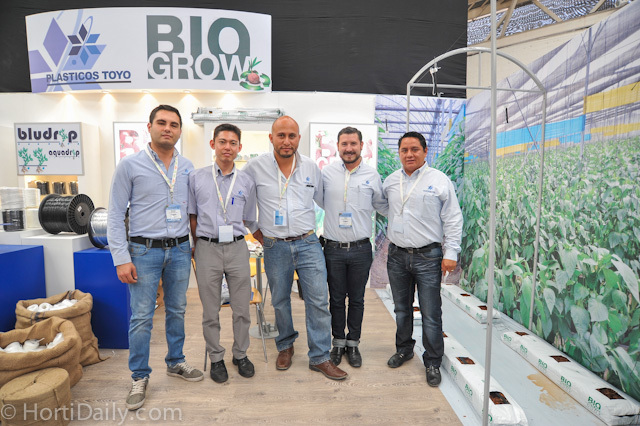 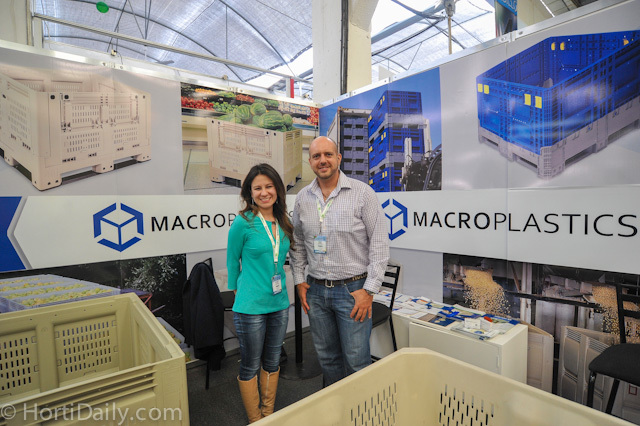 Plasticos Toyo is the Mexican distributor of Bio Grow. 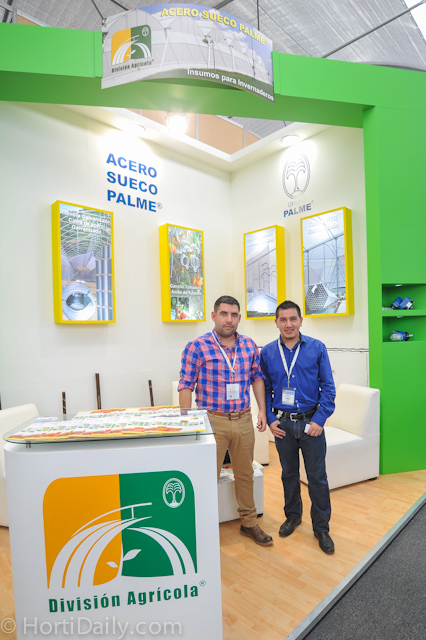 The team of Acero Sueco Palme S.A.P.I. 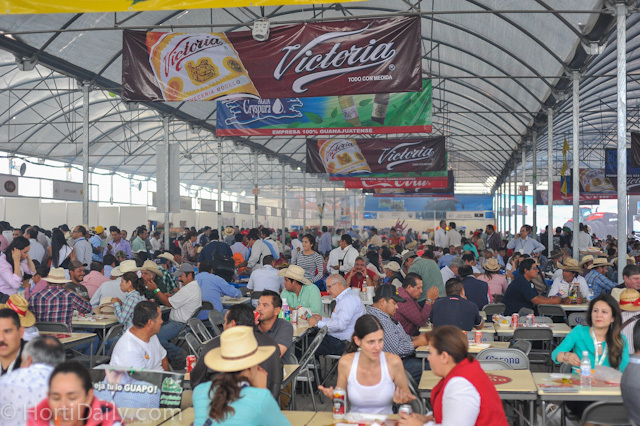 de C.V. 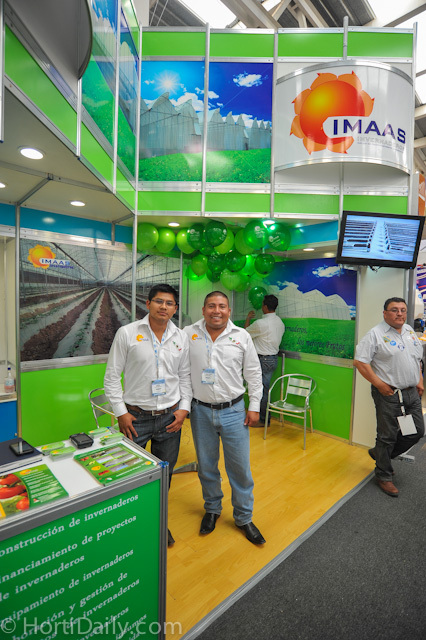 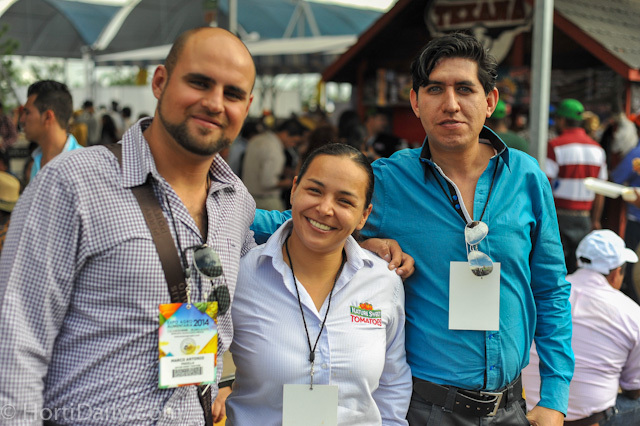 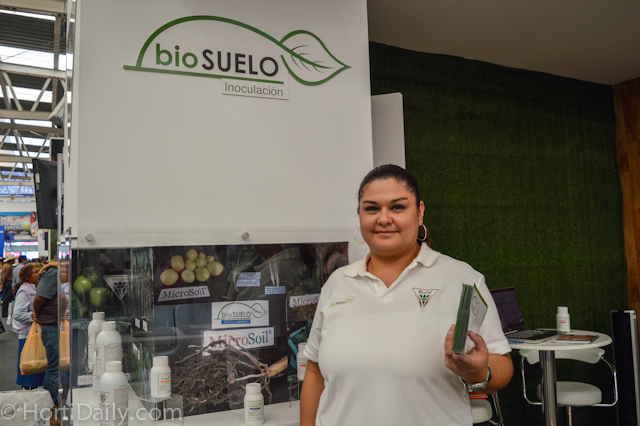 Representatives from Expo Agro Sinaloa. 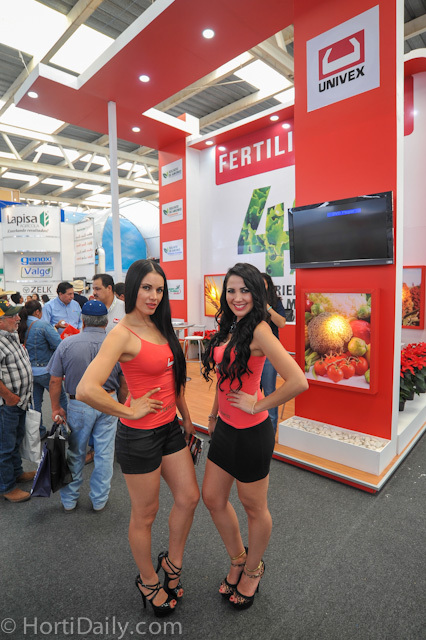 Fued Alle Arechavaleta from J.Huete Mexico. 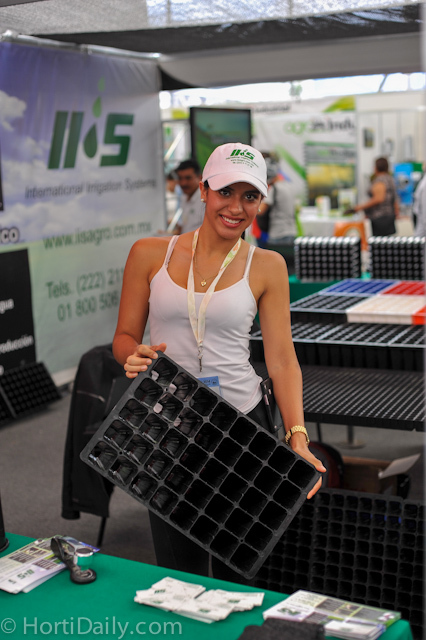 Propagation trays by RC Tools. 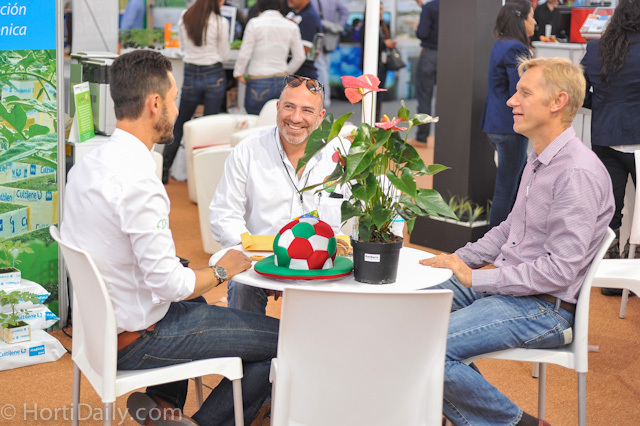 Orlando and Rodrigo from Tipo. 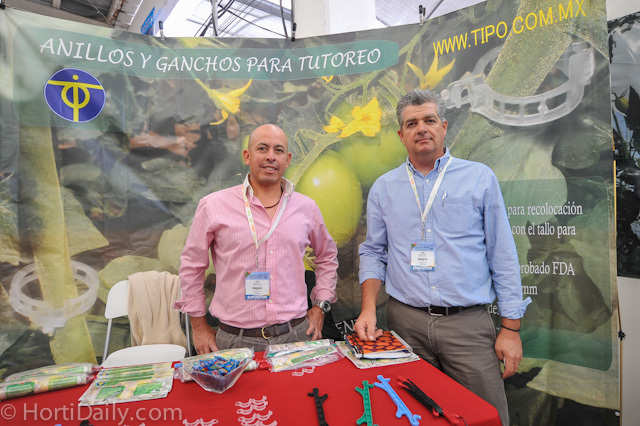 Showcasing plastic tomato hooks at the tipo booth. 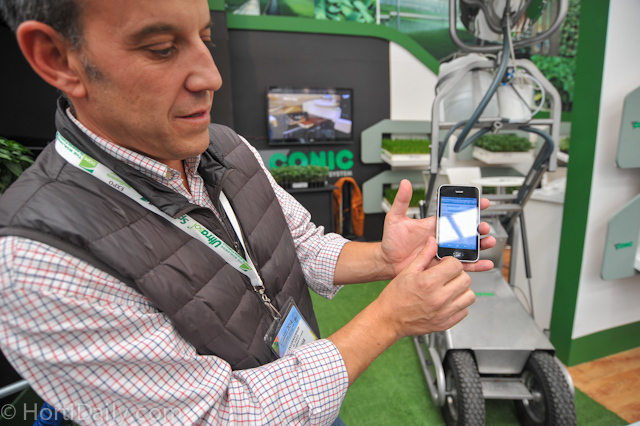 Joan showing that he reads the HortiDaily newsletter on his mobile phone. 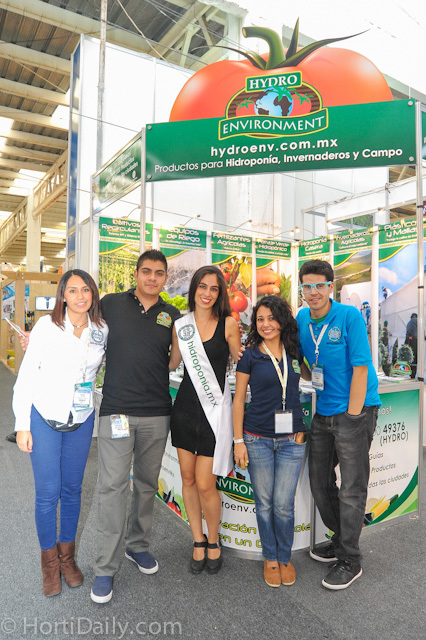 The team of El Oasis Invernaderos. 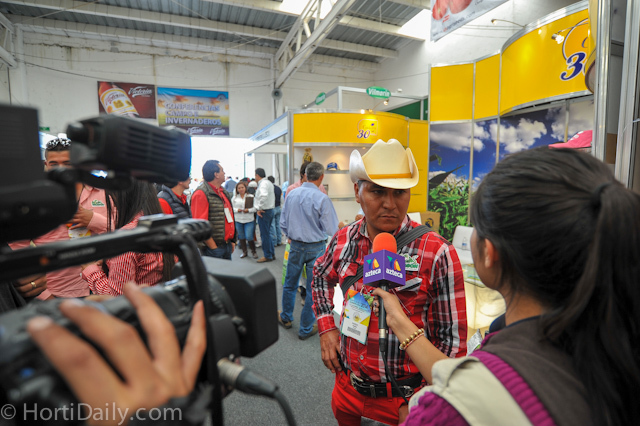 A local Mexican TV station interviewing visitors of the show. 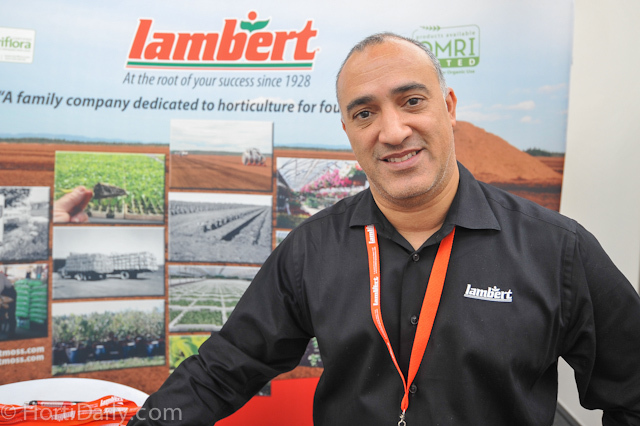 Richard De Quesada from Lambert Peat Moss Inc. 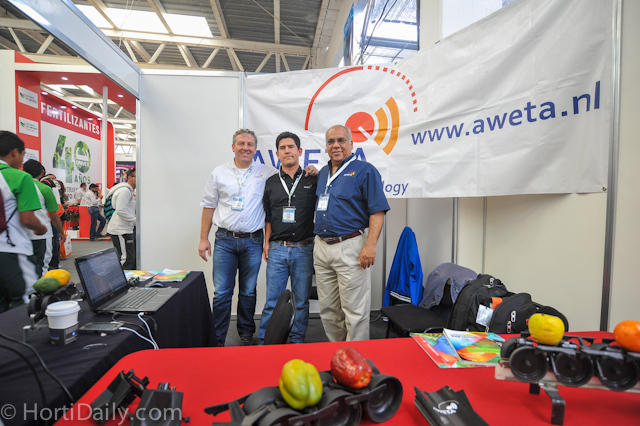 The team of Aweta Mexico. 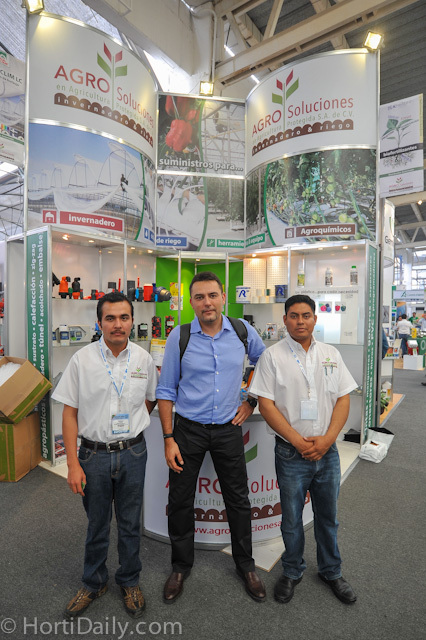 Jose Gongora from Agripolyane and Geopolyane visiting his distributors from Agro Soluciones. 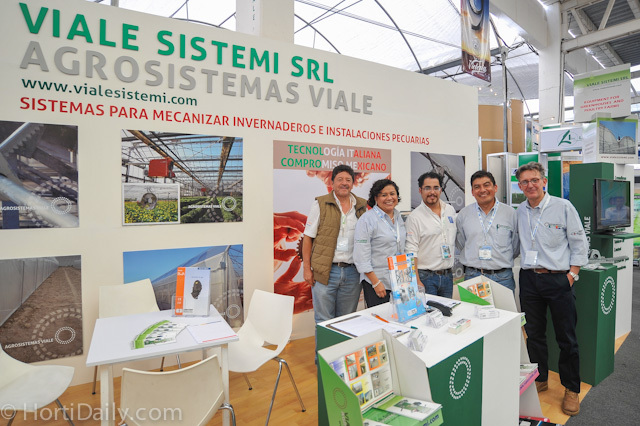 The Team of Viale Sistemi SRL. 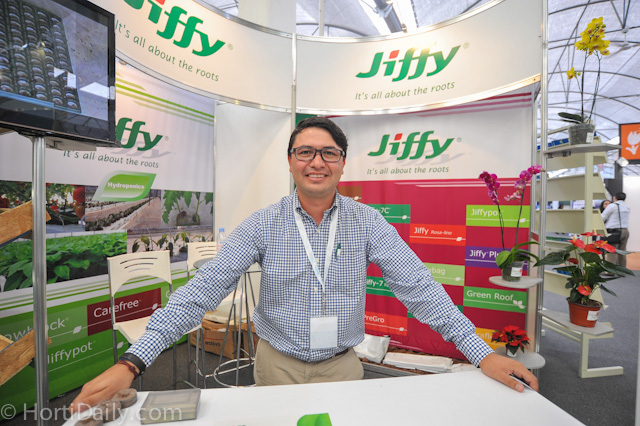 Guillermo Gonzalez Rivera from Jiffy. 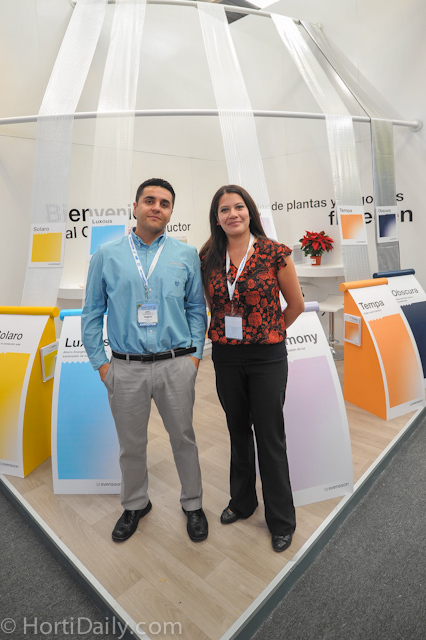 Jorge Gonzalez and Verónica Cortés from Svensson. 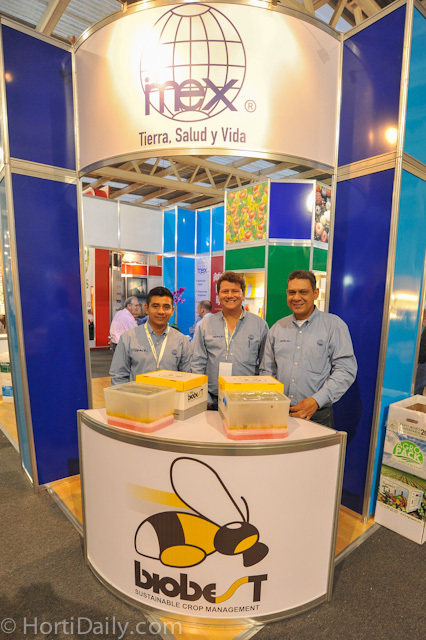 Biobest bees at the Imex booth. 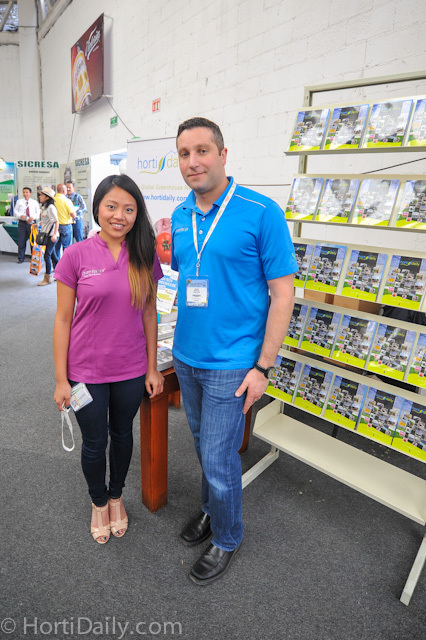 Sarah Pau and Jamie Moracci from PureFlavor in front of the HortiDaily booth. 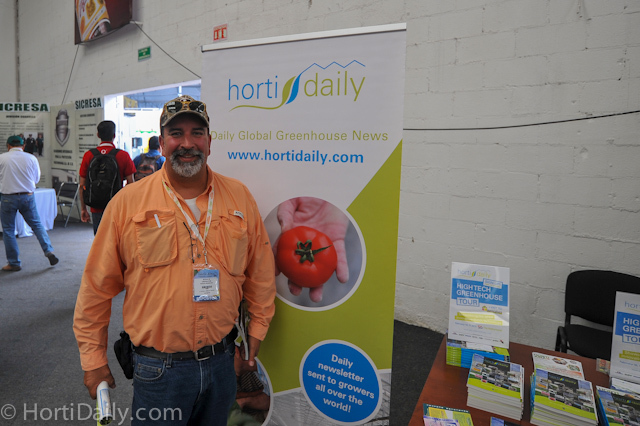 Costa Rican Grower Randall Fallas from Del Monte in front of the HortiDaily booth. 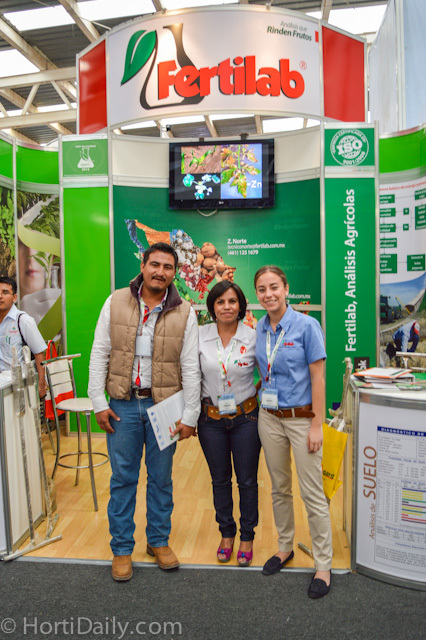 Ben Sosef and Emily Middendorp from Royal Brinkman welcoming a Mexican grower at their booth. 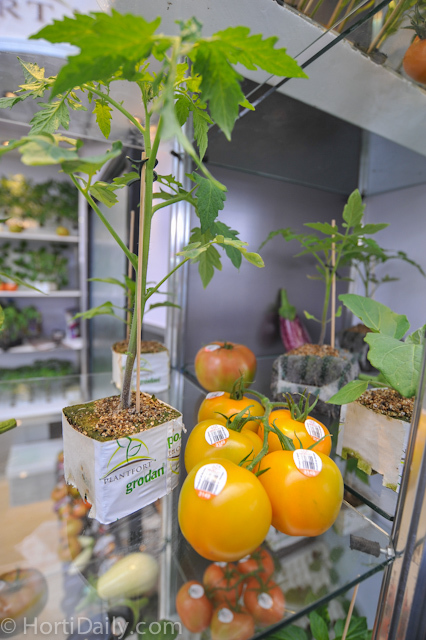 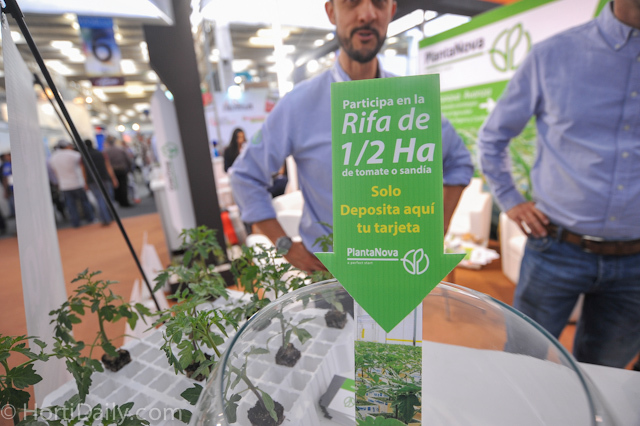 At the booth of PlantaNova you could winn a half hectare of young plants. 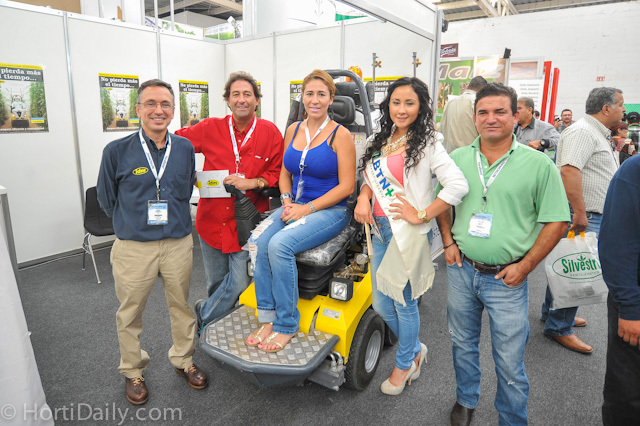 Pharis Rico, Gabriela Reygoza, Freddy Weel and Armando Lopez from PlantaNova. 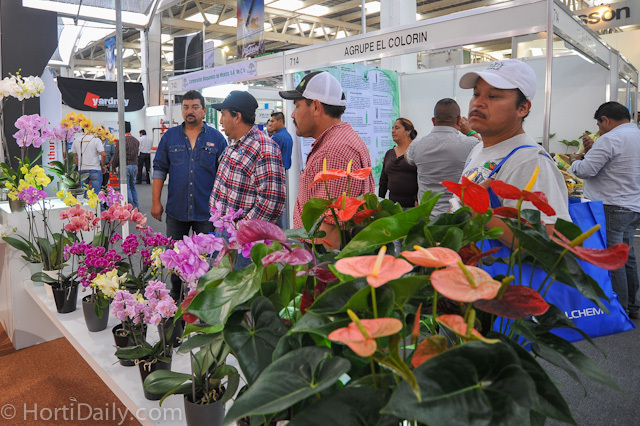 The Phalaenopsis and Anthuriums from Anthura attracted a lot of attention from the Mexican growers. 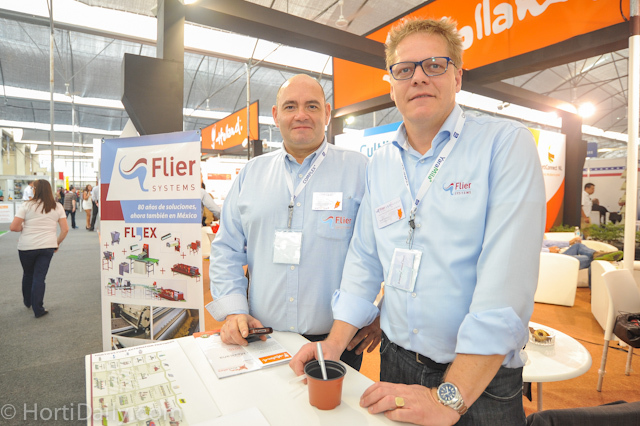 José Carretero Perez and Sjaak Bakker from Flier Systems. 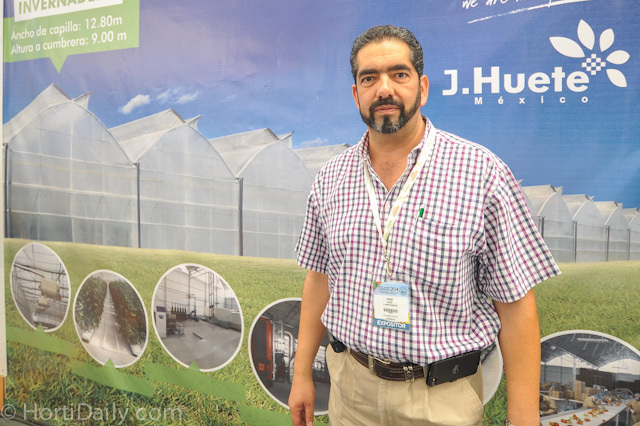 An interview with José will follow on HortiDaily.com. 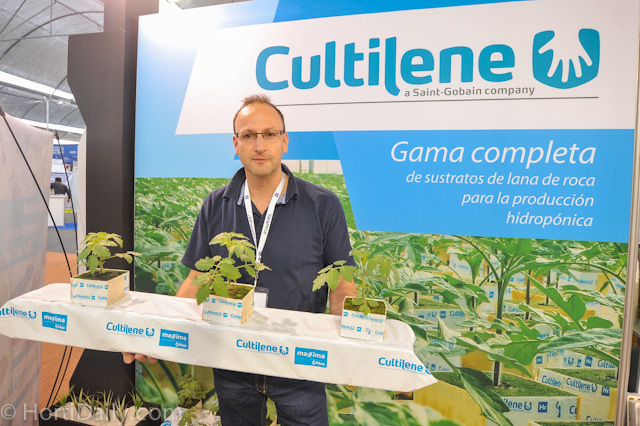 Serge Pas from Cultilene showing Cultilene Maxxima Rockwool Grow Slabs. 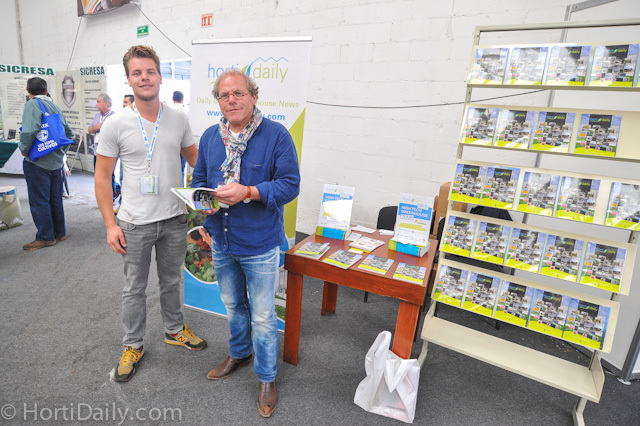 Editor Boy De Nijs, HortiDaily.com together with some vegetables from De Ruiter. 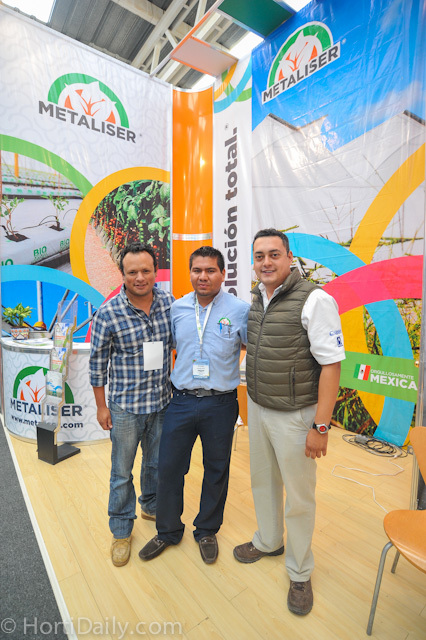 Eduardo, Ulises, and Gabriel from Metaliser. 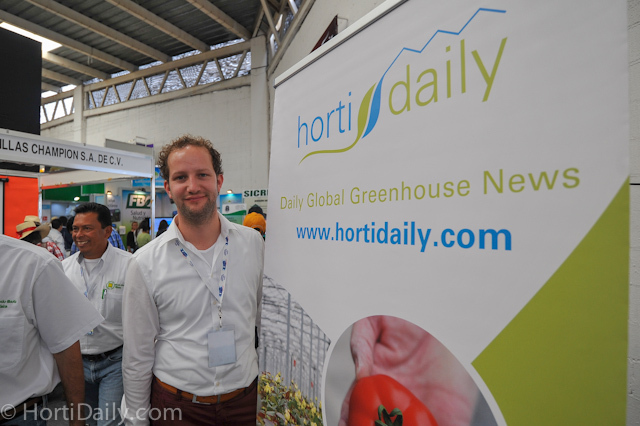 Robbert Duijndam and Bert Duijndam from Duijndam Machines B.V. in front of the HortiDaily booth. 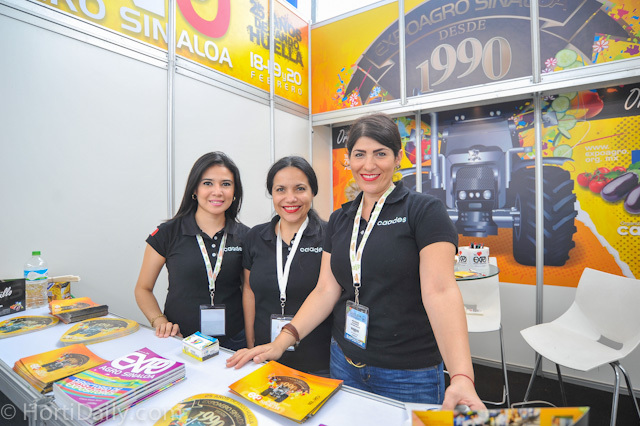 Also Atlántica was present at the show. 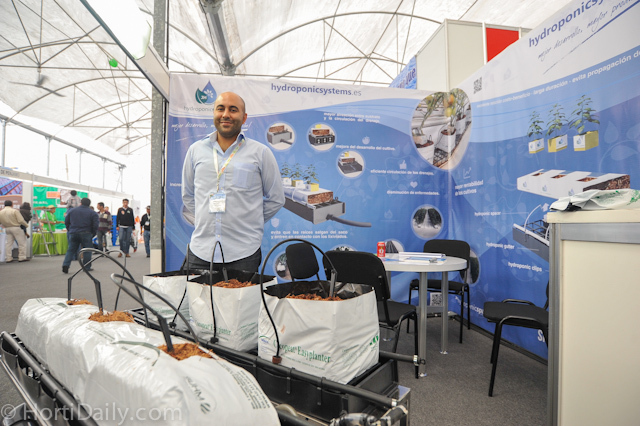 Vahid Bagheri from Hydroponic Systems. 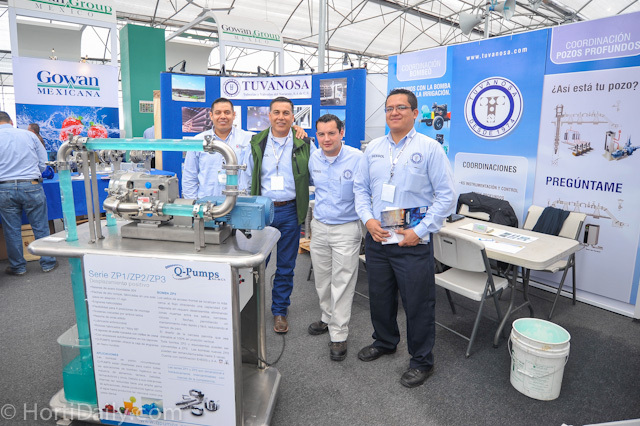 The team from TDS Invernaderos. 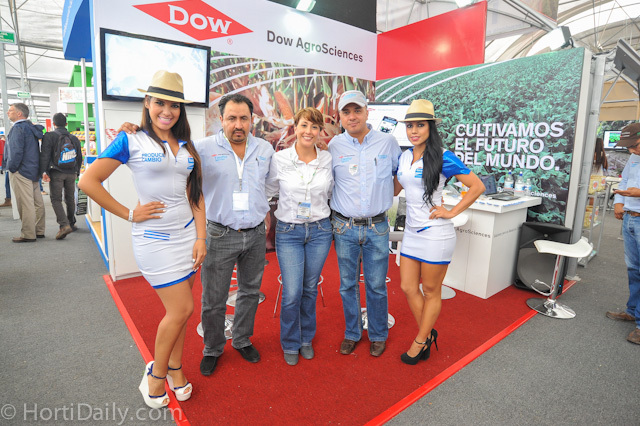 The team from Dow AgroSciences. 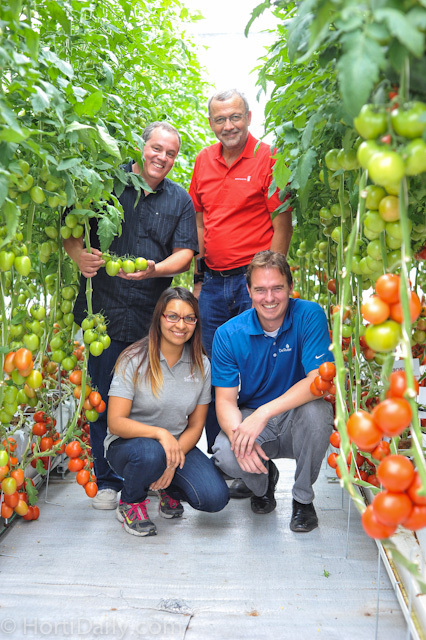 Fried de Schouwer and his team from GPC are exporting Mexican greenhouse vegetables for the North-American market. 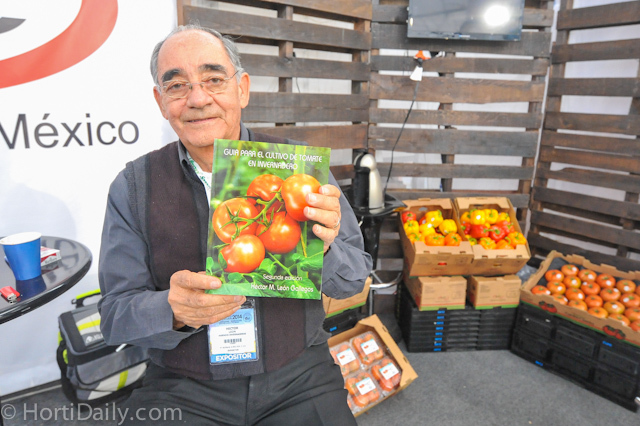 Hector Manuel Leon Gallegos, the author of the guide on hydroponic tomato cultivation: Guia para el cultivo de Tomate en Invernadero. 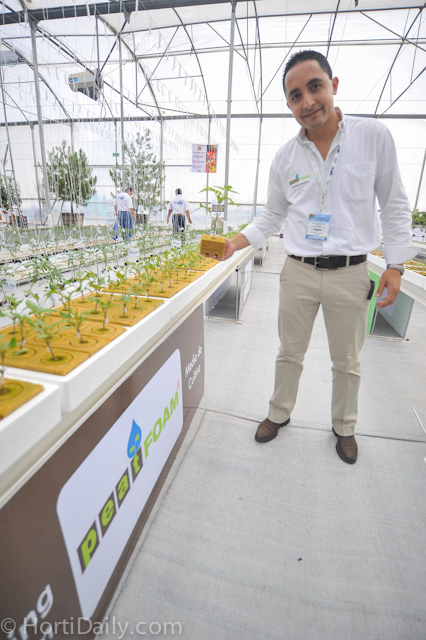 Jan de Smet of FORTECO has success with his coir propogation blocks in Mexico. 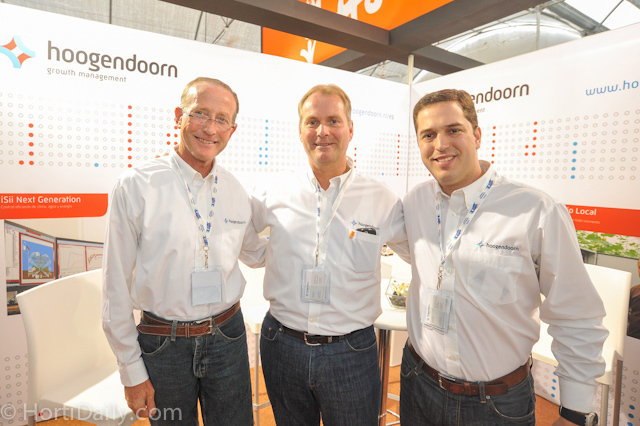 Willem Verkade, Martin Helmich, and Juan Gonzalez from Hoogendoorn. 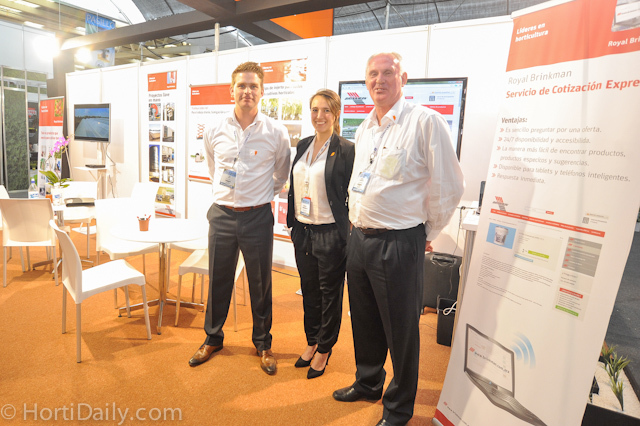 Ben Sosef, Emily Middendorp, and Chris Middendorp from Royal Brinkman. 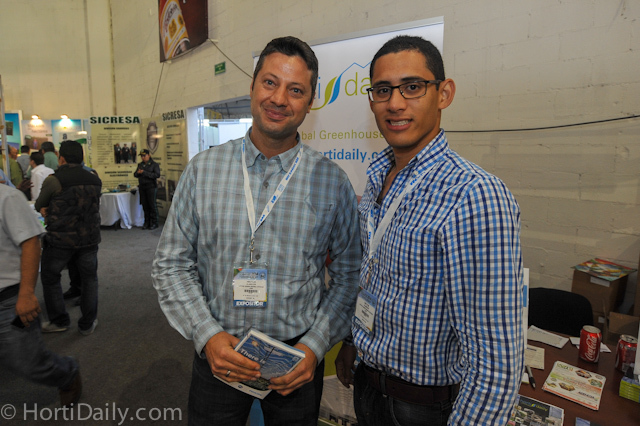 Chris Binfield and Marco Hurtado from Meras Engineering in front of the HortiDaily booth. 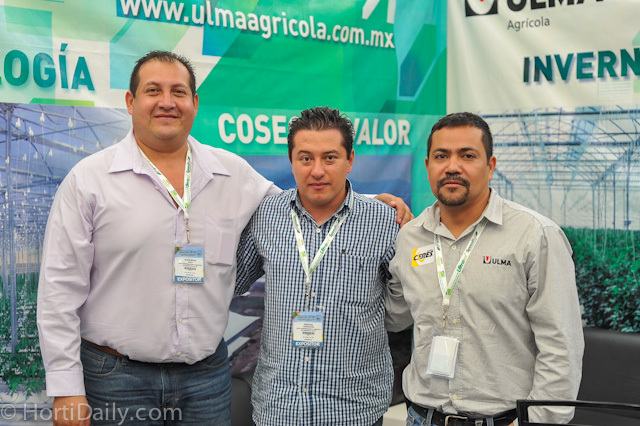 Jorge Escobar from Millenniumsoils Coir together with his nephew (Luis Guillerillo Cabal) and brother in law (Luis Miguel Cabal). 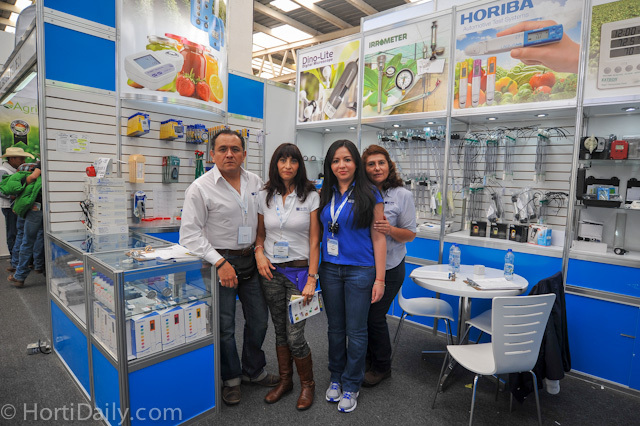 Imex is the Mexican distributor of Biobest. 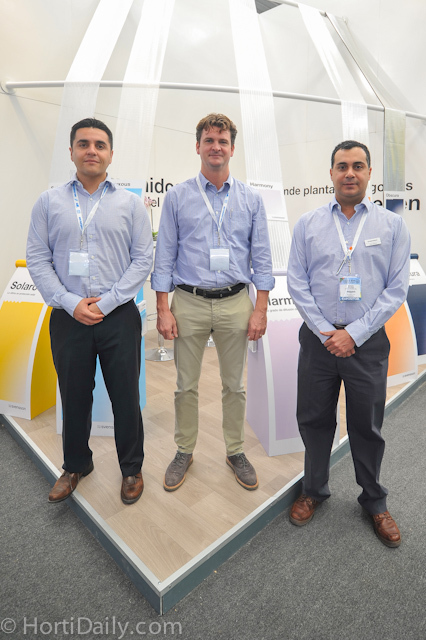 Jorge Gonzalez and Sergio Eulloqui together with Anders Ludvigson, the Vice President of Svensson, who was visiting the show on Thursday. 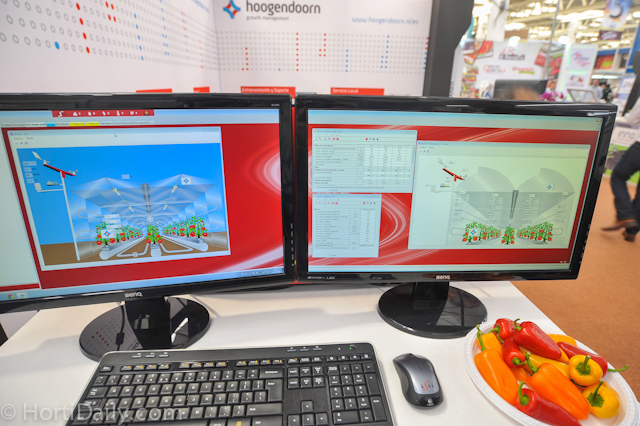 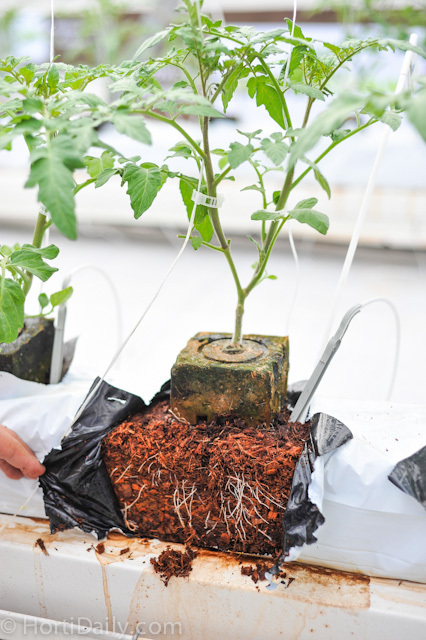 Hoogendoorns platform is suitable for climate control for all types of cultivation and can be easily adapted to local settings and configurations. 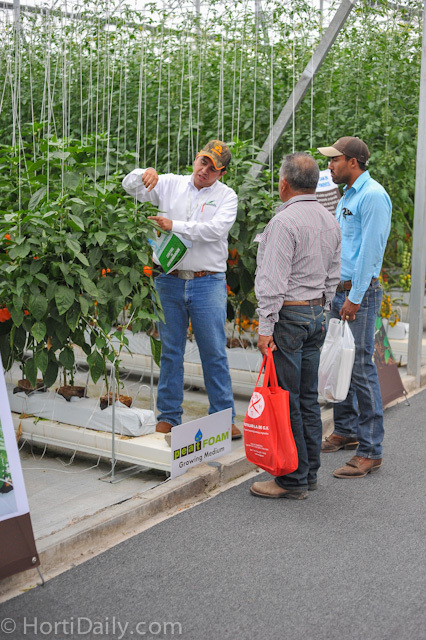 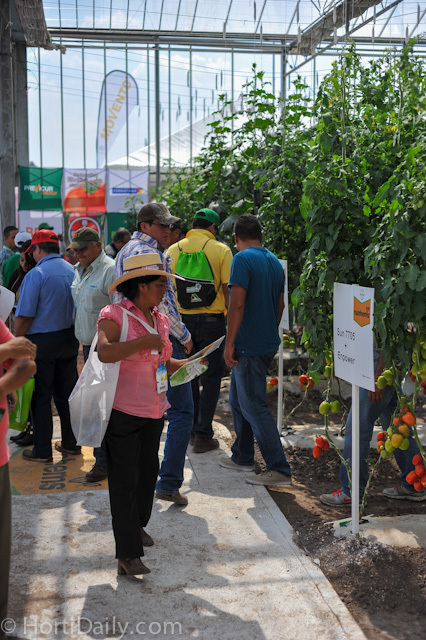 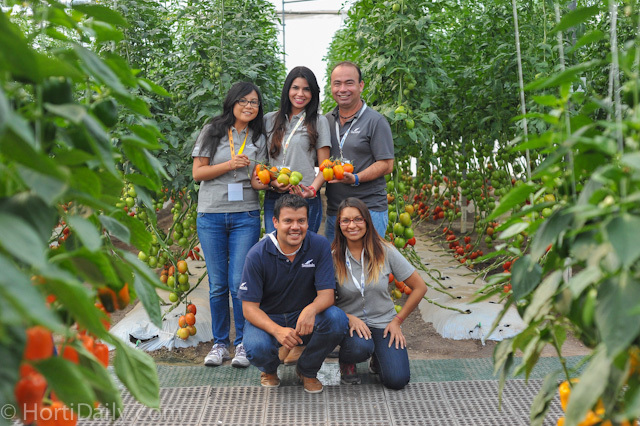 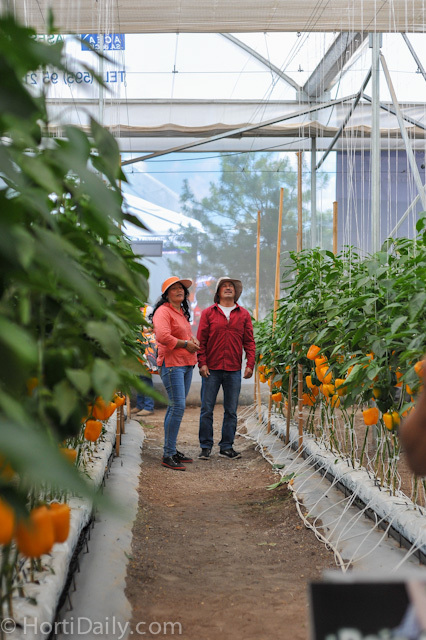 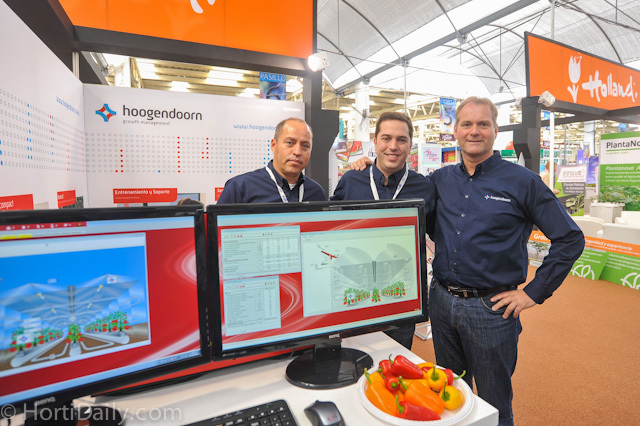 Hoogendoorn recently opened their Mexican training centre at the Agropark in Querétaroan, Mexico. 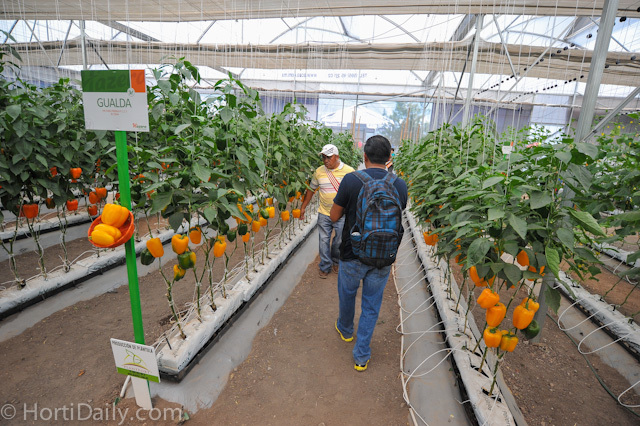 An article on this topic will follow later on HortiDaily.com. 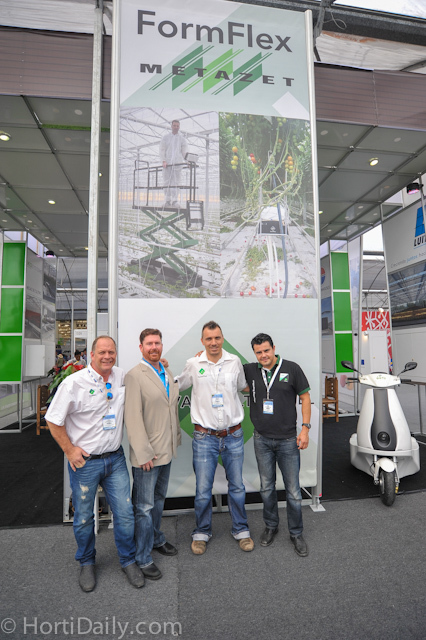 Edward Leyton of Leyton Greenhouse and supply and Marcel Schoondergang. 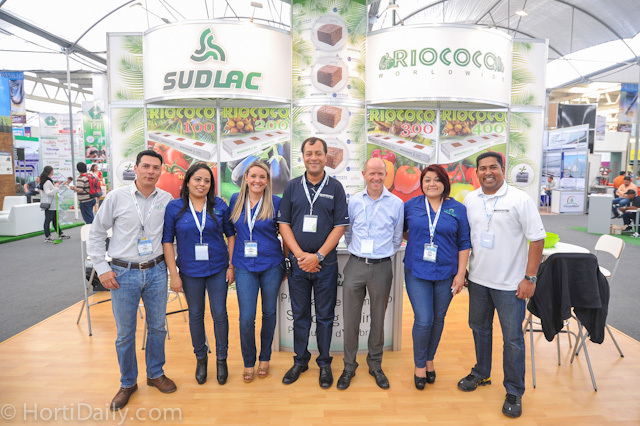 The team from Leyton Greenhouse and Suppply together with Marcel Schoondergangfrom Sudlac and Shan Halamba from Riococo. 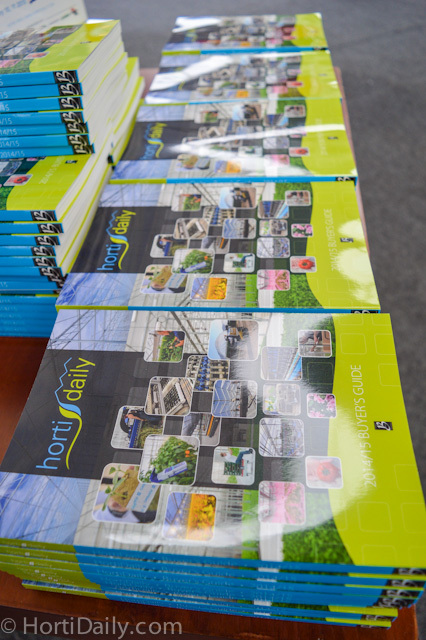 The HortiDaily Guides at the HortiDaily booth. 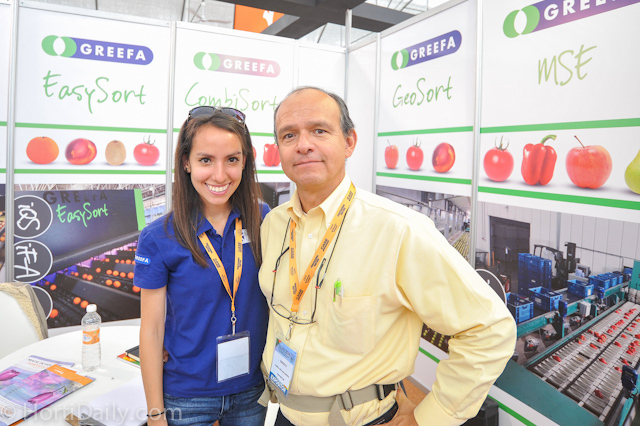 The team of Especialidades Agropecuarias Egloff, S. De P.R. 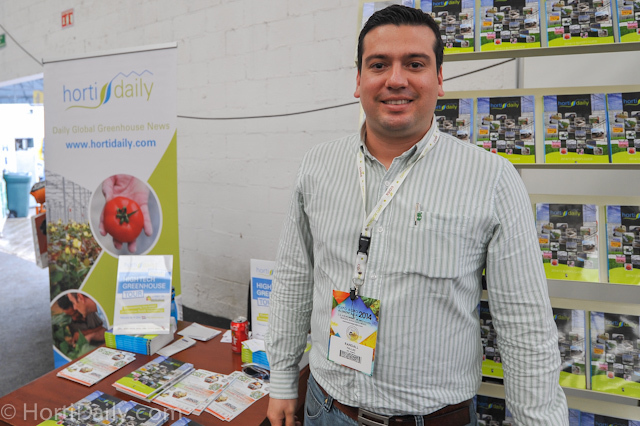 de R.L. 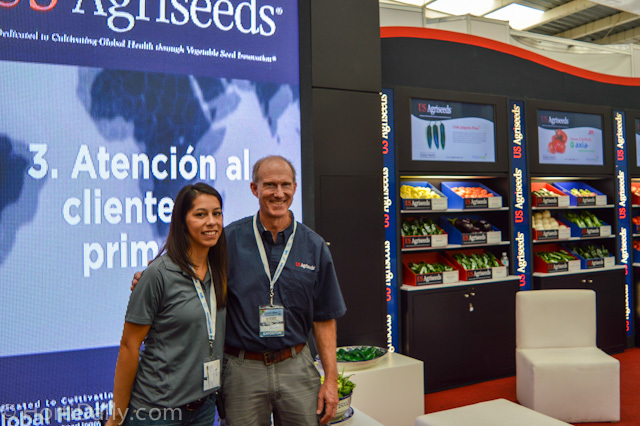 Mariel Aceves-Williams and Steve Coffey from US Agriseeds. 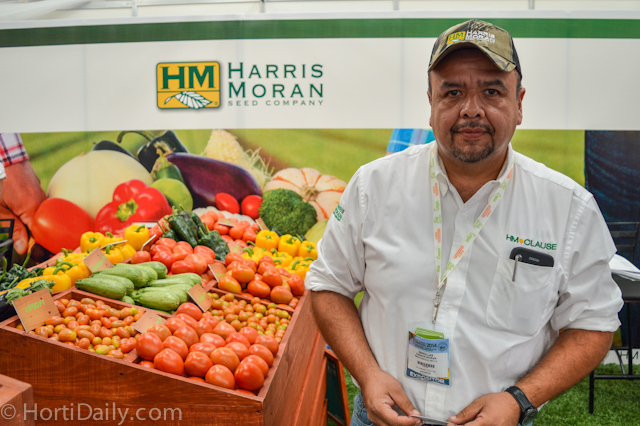 Oscar Sánchez from Harris Moran. 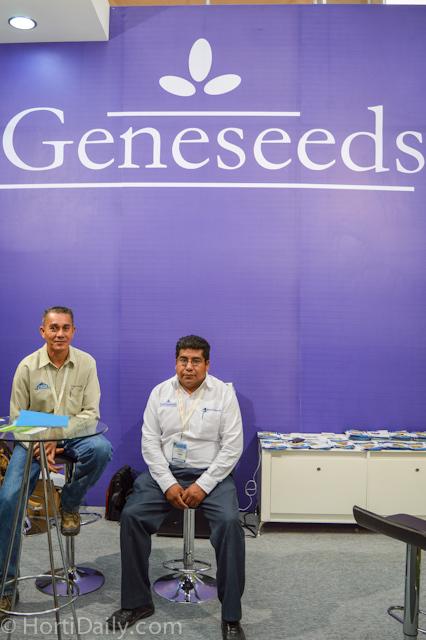 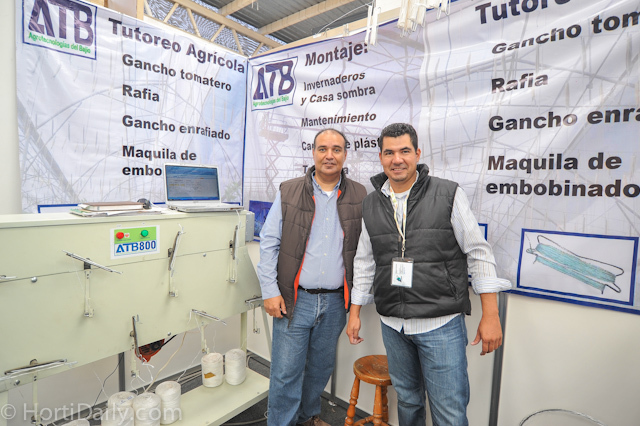 Juan A. Santiago Hinojosa and Roberto Garcia Ramírez from Geneseeds. 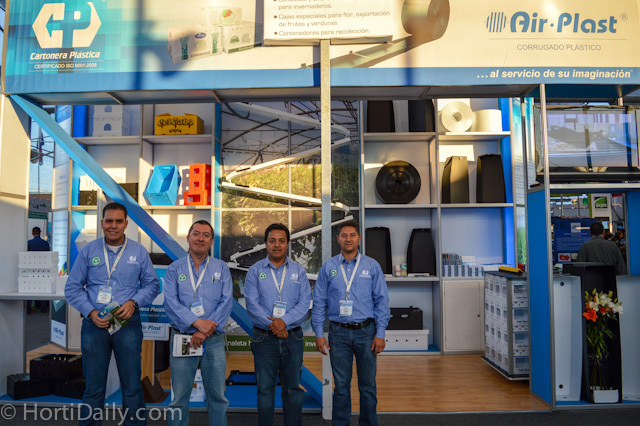 The team of North American Allied LLC. 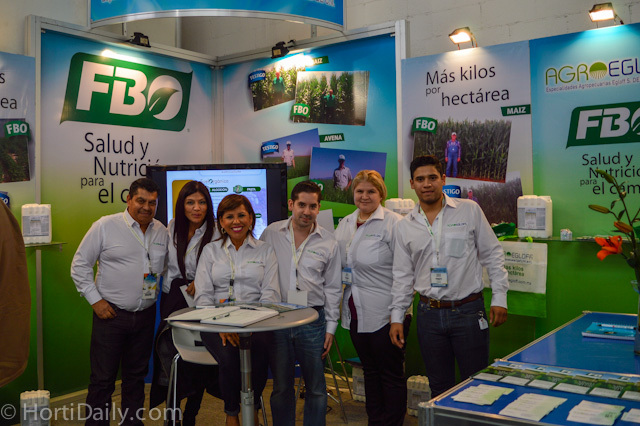 Julio Cesar Vázquez Domínguez, Hilda Vega Lóepz and Ana Patricia Castellanos from Fertilab. 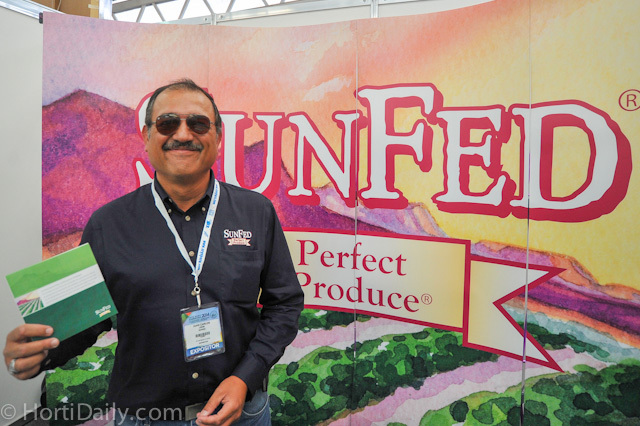 Pat Boleda from United Genetics Seeds CO.
Also Packaging company Labelpack was present. 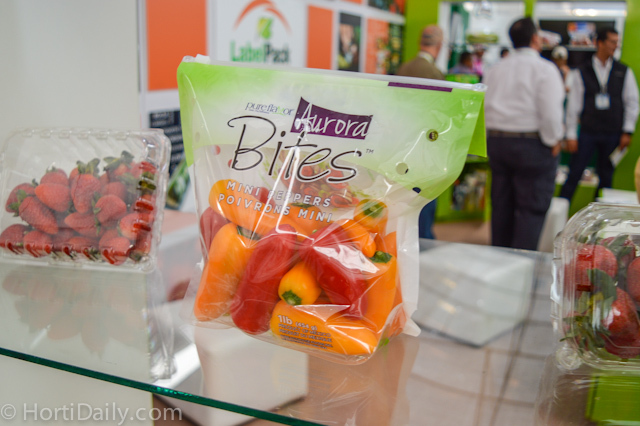 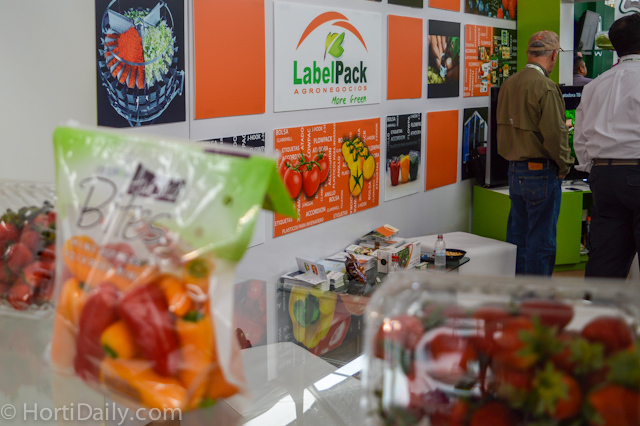 Innovative snack package from Labelpack. 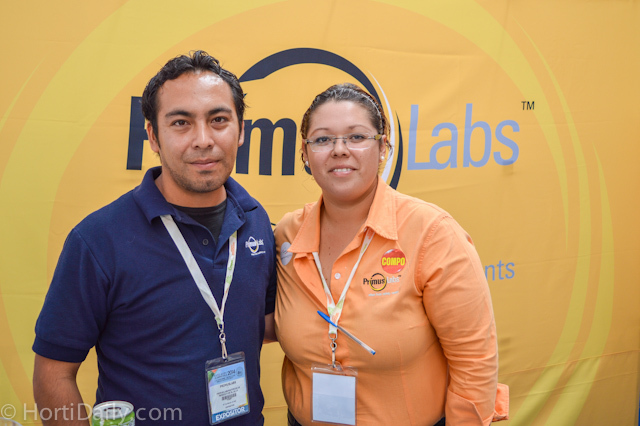 Giovani Gomez and Fernanda Hoata from Primus Labs. 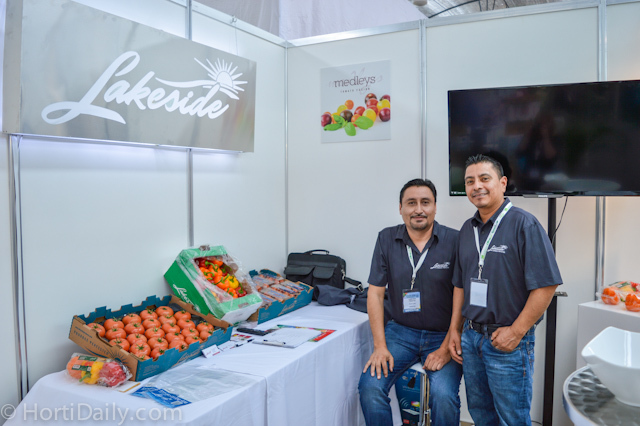 Nicolas Lopez and Jesus E. Ferro Lavenant from Lakeside. 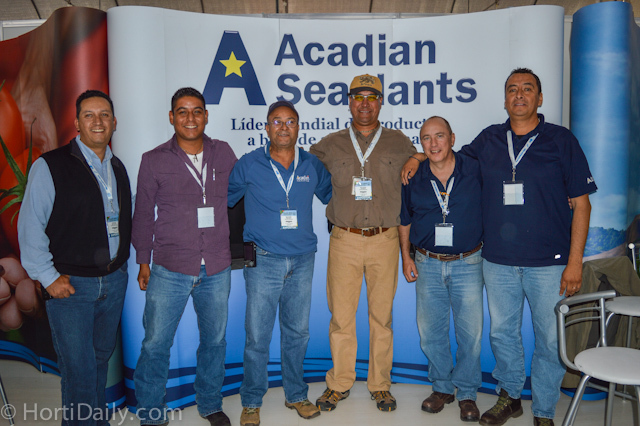 The team of Acadian Seaplants. 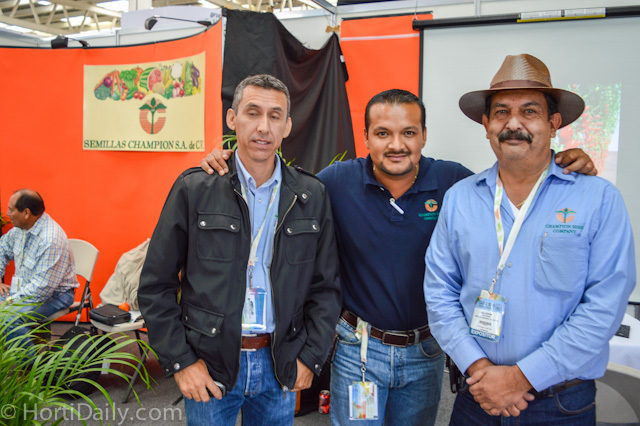 Victor H. Morato, Cesar G. Valdivia, and Baldemar Aguirre Ramirez from Champion Seed Company. 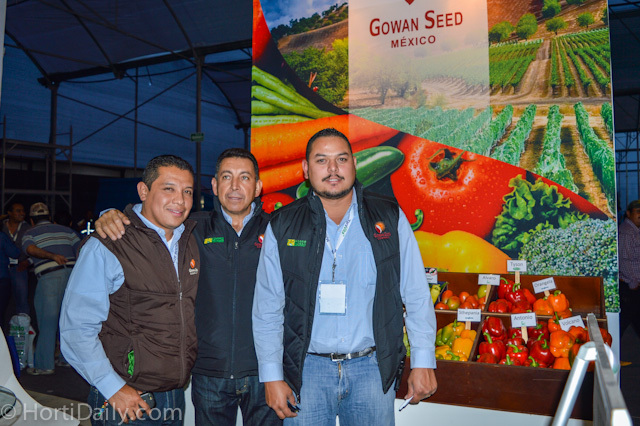 Juan Pablo Lara, Carlos Lawers H. and José Ramírez from Gowan Seed. 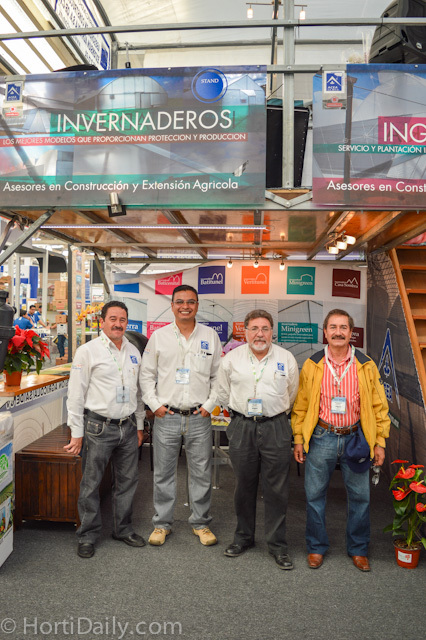 The team of Invernaderos Tecnológicos. 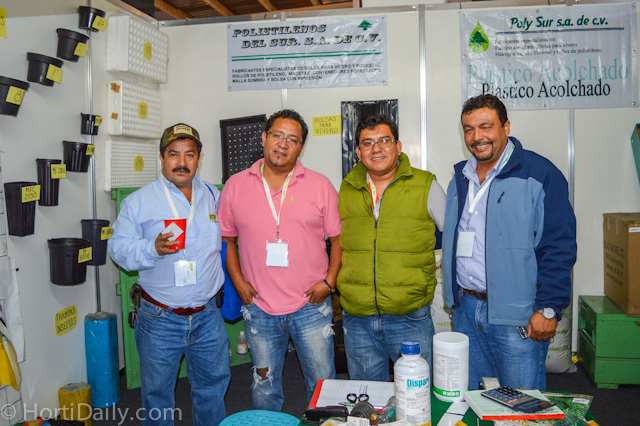 The team of Poly Sur S.A. de C.V. and Fertiliza in front of the Poly Sur booth. 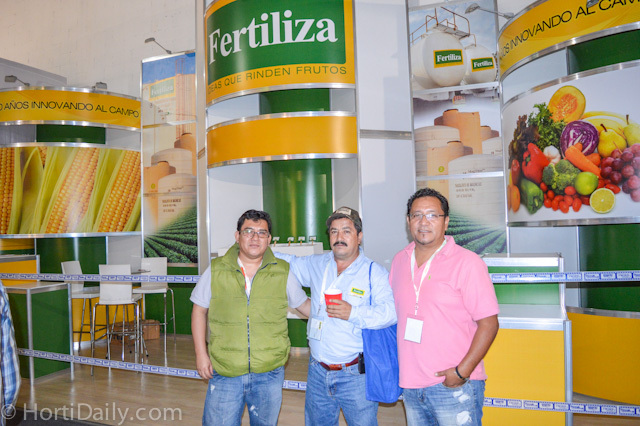 The team of Poly Sur S.A. de C.V. and Fertiliza in front of the Fertiliza booth. 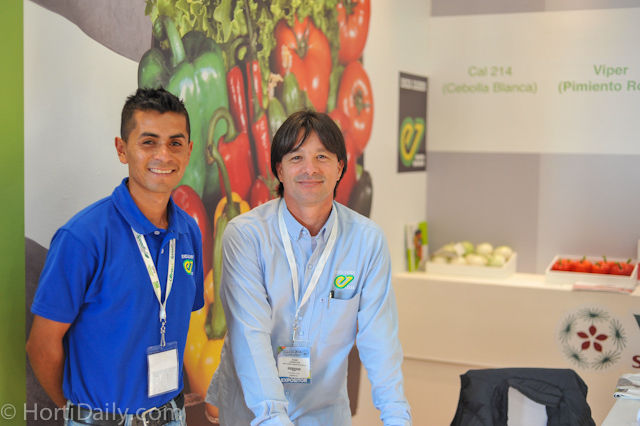 Shan Halamba from Riococo and Randall Fallas from Del Monte in front of the Hortidaily booth. 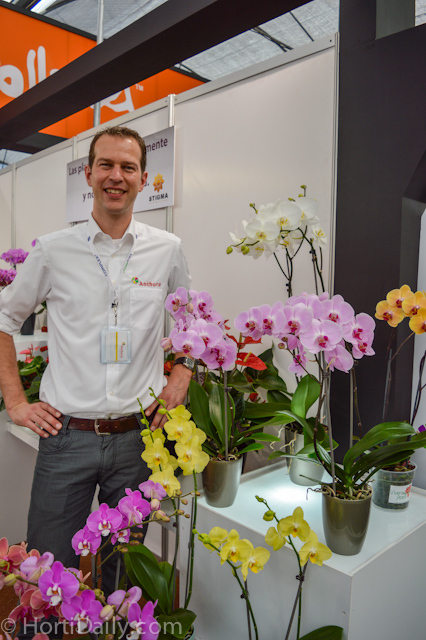 Marco Knijnenburg with Anthura's Phalaenopsis varieties. 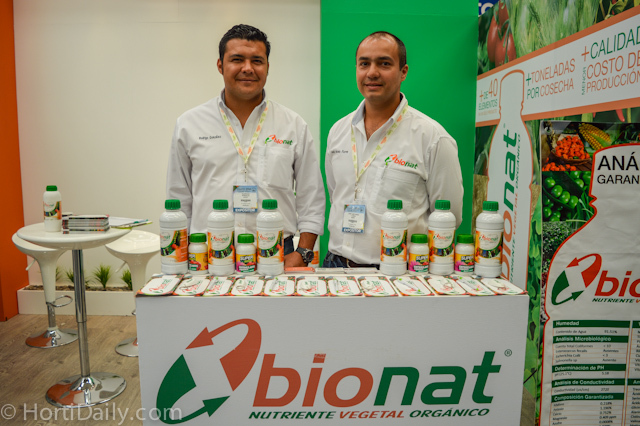 Rodrigo González and José Antonio Flores Carrasco from Bionat. 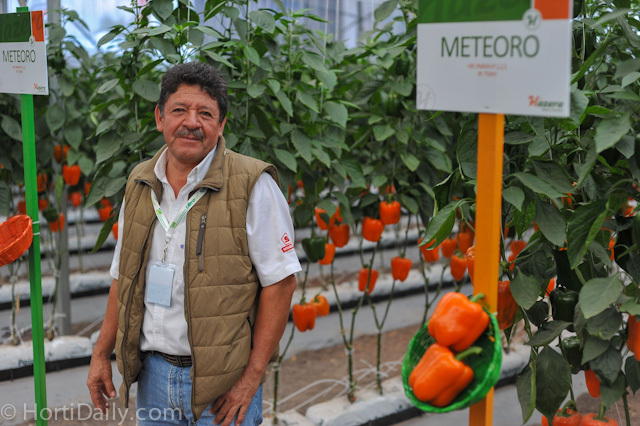 The pepper varieties at the demo greenhouse from De Ruiter and Seminis. 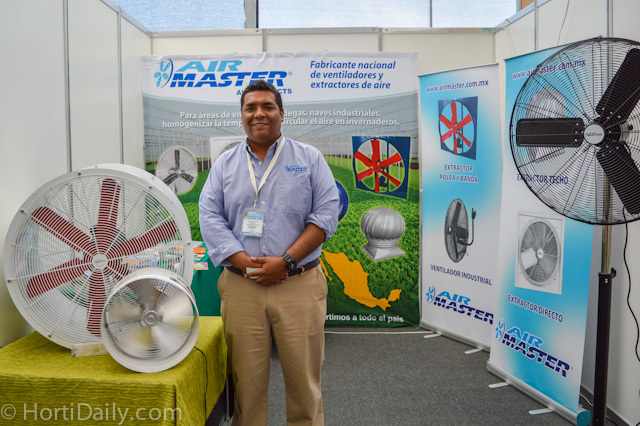 José Hipólito Salazar from Air Master. 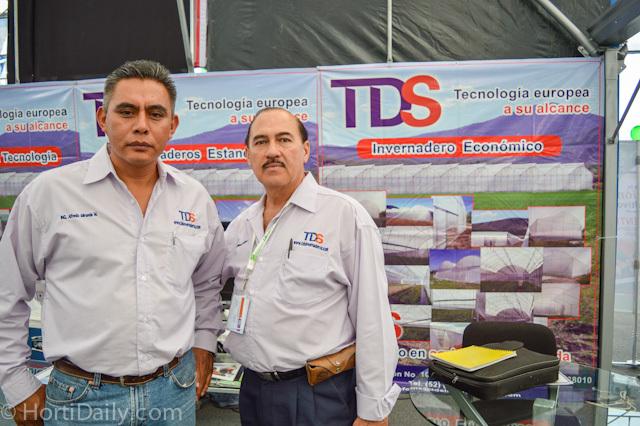 Alfredo Miranda Muñoz and Fuillermo González Fernández from TDS Invernaderos. 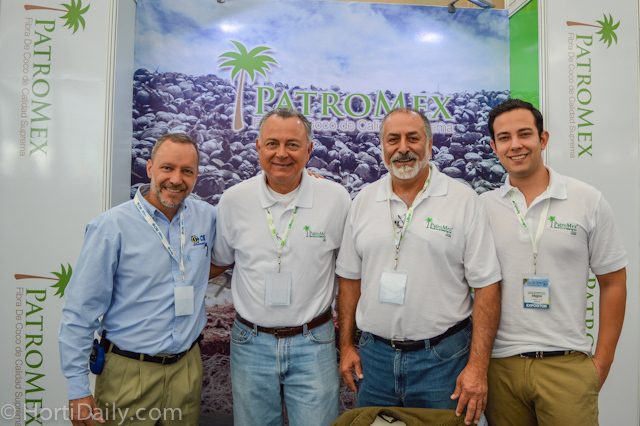 Manuel Loyo frmo CIU, Jorge Alfonso Peña Soberanis from PatroMex, Fank Chaves from Agro Fruits International, LLC, and Jorge Peña Robles from PatroMex. 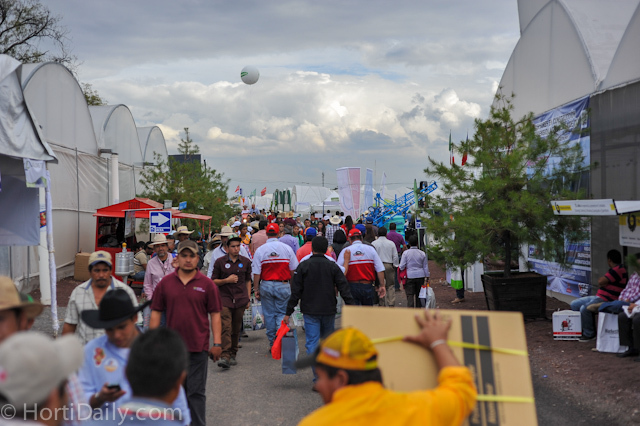 Also at the stands outside it was very crowded. 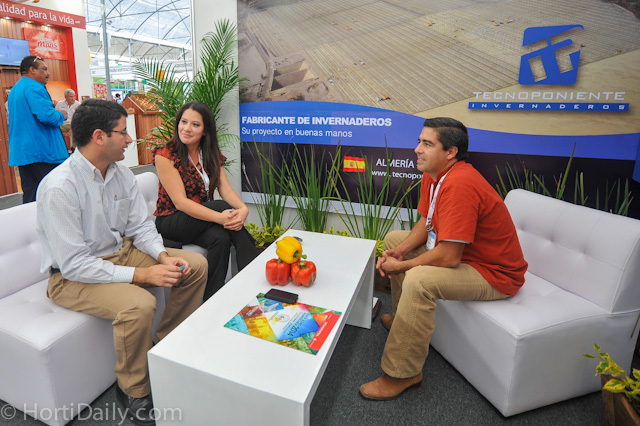 Iris Castillo, Roberto del Toro Torres, and Juan Jose Corina from Haygrove Tunnels. 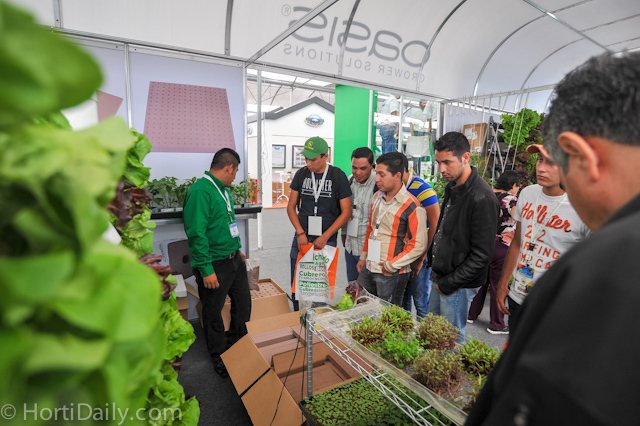 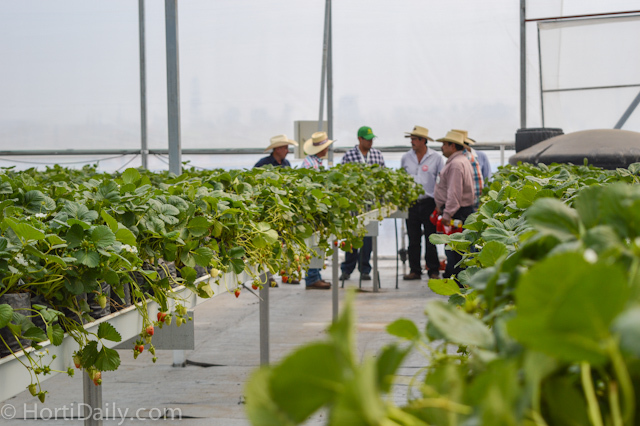 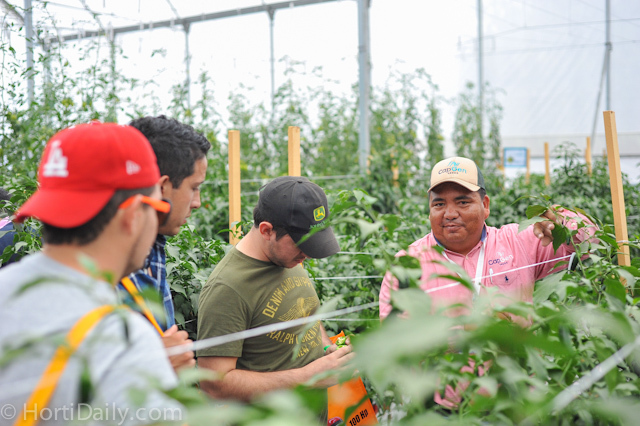 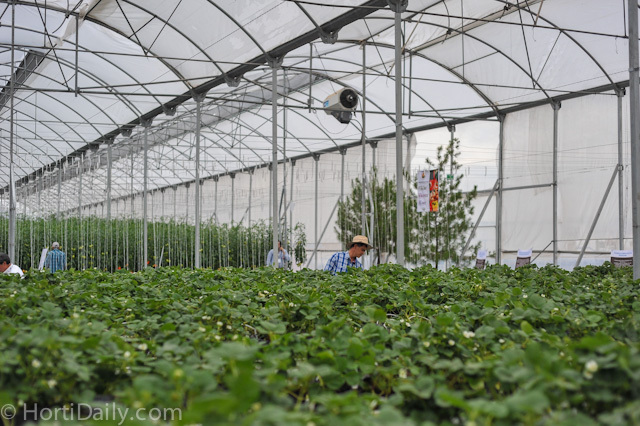 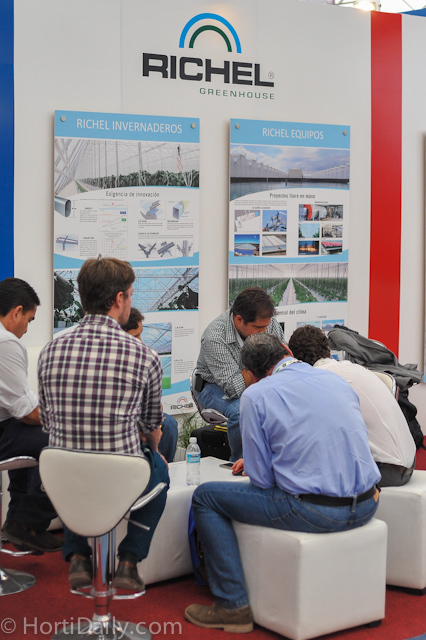 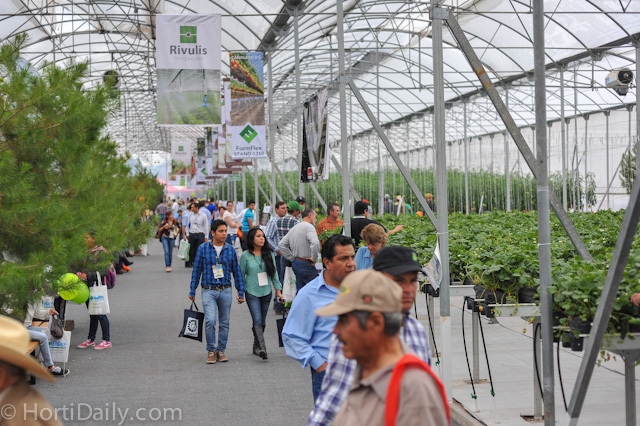 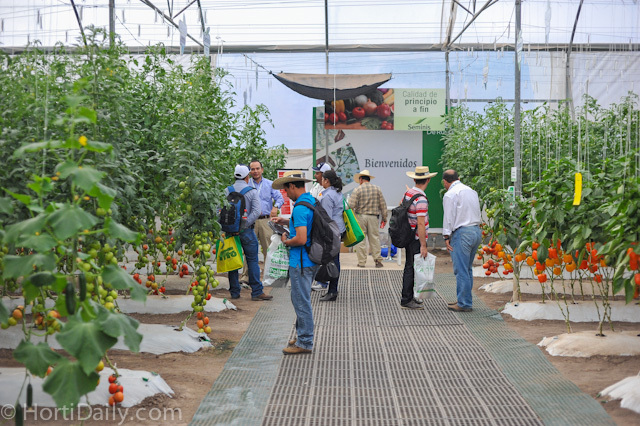 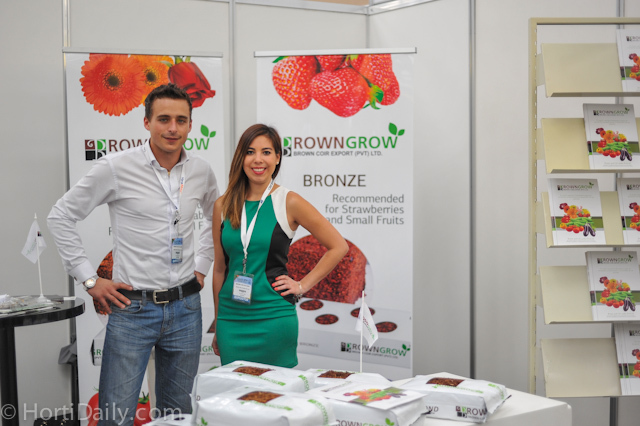 Mexican growers participating a workshop about the production of greenhouse strawberries. 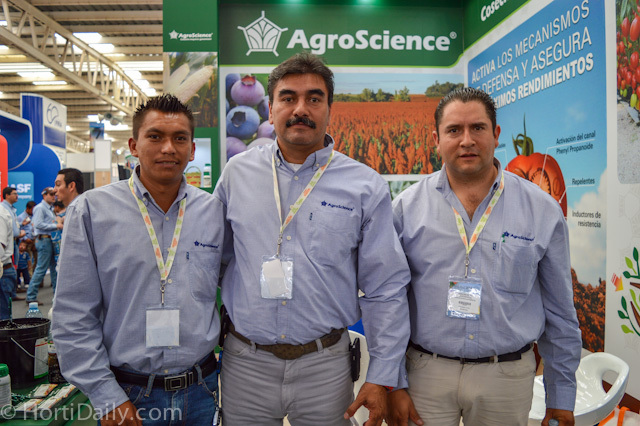 Oscar Jiménez Guzmán from Insustrias Osmosistemas S.A. de C.V.
Francisco Carbajal from Enium S.A. de C.V.
Diana Macias Echagaray from Agrícola Genética, S.A. de C.V.
Victor Manuel, Javier Daniel Morán Escoto, and Julio Ángel Malvaez Reyes from AgroScience. 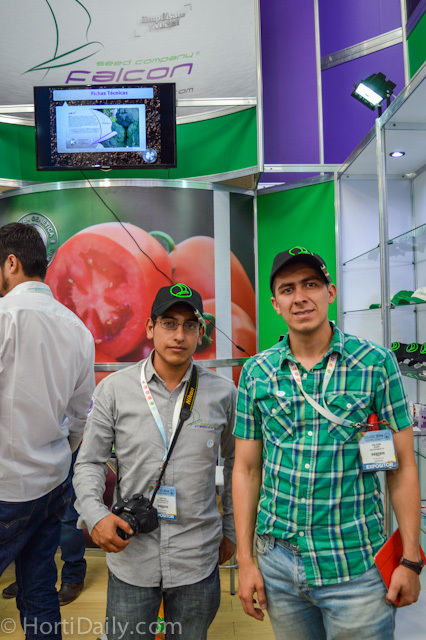 Luis Eduardo Ruiz Pérez, José Arturo Urrea Salcedo, and Omar David Yáñez Sicairos from Phytomonitor. 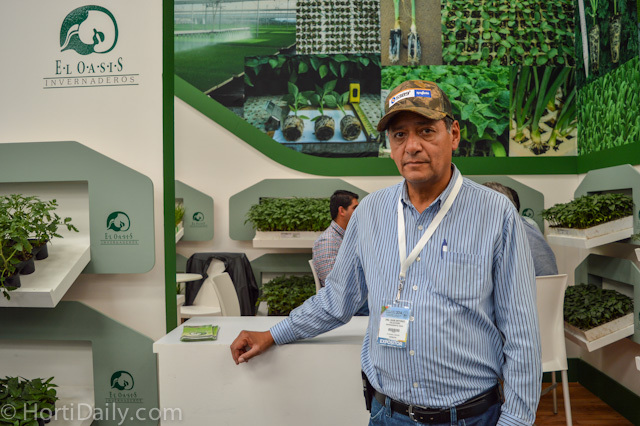 Juan Antonio Valdivieso from El Oasis Invernaderos. 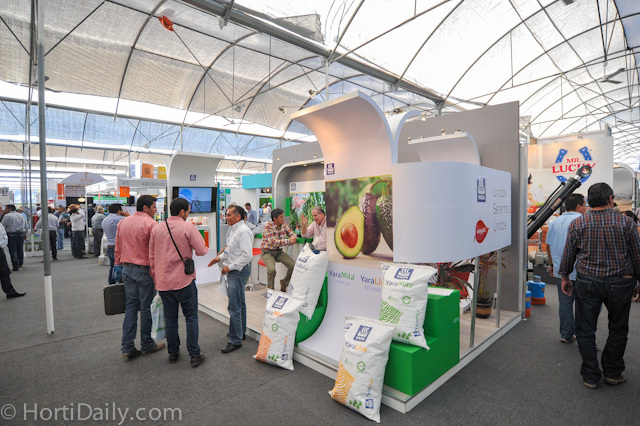 US Agriseeds showcased their products at their booth. 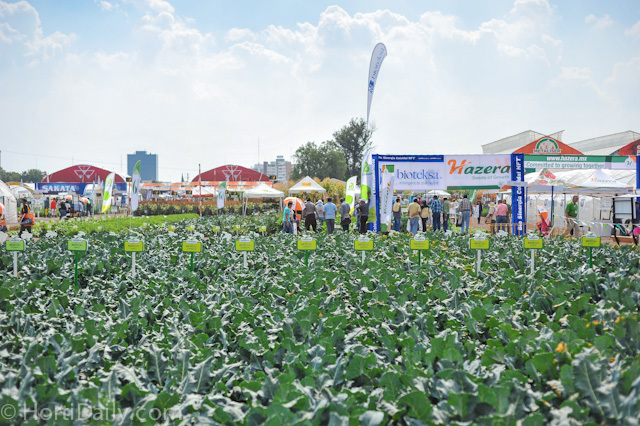 The seeds of Berentsen are showed at this demo field. 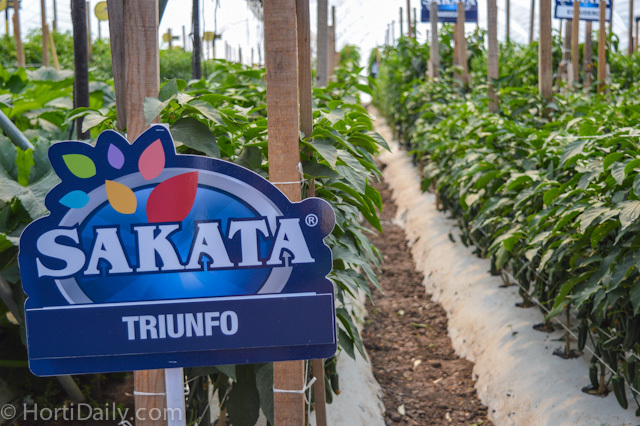 The varieties of Sakata showcased in a demo greenhouse. 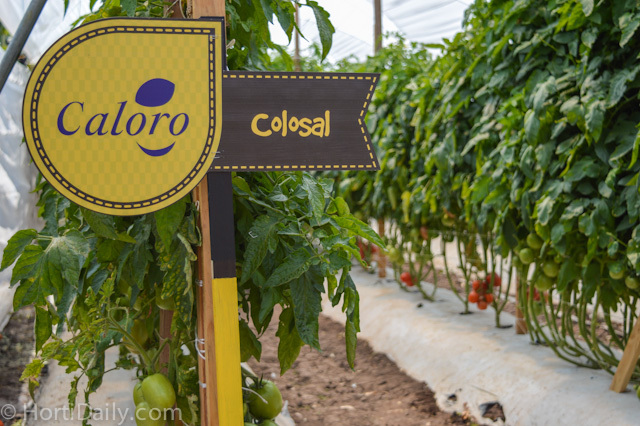 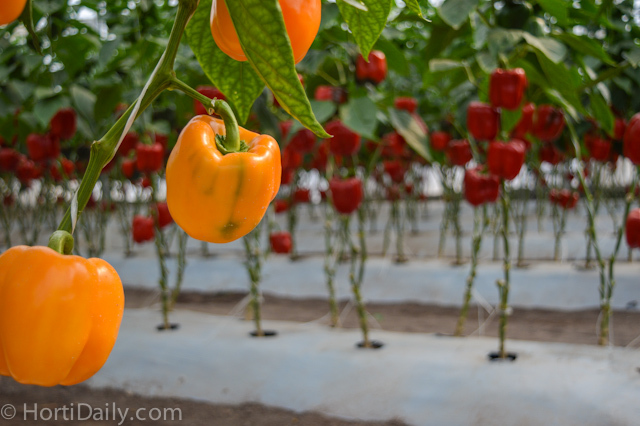 The varieties of Caloro showcased in a demo greenhouse. 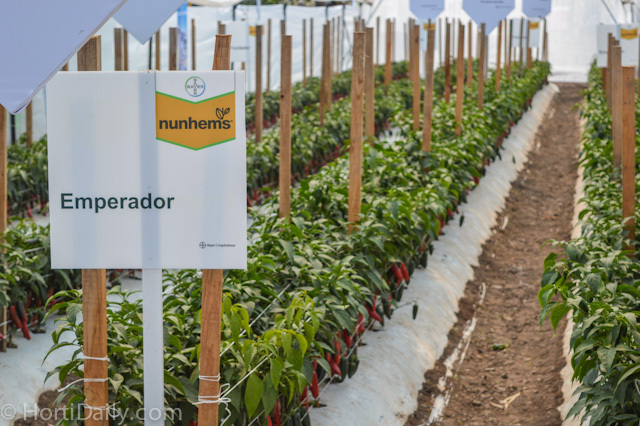 The varieties of Nunhems showcased in a demo greenhouse. 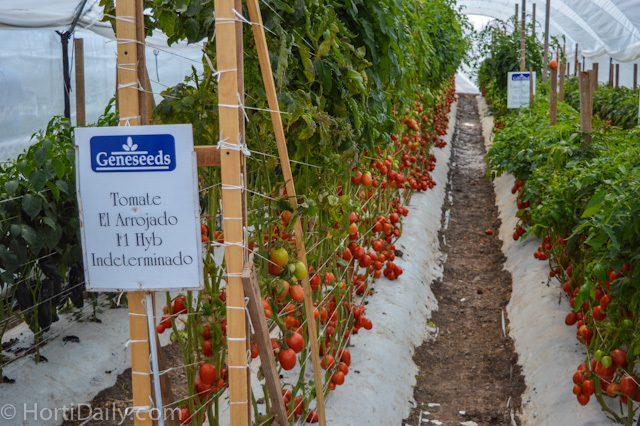 The varieties of Geneseeds showcased in a demo greenhouse. 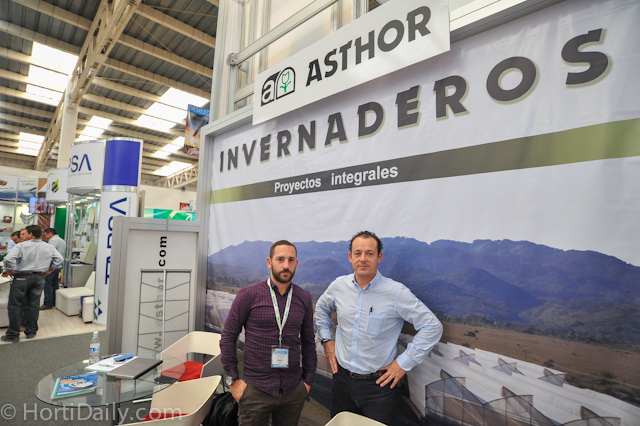 Javier Polo and Andrés Gutiérrez Guzmán from Imaas Invernaderos. 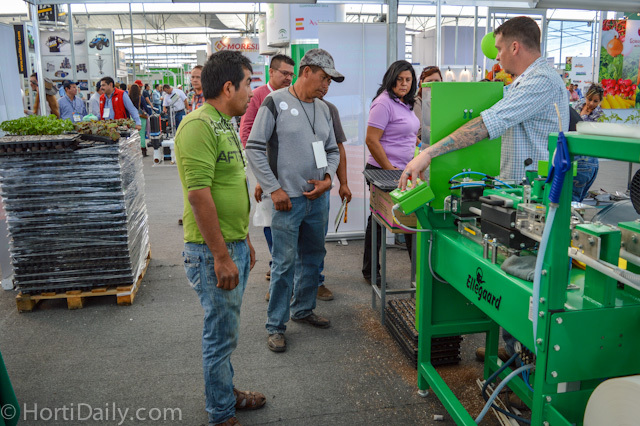 Tim Larsson showing the Ellepot machine to the Mexican growers. 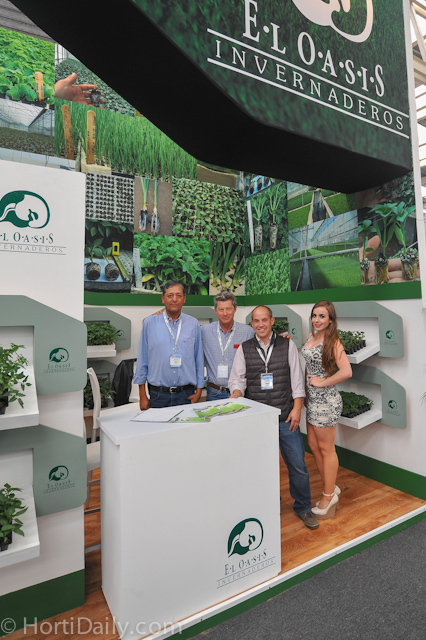 An interview with them will follow on HortiDaily.com. 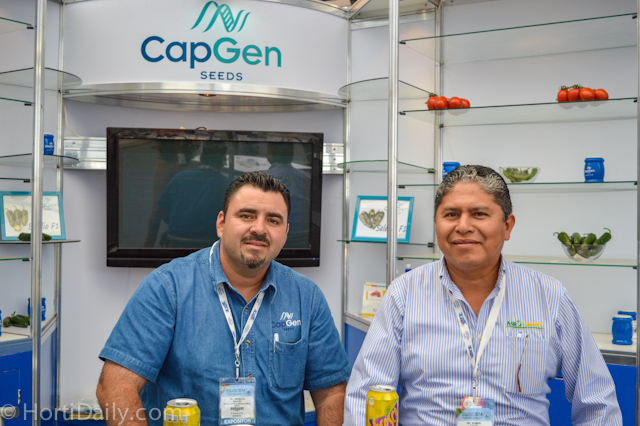 Ernesto Magaña Félix from GapGen Seeds and Rubén Araoz Maldonado from Agro-Smart. 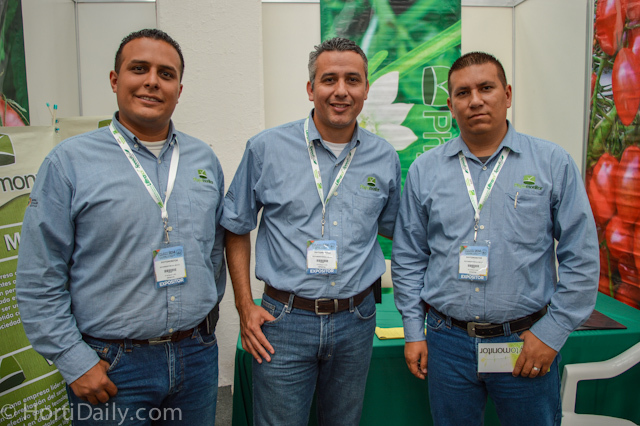 Luis Mario Martínez, Gabriel Díaz Flores, and Francisco Javier Ramírez from Univar Environmental Sciences. 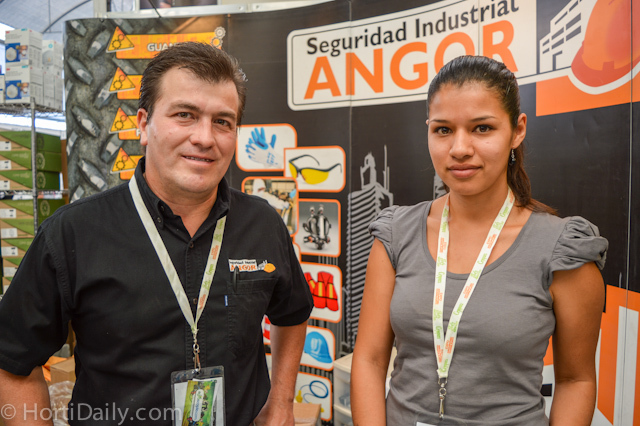 Salvador Cano Angel and Ana Karen Ramirez Patiño from RC Tools. 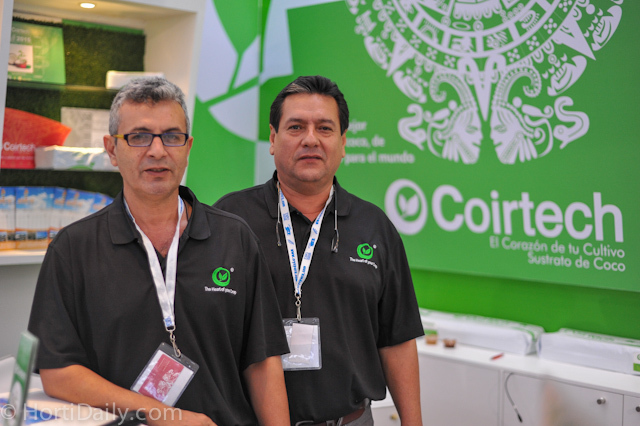 Antonio Torres, Alberto Martínez, Eduardo Sánchez, and Gilberto Godoy from Cartonera Plástica.